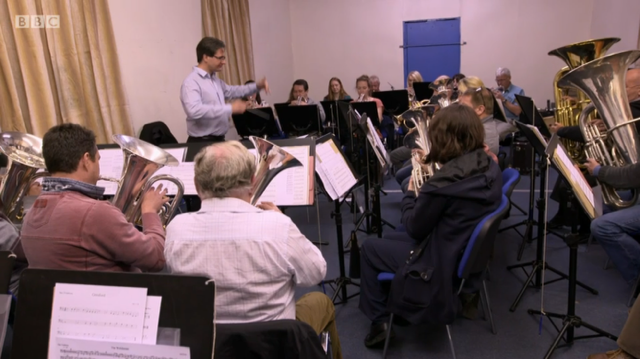 Lewis Merthyr were delighted to welcome an international guest to rehearsal recently, in the form of Associate Professor Artem Ananiev of the famous Tchaikovsky Conservatoire in Moscow, Russia. 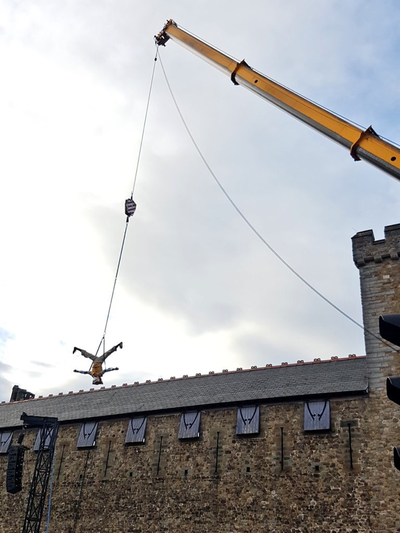 Professor Ananiev was visiting Wales in connection with a project marking the 150th anniversary of the founding of the city of Donetsk - formerly Hughesovka (literally translated “Hughes’ Town”) - in Imperial Russia, by Merthyr Tydfil industrialist John Hughes in 1869. 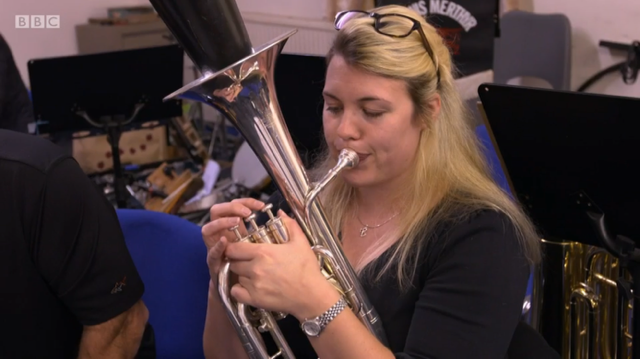 The project included a workshop with Symphonic Brass Wales on a transcription for brass of Professor Ananiev's score to Russian film pioneer Dziga Vertov's movie "Enthusiasm: The Symphony of Donbass", which was filmed in 1930's Hughesovka. 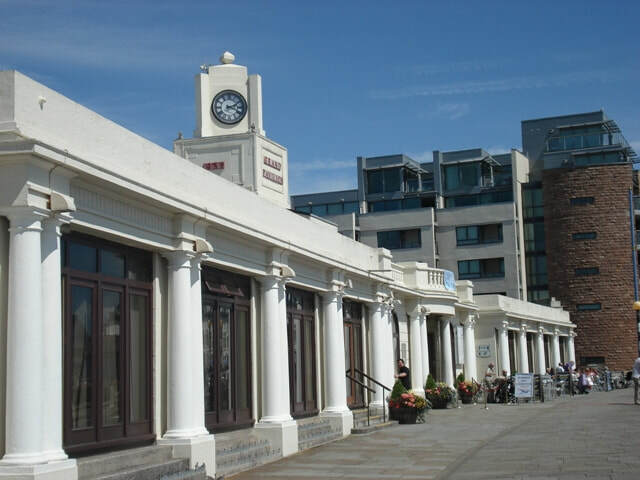 Other activities included the premiere of the Russian language film "Donbass Borderland" at Chapter Arts, Cardiff and a visit by the project team to the Hughesovka depository at the Glamorgan Archives. 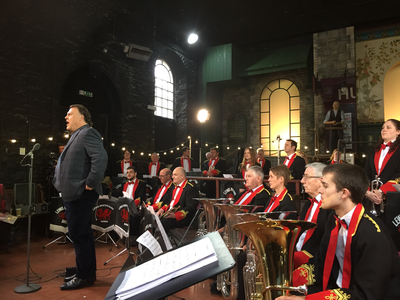 Professor Ananiev's visit to Lewis Merthyr included a visit to the former Lewis Merthyr Colliery, now Rhondda Heritage Park, and then an evening with the band, experimenting with and exploring the sounds, colours and technical capabilities of the modern brass band. 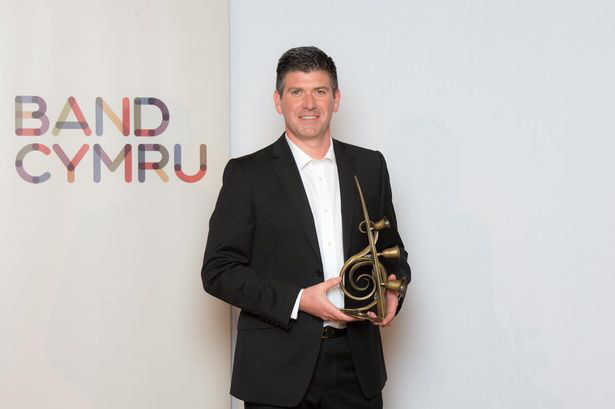 Lewis Merthyr Musical Director Craig Roberts stated "We were delighted to welcome to welcome Professor Ananiev to the Rhondda and Wales this week, and wish he and his team safe travels home. We look forward to welcoming him back to Wales again, and to performing some of the resultant music from this visit soon". Lewis Merthyr Band will again be featured on BBC television in an additional screening of Episode 2 of "The Taff: The River That Made Wales" with Will Millard, which will be screened on BBC Four again on Thursday April 4th. The episode features the band and interviews with Trustee Ivor England - a former miner at the Lewis Merthyr Colliery - plus Musical Director Craig Roberts and additional members of the band. The band enjoyed a tremendous few days in North Wales this weekend performing at the William Aston Hall, Wrexham in the Welsh Regional Championships on Saturday March 16th, and performing a super concert for a wonderful capacity audience with the Fron Male Voice Choir at Llangollen Pavilion on Sunday March 17th. 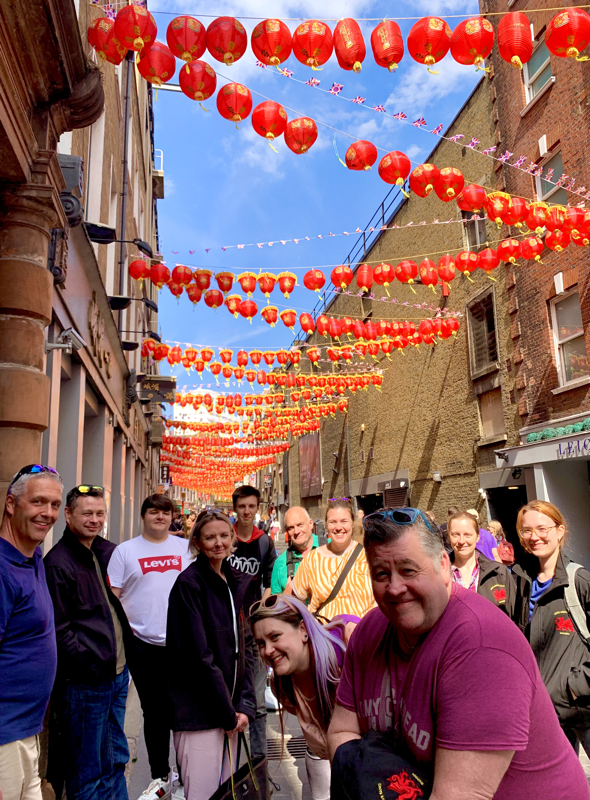 We spent a great couple of days away socialising, and sharing a few lemonades also. 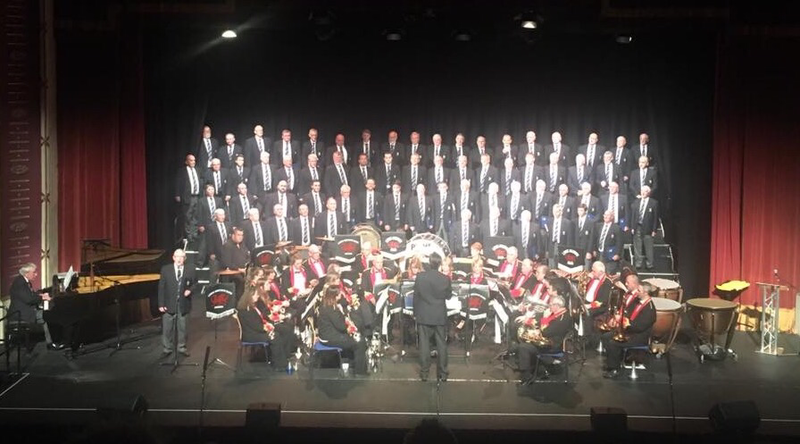 Huge thanks go out to all who supported the excellent joint concert at Llangollen, and to our new friends at the Fron Choir, who we very much look forward to performing with again soon. 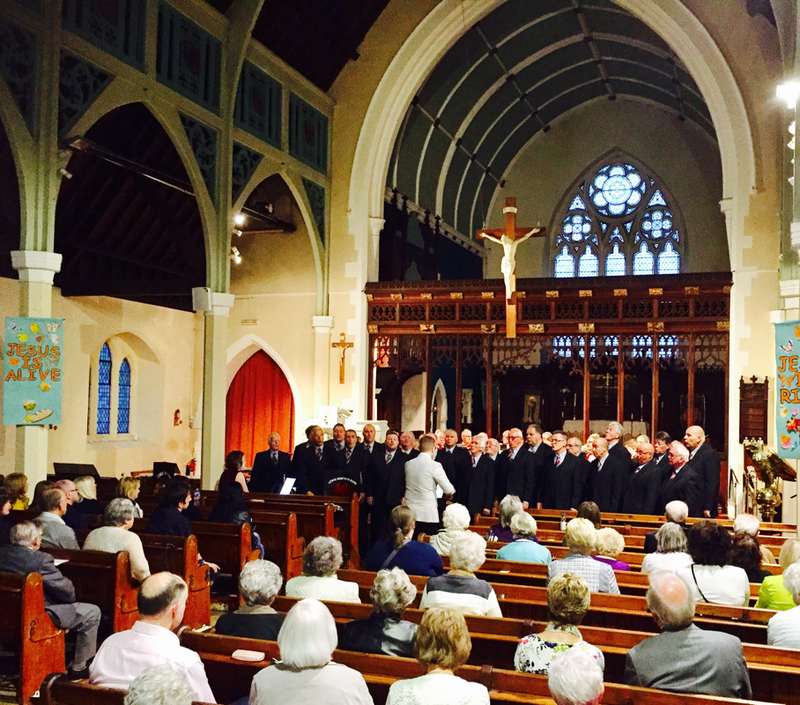 It was wonderful also to have members of Llangollen Male Choir perform with us also, as they strive to resurrect their choir and recruit new membership, something we've hopefully assisted in raising awareness of. ​Our biggest thanks however goes to each of our members for all their tremendous hard work and commitment throughout this weekend and in the preparations building up. 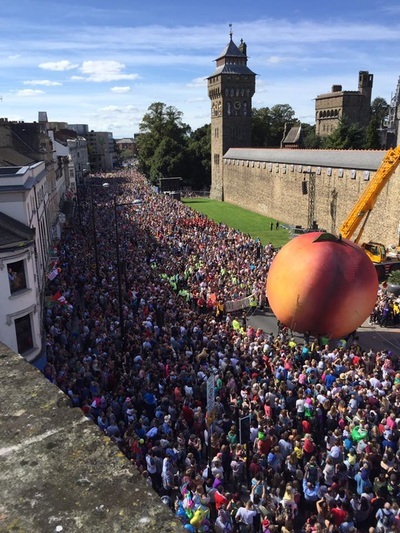 Diolch yn fawr - diolch o galon i bawb. 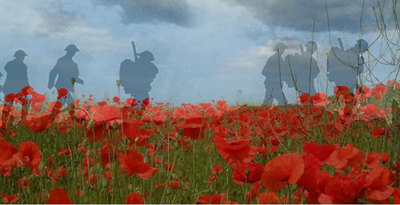 A massive thank you once again to all. 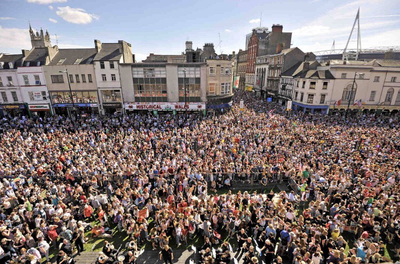 We look forward to returning to North Wales again sometime soon. 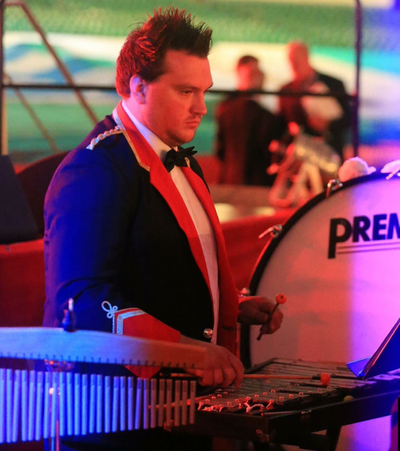 The bandmembers will be sporting a new look this weekend in North Wales as we retire our well-worn navy blazers for all new black, red & gold soft shell jackets. 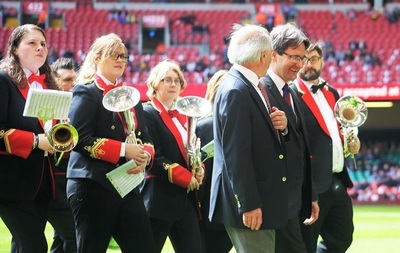 The new jackets were purchased from specialist band uniform manufacturers Fanfare North, suppliers of the same jackets to the world famous Grimethorpe Colliery Band. 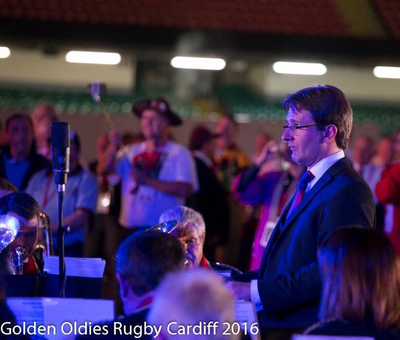 The jackets bear our newly designed logo, depicted here, and designed especially for the band by Huish Design, designers to the Welsh Proms. 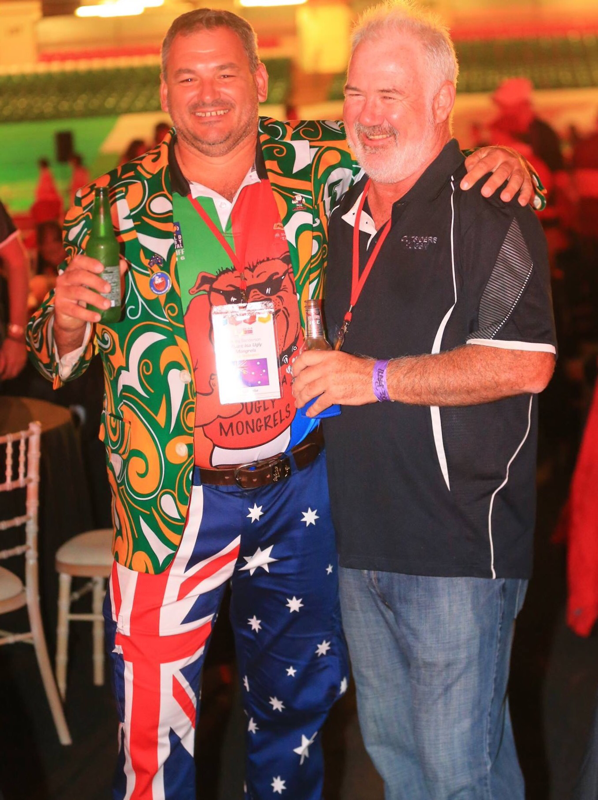 The band look forward to sporting our new "walking out" uniform off stage, while retaining our now matching black, red & gold stage jackets for performance. 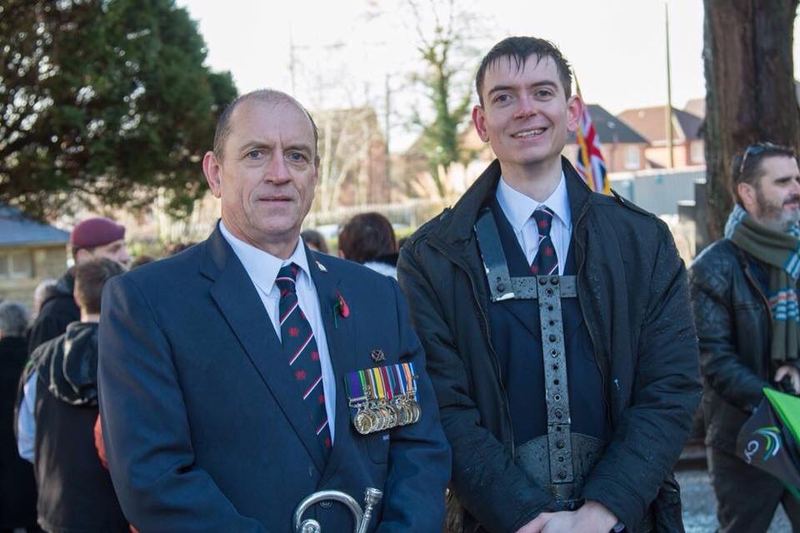 Huge thanks to Huish Design and Fanfare North for excellent products and service, and to the Rhondda Calendar Fund for their donation which assisted in the purchase of the walking out uniforms. 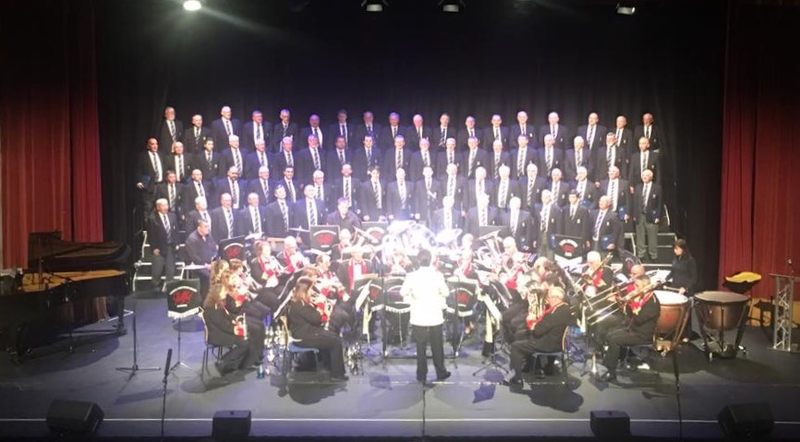 The band will be travelling to North Wales to perform in the Welsh Regional Championships at the William Aston Hall, Wrexham on Saturday March 16th, and in concert with the famous “Voices of the Valley”, the Fron Male Choir, at the iconic Llangollen Pavilion, on Sunday, March 17th. 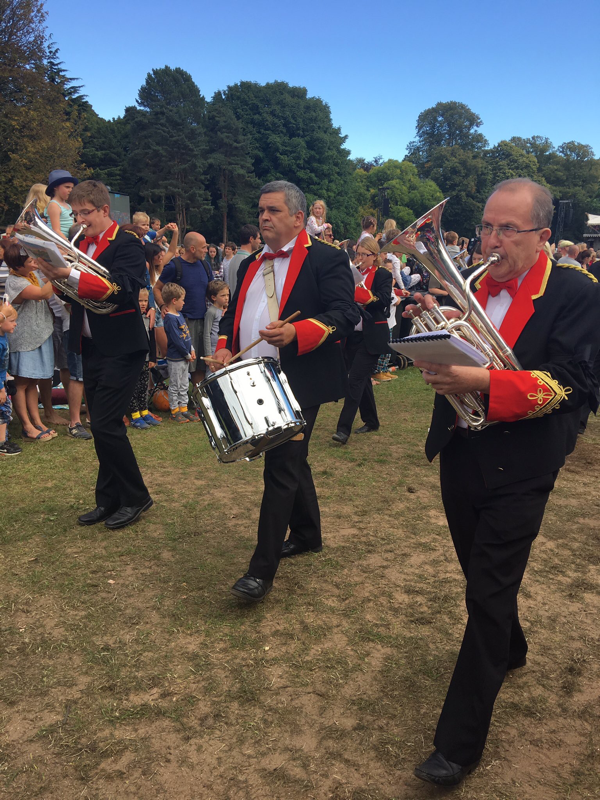 Following the Llangollen Choir’s unfortunate situation of dwindling membership and search for a new Musical Director & Accompanist were reported, the band reached out to them and asked them to join us in performance on the famous Pavilion stage. Happily the choir has now seen progress made, with their MD role filled and a number of offers of support for the accompanist position. Mere weeks after their possible demise was reported then, with these roles filled and a number of expressions of interest and potential new avenues for recruitment, there’s now potential light at the end of the tunnel for the 40 year old North Wales choir. 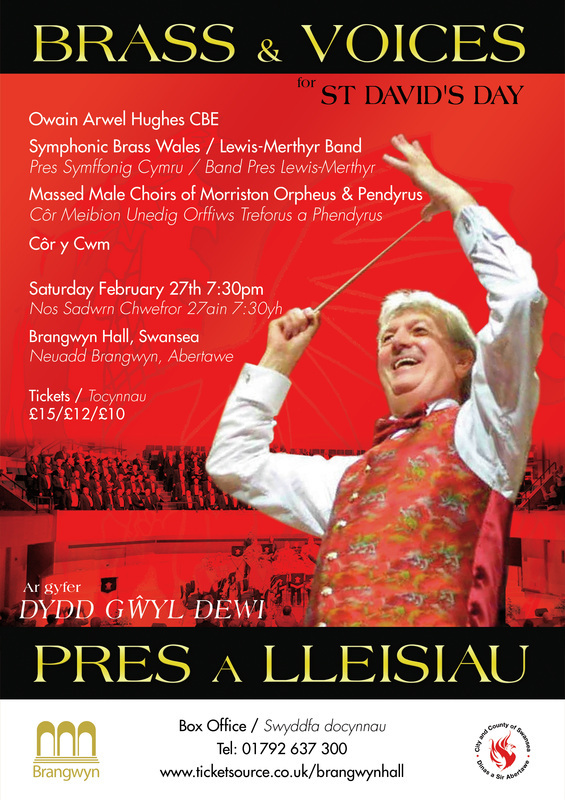 Lewis-Merthyr will feature in two of our popular Brass & Voices concerts in both North & South Wales this March. 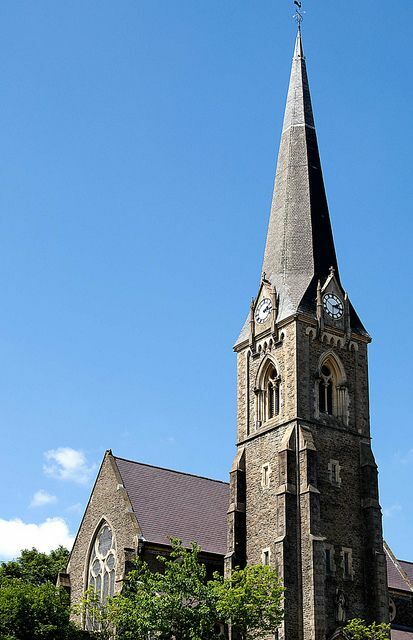 Firstly the band will perform on home turf at the "Cathedral of the Rhondda", St Peter's Church, Pentre on Thursday March 7th, together with The Richard Williams Singers and the award winning Cor Ysgol Gynradd Gymraeg Llwyncelyn. On Sunday March 17th, Lewis Merthyr will then travel to North Wales to perform with the famed "Voices of the Valley", the Fron Male Choir, in concert at the iconic Llangollen Pavilion. 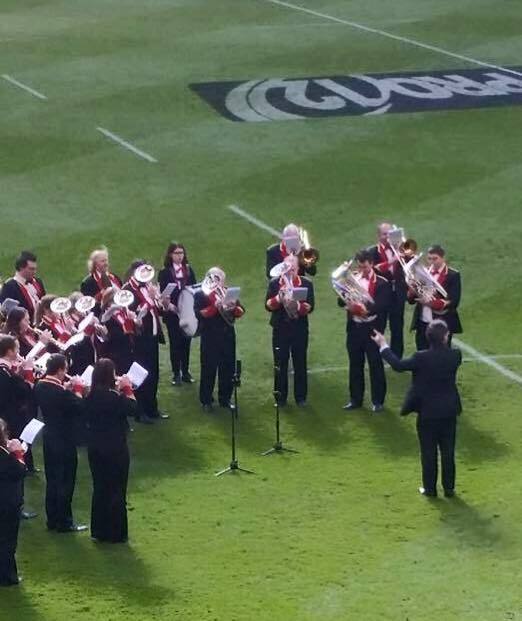 Lewis Merthyr Band were delighted to once again work with the Welsh Rugby Union, performing for the Wales vs England Six Nations Women's Rugby International at Cardiff Arms Park on Sunday February 24th. 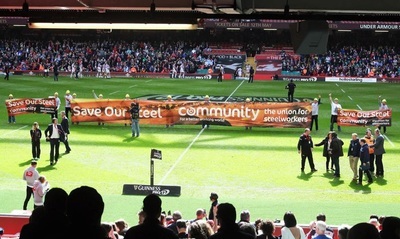 The band performed a selection of pre-match entertainment items and the national anthems, together with the Cardiff Blues Choir, under the collective batons of WRU Director of Music Dr. Hayden James and Lewis Merthyr Musical Director Craig Roberts. 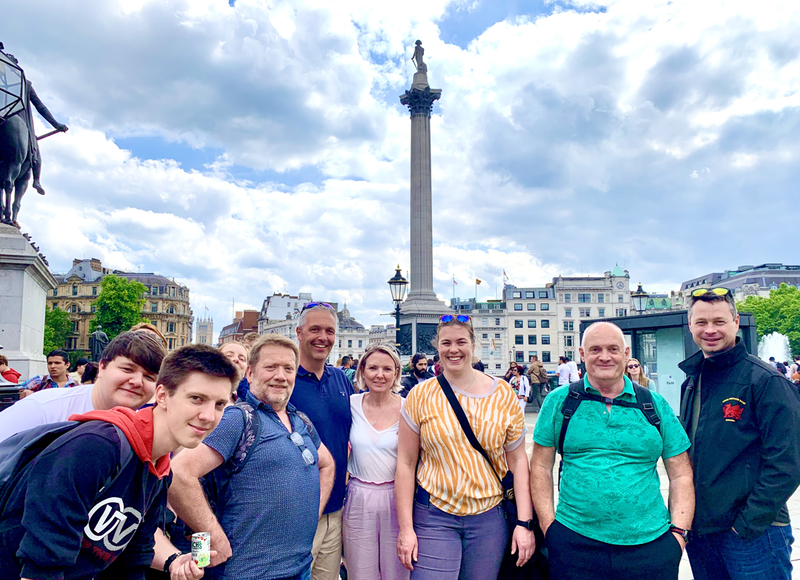 We were delighted to welcome Harald Hepner, Principal Conductor of the Stadtorchester and Director of the Musikschule from Rhondda Cynon Taf's twin town of Ravensburg, Germany to the band this week. 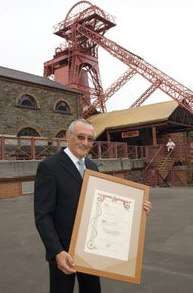 Herr Hepner led the band through a series of works in rehearsal, before then visiting the former Lewis-Merthyr Colliery, now Rhondda Heritage Park, and meeting with the Leader and Deputy Leader of Rhondda Cynon Taf County Borough Council at the Mayor's Parlour in Pontypridd the following day. 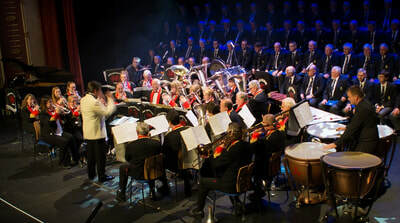 Lewis Merthyr looks forward to developing a lasting relationship between the band and both the Stadtorchester & Musikschule together with Harald, and to playing our part in developing and raising awareness of the wider twinning links between Rhondda Cynon Taf and our various twin towns in Germany and France. 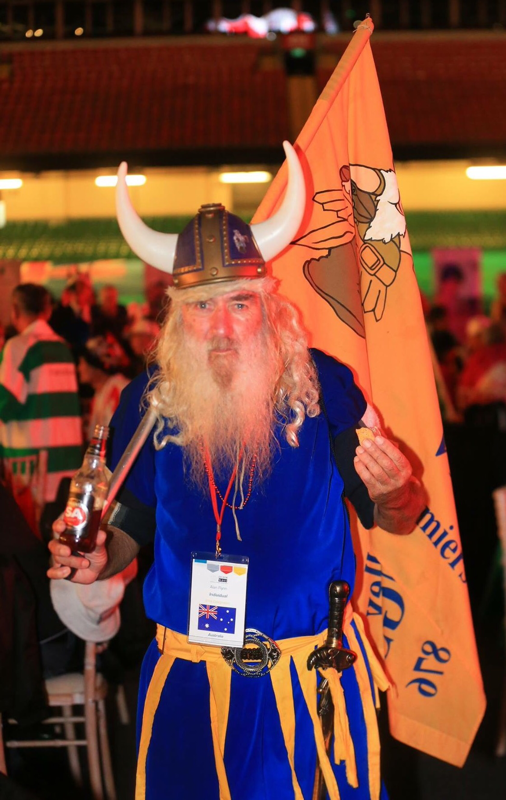 Further information on developments with the twinning relationship will be posted here soon. ​Blwyddyn Newydd Dda - Happy New Year! 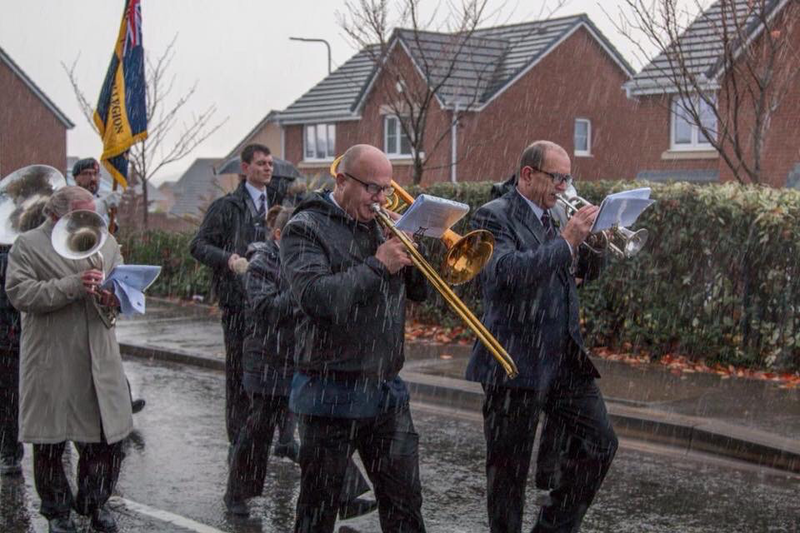 By the time Christmas Day came around, Lewis-Merthyr Band had undertaken 18 Christmas engagements in and around our local community this December. 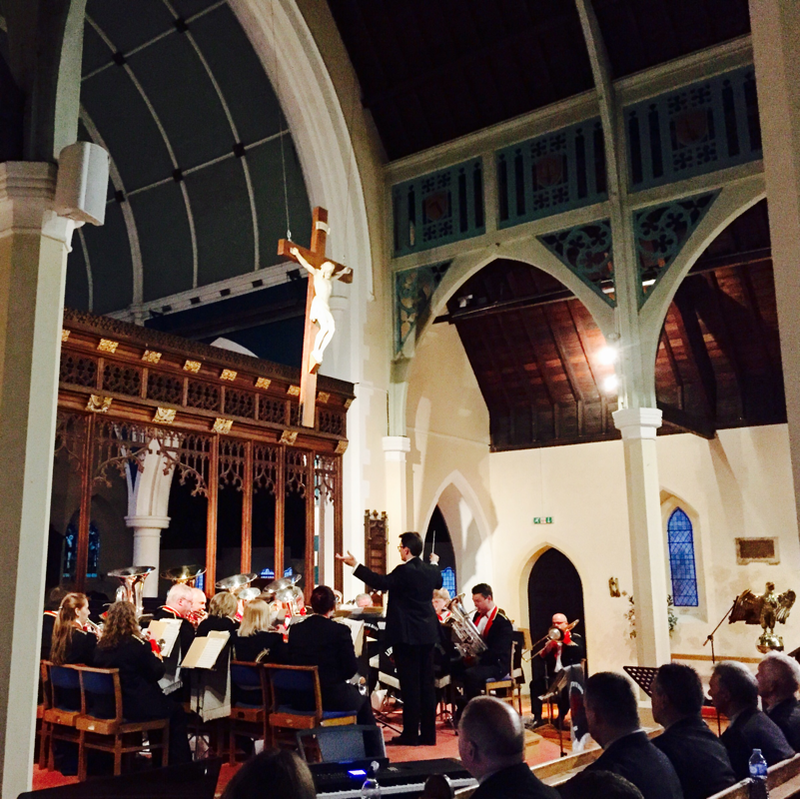 Among these were two very well-received performances of our festive concert "The Wonder of Christmas" at All Saints, Penarth and St Catherine's, Pontypridd. These took place together with Victoria Voices Children's Choir, Penarth & Llandough Hospital Staff Choir, The Richard Williams Singers and members of Côr Y Cwm. 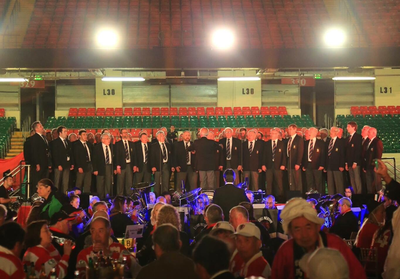 Additional performances included The Christmas Event at Tonyrefail, the 40th Anniversary Concert at Soar Ffrwdanos, Penygraig plus a performance at our local care home Ty Porth and more. 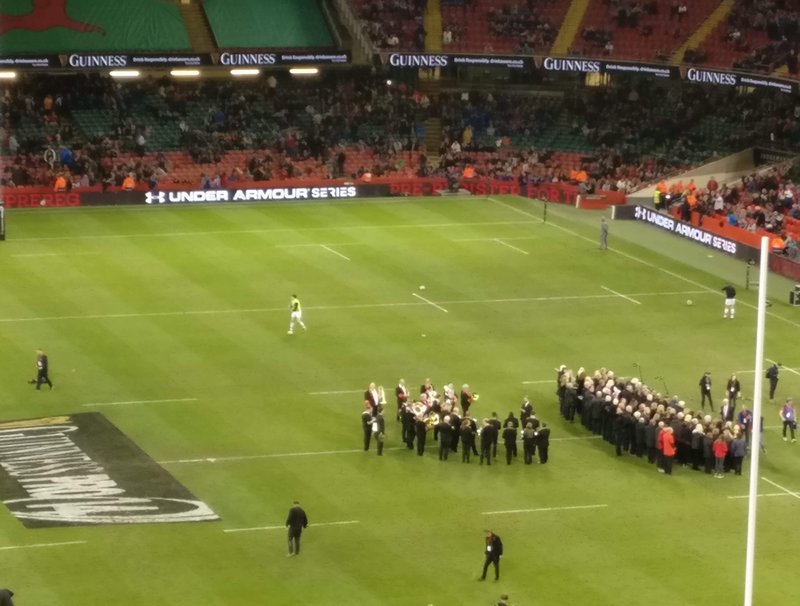 The band were also pleased to be able to support a number of other charities this Christmas, raising around £700 for Velindre Cancer Care Centre and the children's cancer charity Clic Sargent. Following a total of 41 engagements undertaken throughout 2018, we'll now be taking a well earned three week rest over Christmas, but the band will be back in rehearsal the first week of January and are looking forward to another great year ahead in 2019. 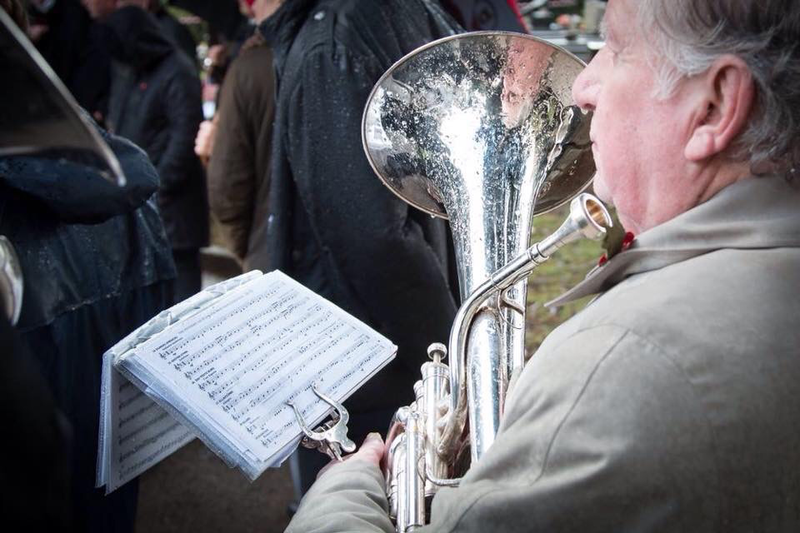 Lewis-Merthyr Band is deeply saddened to learn of the passing of longstanding LMB member, supporter and friend John Thomas. John was a colourful character, who will be fondly remembered by all who knew him. He passed away on Monday 10th December at the Royal Glamorgan Hospital, Llantrisant. 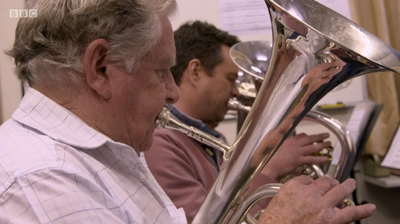 John started playing in the early 1950's with the Ynyshir Boys Band, and went on to join Ynyshir senior band on BBb bass, the instrument which he continued to played until his retirement. John joined Lewis-Merthyr Band in 1968 and played with the band at in the Finals of the National Championships of Great Britain in both 1968 and 1969. He is depicted here, front right, ahead of a performance with the band at the Welsh Regional Championships at the Brangwyn Hall, Swansea. 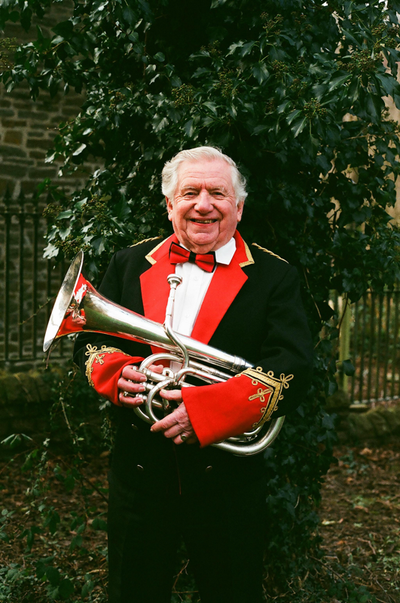 John always took an active part in the running of both Ynyshir and Lewis-Merthyr Bands and was a great brass band character. He was a Life Member of Lewis-Merthyr and will be greatly missed by all members of the band, and of additional bands across South Wales. 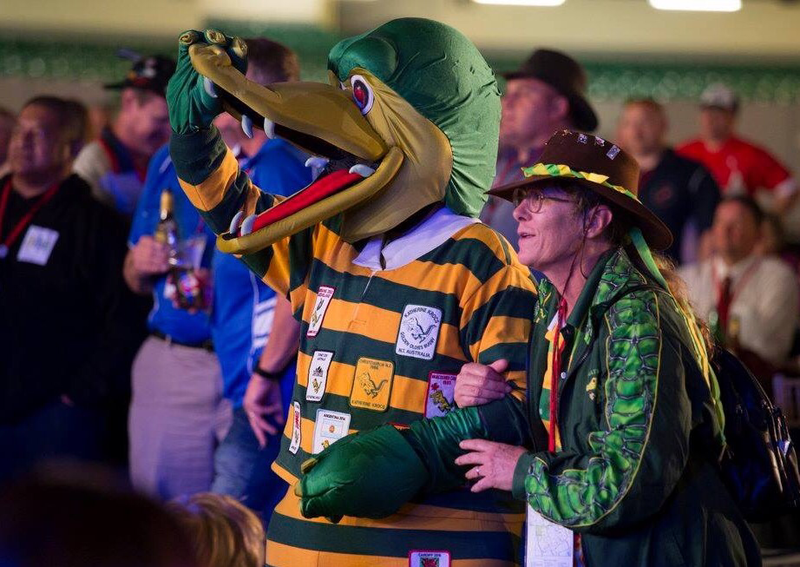 Our condolences go out to John's widow Jean and all family. 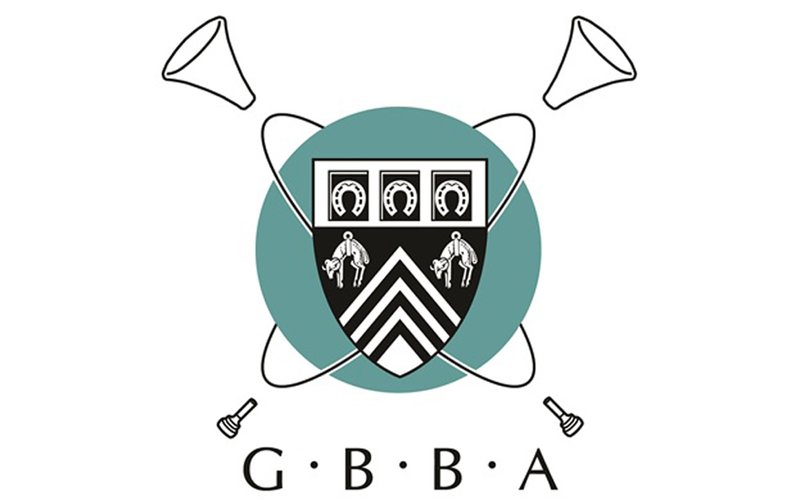 The band were delighted to compete in the 2018 GBBA Championships at All Saints Academy, Cheltenham where we were awarded Second Prize in both the own choice test-piece & march competitions, plus the award for best percussion section, by Adjudicator David Hirst. With regular MD Craig Roberts working with the USA’s Atlantic Brass Band at the Brass In Concert Championships in The Sage, Gateshead, the band were delighted to be conducted at the championships by former NYBBW Chair and Head of Gwent Music, Alun F Williams. ​The band thoroughly enjoyed working with Alun and look forward to doing so again in future. 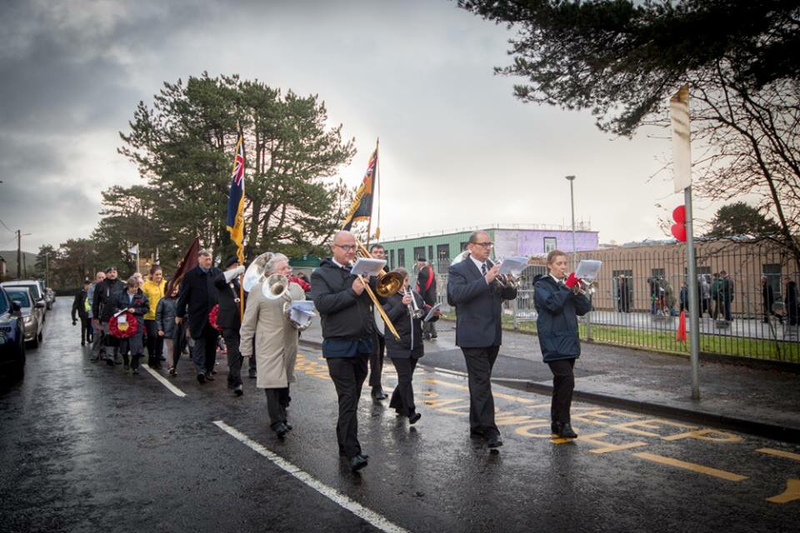 At 11 o'clock, on the 11th day of the 11th month, Lewis-Merthyr Band once again performed in support of Remembrance Day services and parades, at both Bridgend at Tonyrefail. 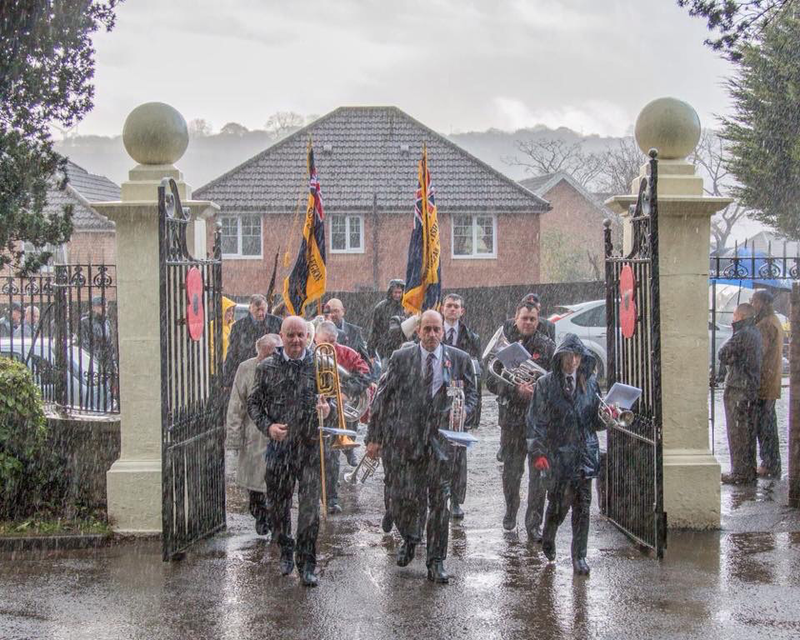 It absolutely poured with rain at both events, but both band and community turned out to remember the 100th anniversary of the end of the First World War and those who gave the ultimate sacrifice in service of their country, both then and since. 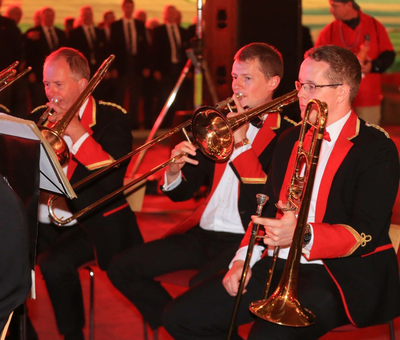 The band looks forward to a busy close to 2018 with engagements throughout November and December. 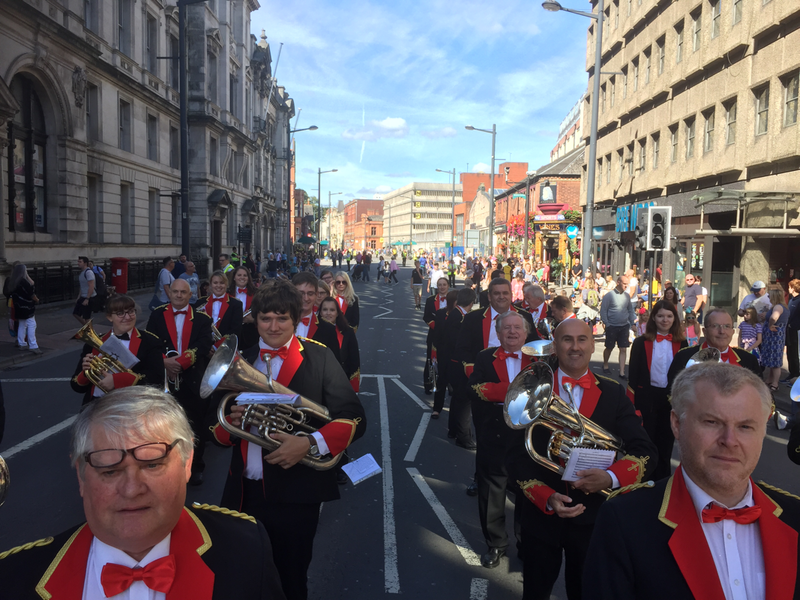 In November, the band will be supporting the First World War centenary services at both Bridgend and Tonyrefail on Remembrance Day, and will be crossing the Severn Bridge to compete in the 2018 GBBA Championships in Gloucester on Sunday November 18th. 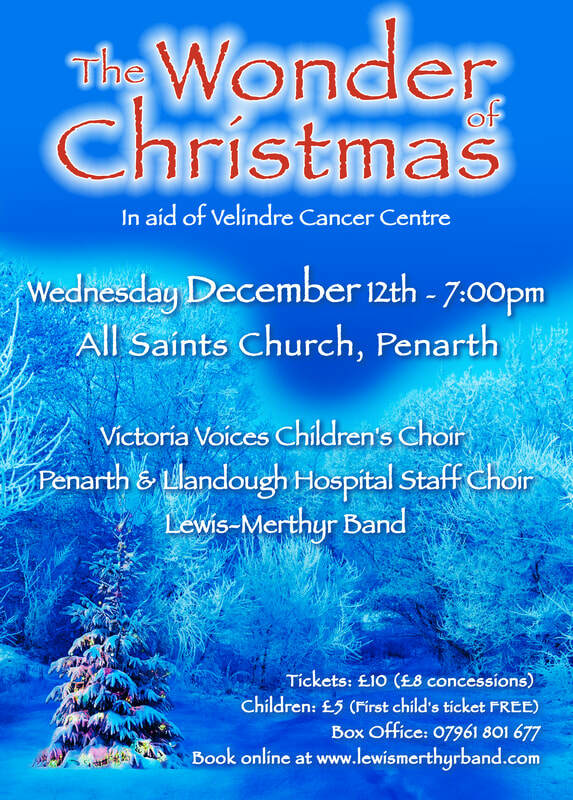 December then sees the band supporting a wide range of festive events, including those in support of children's cancer charity Clic Sargent, Velindre Cancer Care and our local care home Ty Porth. 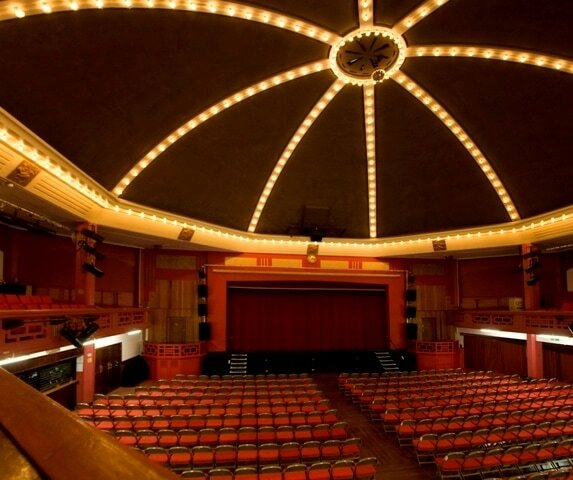 On Saturday September 22nd, the band once again joined forces with Pendyrus Male Choir, BBC Wales' Beverley Humphreys and local young performers for the third consecutive Rhondda Tunnel Project Benefit concert at the magnificent Park & Dare Theatre, Treorchy. 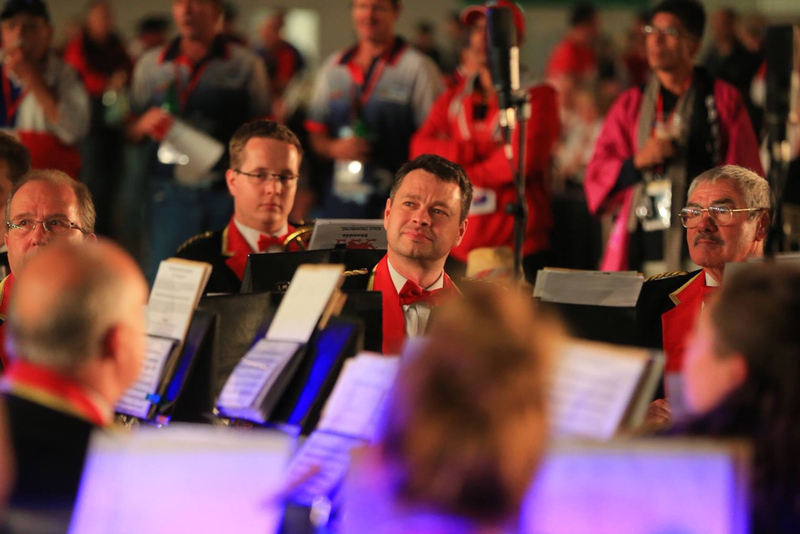 With LMB Musical Director in Germany, working with the Musikfest der Bundeswehr, the band was conducted at the concert by RAF St Athan Musical Director, Mr Alan Bourne. 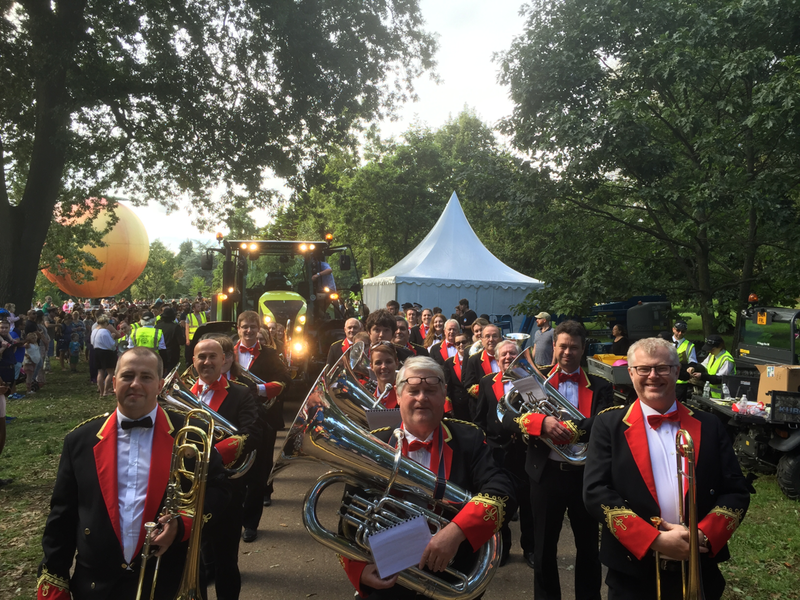 The band thoroughly enjoyed working with Alan on the performance, which is always an absolute highlight of the band's annual calendar. 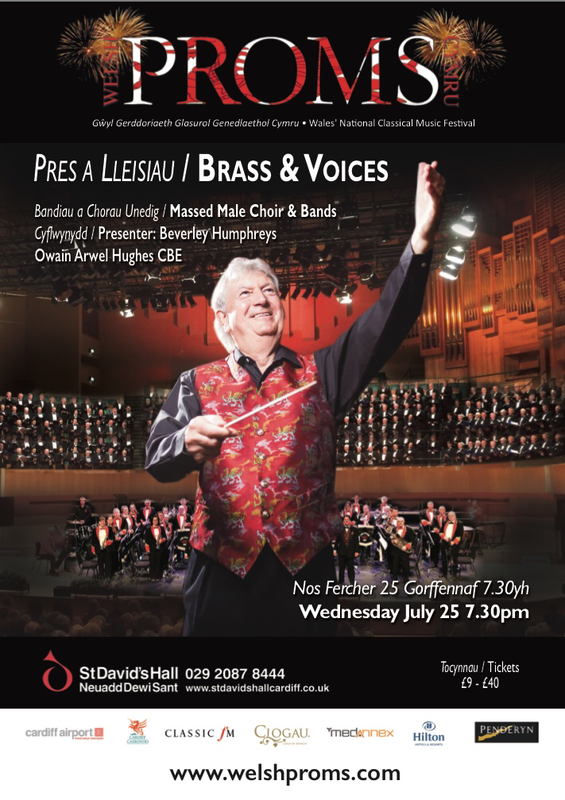 The concert will saw the first public sales by the band and choir of the new Brass & Voices of Wales CD, recorded by Lewis-Merthyr and the Massed Male Choirs of Pendyrus & Bridgend under the baton of Owain Arwel Hughes CBE in July. 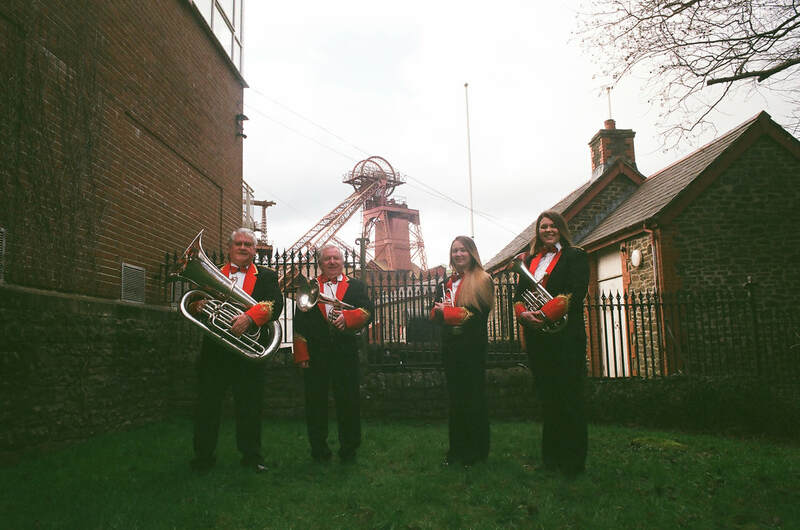 Also on Saturday September 22nd, an ensemble from the band performed at the winding engine house of the Great Western Colliery "Hetty" Pit. 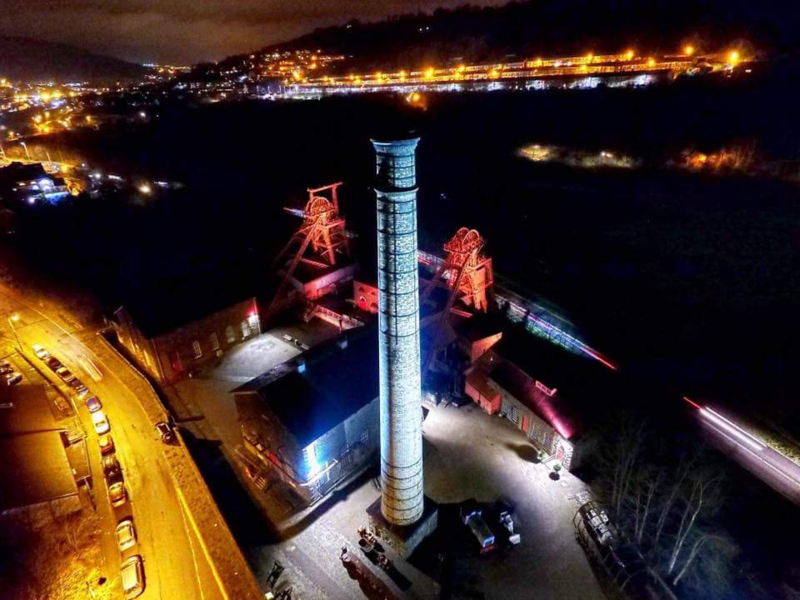 The house contains the original steam winding engine built by Barker and Cope of Kidsgrove in 1875 and is located alongside the main Rhondda Road between Hopkinstown and Trehafod, near the former Lewis-Merthyr Colliery site, now the Welsh Mining Experience, Rhondda Heritage Park. 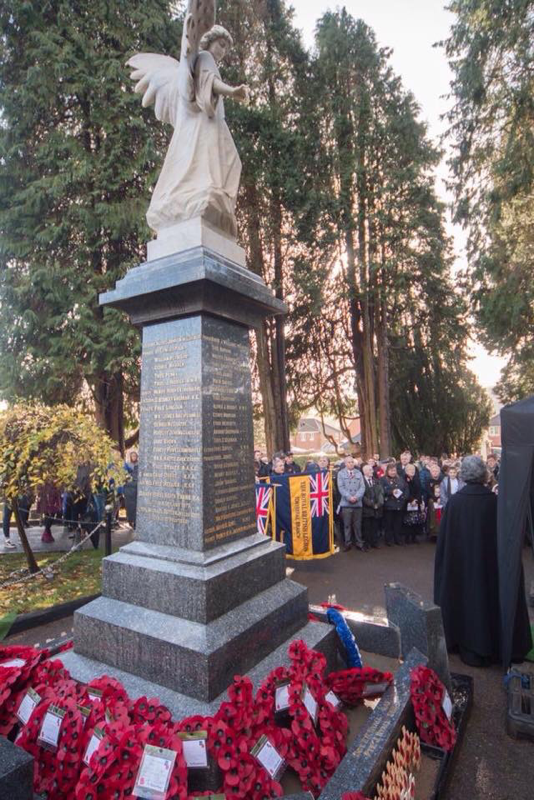 The engine has been restored to working order by volunteers, and the site is a Scheduled Ancient Monument. It is the only large steam engine in Wales currently in working order. 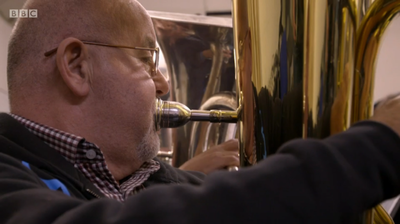 For the Open Doors event, the engine was working on compressed air. 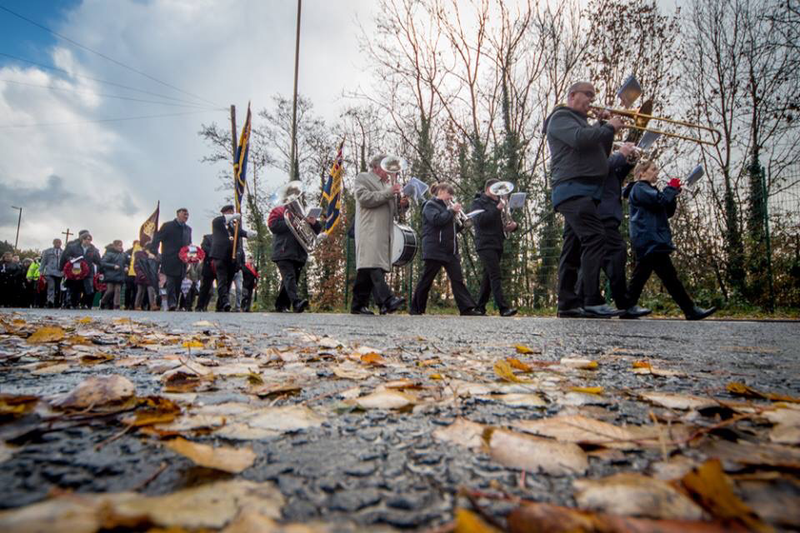 Visitors were able to drive the engine under supervision, operate the mechanical and electrical shaft signalling systems, and talk to volunteers about the engine and the history of the colliery, plus of course listen to the band. 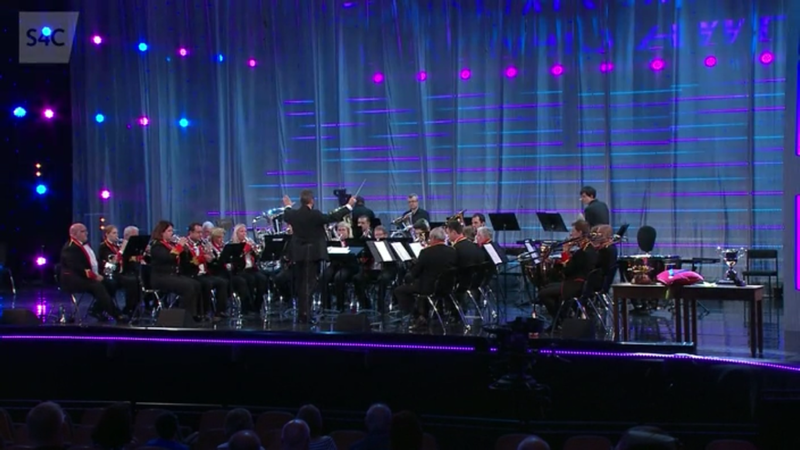 The band had a tremendous time performing on the stage of the iconic Donald Gordon Theatre at the Wales Millennium Centre in the National Eisteddfod of Wales. 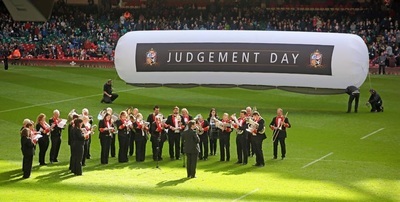 The performance was also televised nationally on S4C and Sky television and follows in a series of high profile performances for the band, which includes our Cwm Rhondda broadcast with Sir Bryn Terfel (which was screened again on Friday night ahead of the Eisteddfod opening), our performance for a record Pro-14 crowd at Judgement Day in the Principality Stadium, and the band's recent appearance at the Welsh Proms in the national concert hall of Wales, St David's Hall, Cardiff. The band had an incredible time performing at the Welsh Proms this summer. 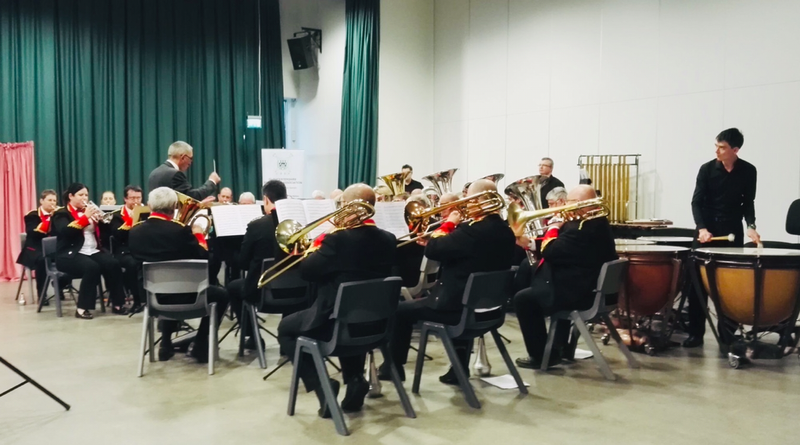 Lewis-Merthyr appeared in Massed Bands together with RAF St Athan Band, under the baton of the doyen of Welsh conductors, Dr. Owain Arwel Hughes CBE. 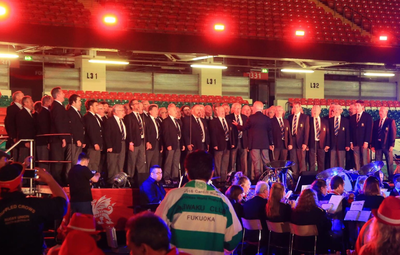 Along with compere, BBC Wales' Beverley Humphreys, and the 250 voice massed male choirs of Bridgend, Cwmbach. Morlais and Pontarddulais, the massed band and Dr. Arwel Hughes wowed the audience of c.1100 people gathered in the national concert hall, St David's Hall, Cardiff, with a selection of Welsh favourites and orchestral transcriptions, which included Walton: Crown Imperial, Stravinsky: The Firebird and Respighi: The Pines of Rome. 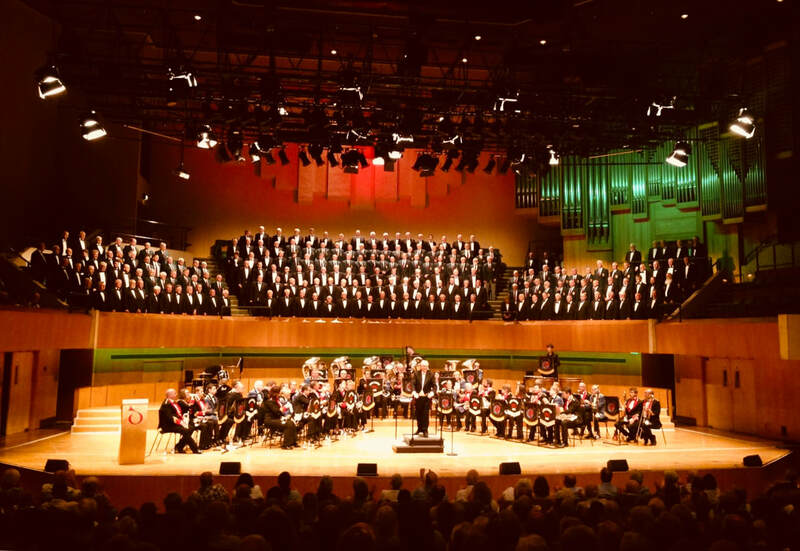 Both bands, the massed choirs and audience had an absolutely tremendous evening, which closed in a deserved standing ovation for the assembled cast at this, Wales' national classical music festival. The 2019 Welsh Proms will take place from July 20th to 27th 2019 at St David's Hall, with full details of the 2019 programme and artists available following the 2019 media launch which will take place at 12:00 noon on St David's Day, Friday March 1st at the Hilton Hotel, Cardiff. Lewis-Merthyr Band will feature in a trio of exciting performances this summer. 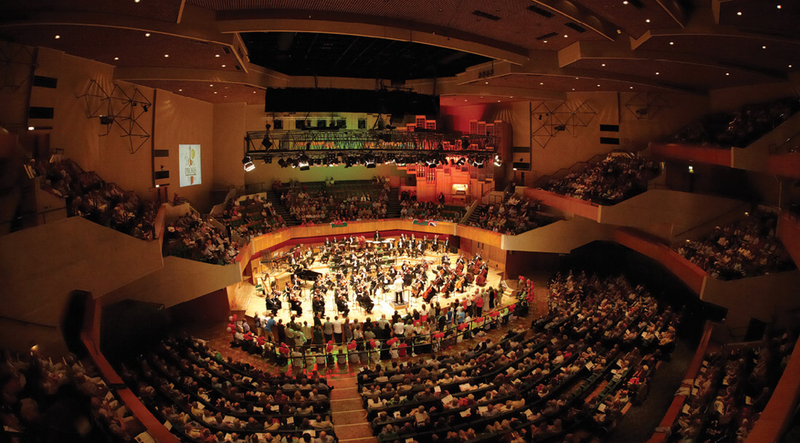 Firstly, on Wednesday July 25th, Lewis-Merthyr will feature at the Welsh Proms, Wales' national classical music festival, at the national concert hall of Wales, St David's Hall, Cardiff. The band will feature in the central Brass & Voices Prom together with the 250 voice Massed Male Choirs of Bridgend, Cwmbach, Morlais & Pontarddulais, plus RAF St Athan Band. 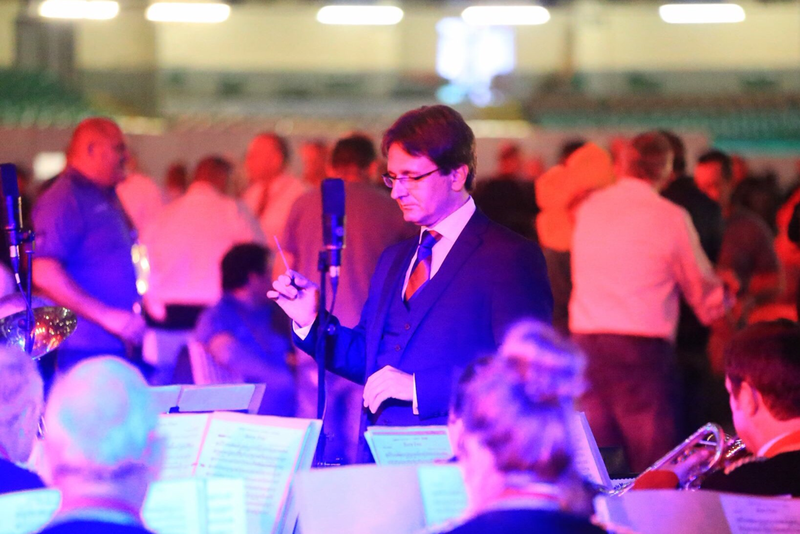 The concert will be conducted by the renowned orchestral conductor Owain Arwel Hughes CBE. 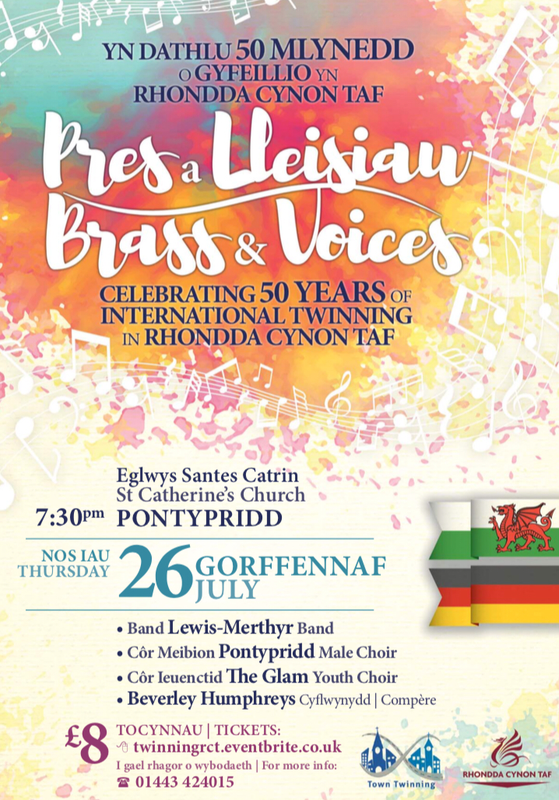 On Thursday July 26th, we'll then be celebrating 50 years of international twinning between Rhondda Cynon Taf and Nürtingen, Germany, plus 25 years of twinning with Ravensburg, Wolfenbüttel and Montélimar, France in a Brass & Voices concert with Pontypridd Male Choir & The Glam Youth Choir at St Catherine's Church, Pontypridd. 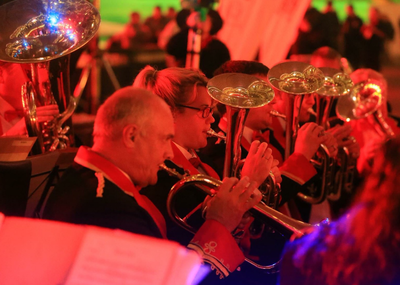 Finally, the band will then close off the summer with a grand scale Movies, Musicals & More! 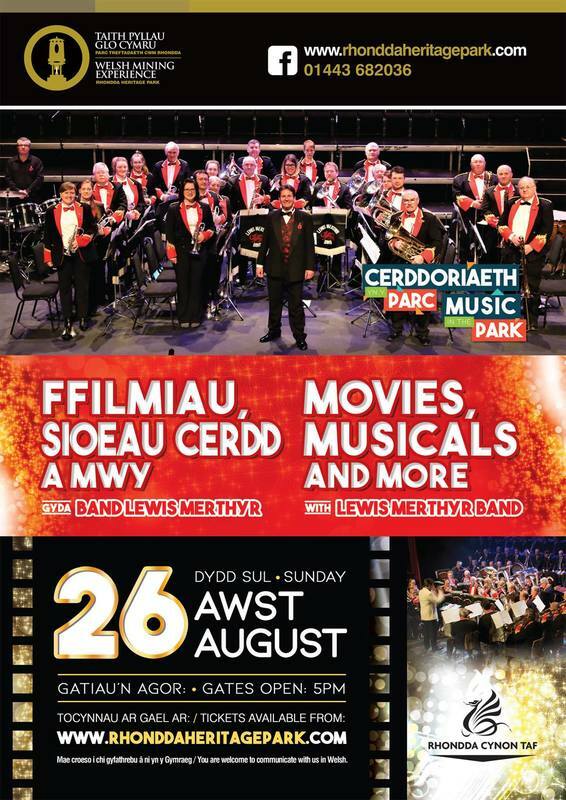 event together with Massed Male Choir & Soloists Ashley Richards & Joanne Huxton in the fantastic setting of the former Lewis-Merthyr Colliery, Rhondda Heritage Park on Sunday August 26th. 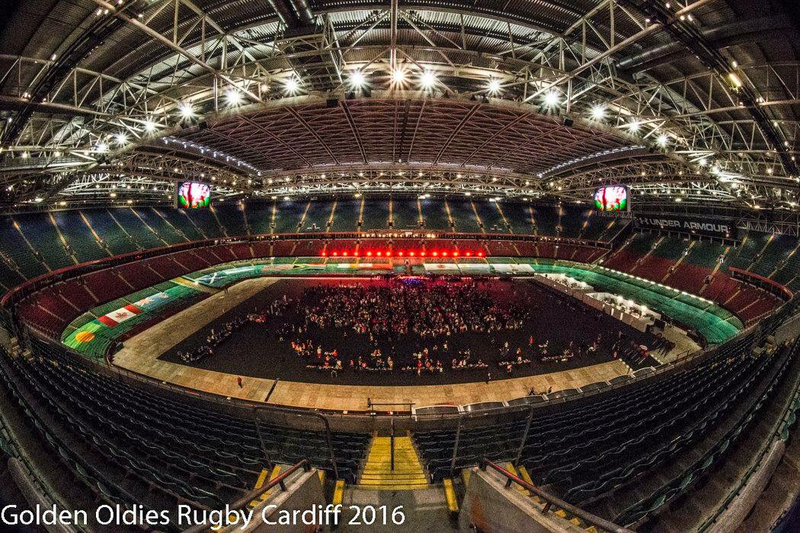 Tickets for all events are available via the links below. 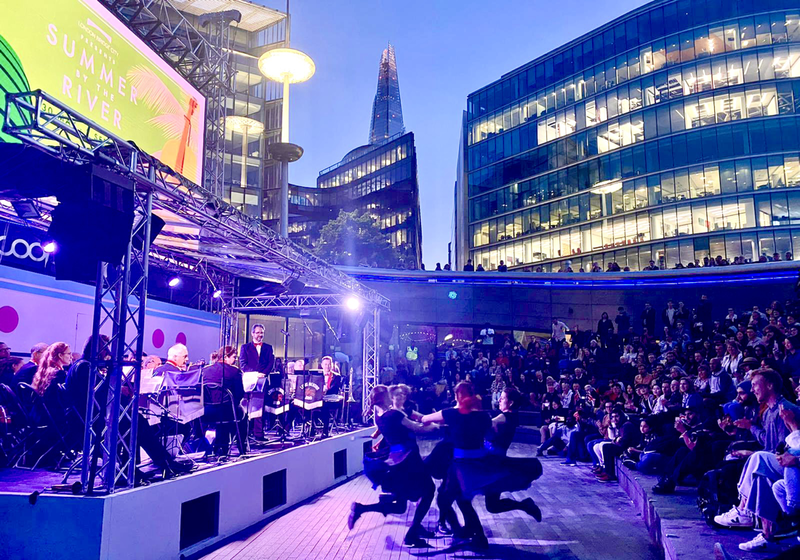 Be sure not to miss these incredible summer performances! 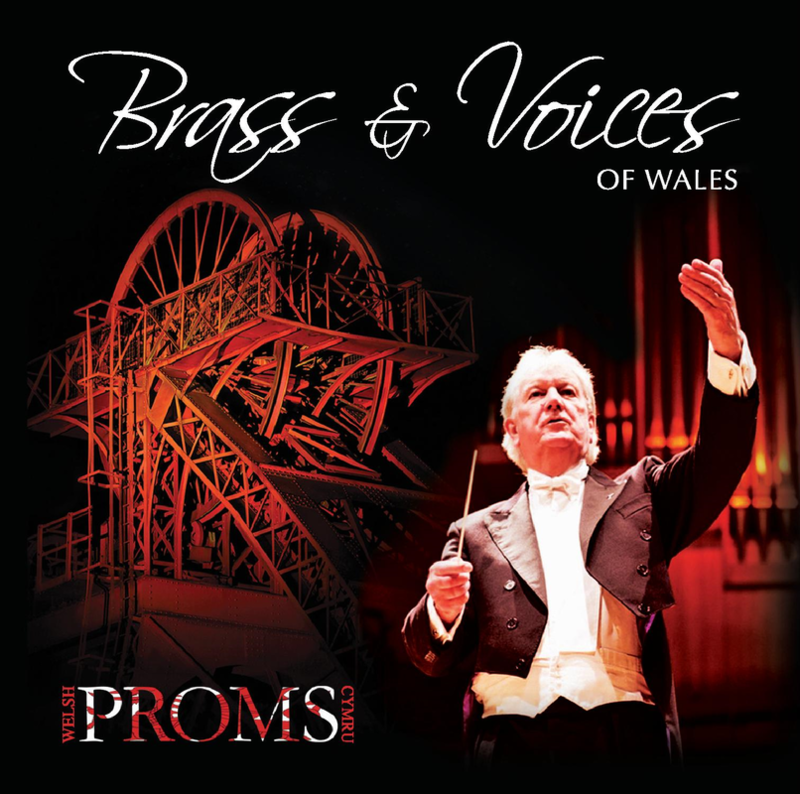 Our new CD recording "Brass & Voices of Wales" features a selection of the most popular hymns and melodies of Wales, performed by Lewis-Merthyr Band and the Massed Male Choirs of Bridgend & Pendyrus, all directed by the doyen of Welsh orchestral conductors, Dr. Owain Arwel Hughes CBE. The disc features much of Wales’ most beloved music, together with the premiere recording of a new work by Dr. Christopher Wood, entitled and dedicated to the memory of Aberfan; Gareth Wood’s scintillating creative arrangement of Sosban Fach; the miners' hymn “Gresford”, music from the iconic Hollywood movie “Zulu” and many more. 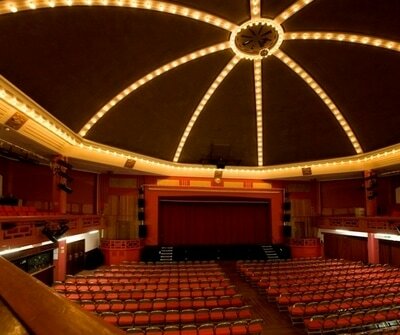 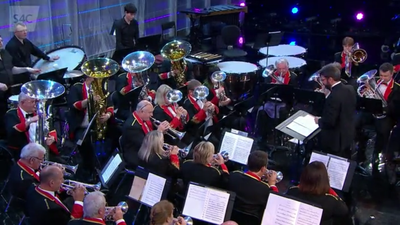 ​LMB to feature at the Welsh Proms! Following the incredibly successful CD recording recently undertaken by the band with Dr. Owain Arwel Hughes and Massed Male Choir, Lewis-Merthyr Band has now been invited to feature in and perform at the 2018 Welsh Proms, held in the national concert hall of Wales, St. David’s Hall, Cardiff. Now entering it’s 33rd consecutive season, the Proms - Wales’ national classical music festival - consists of a week long series of grand scale concerts, which this year will also feature the Bournemouth Symphony Orchestra, Royal Philharmonic Orchestra and Welsh National Opera Orchestra, together with star soloists Shân Cothi, Robert Court, Claire Jones & John Owen-Jones. 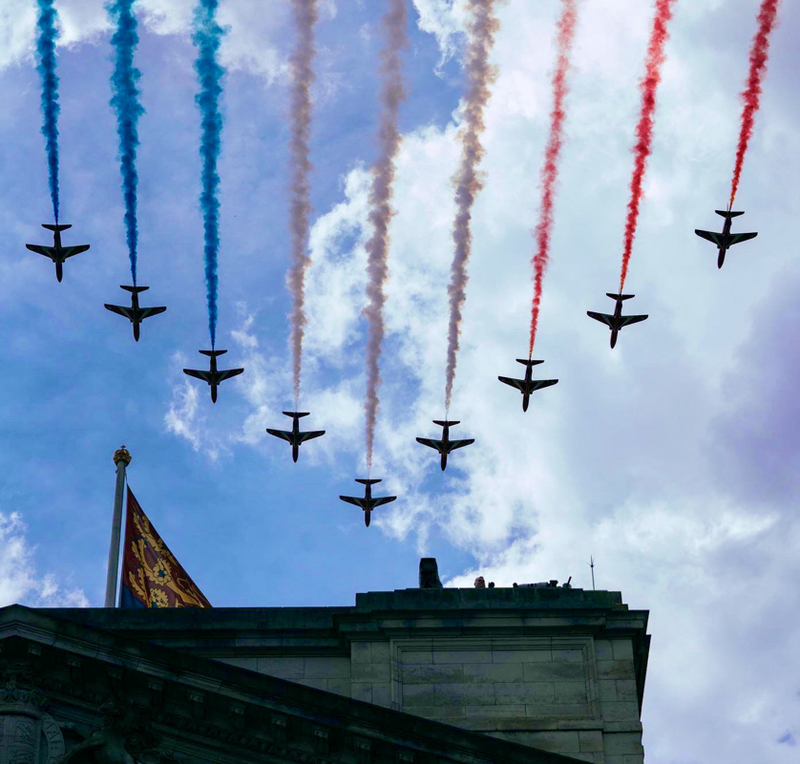 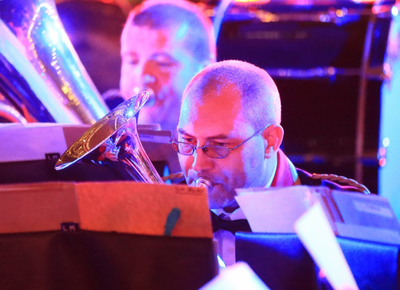 Lewis-Merthyr will feature in the central Brass & Voices Prom, in a special First World War and RAF 100 themed version of the event, which will also feature 200 voice Massed Male Choir and the Massed Bands of Lewis-Merthyr & RAF St Athan. 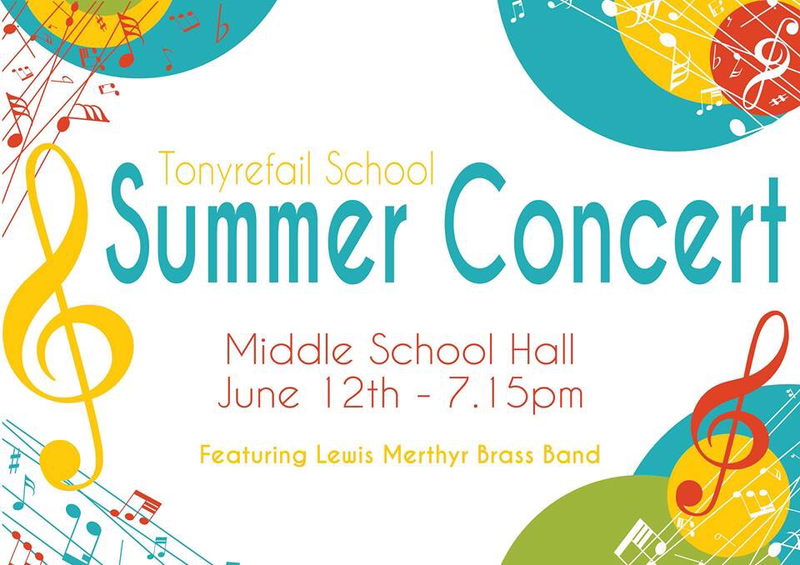 The band recently enjoyed a delightful concert in the local area, supporting the Summer Concert at Tonyrefail School, on Tuesday June 12th. 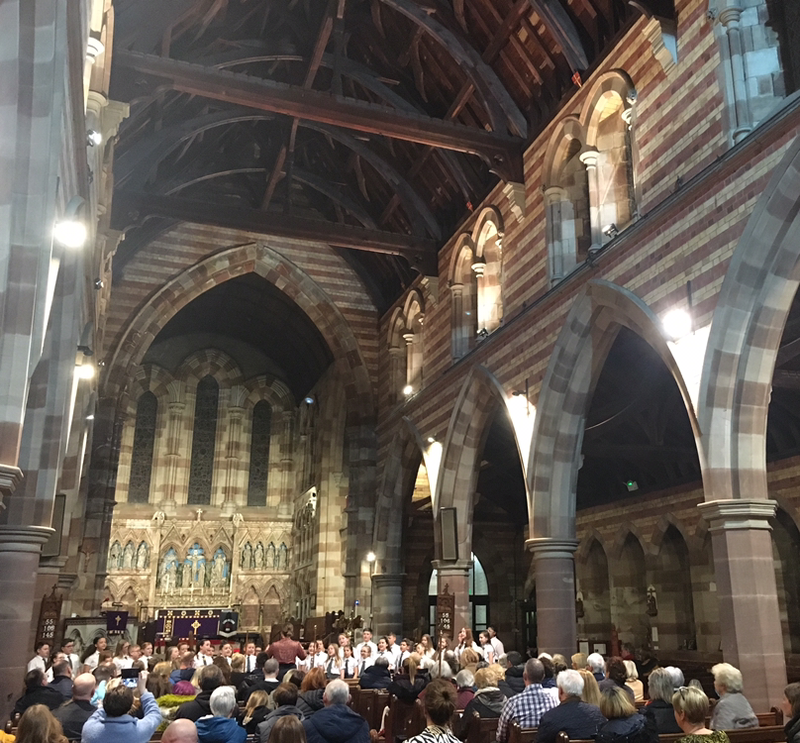 There Lewis-Merthyr performed together with young soloists and the two school choirs, directed by Miss Joanne Huxton and accompanied by Mr Ben Davies at the piano. The band highly value our close relationship with the school, and from September, we're delighted to be expanding offering brass tuition opportunities to Year 4 pupils at the school, inspiring the next generation of brass playing in the area. 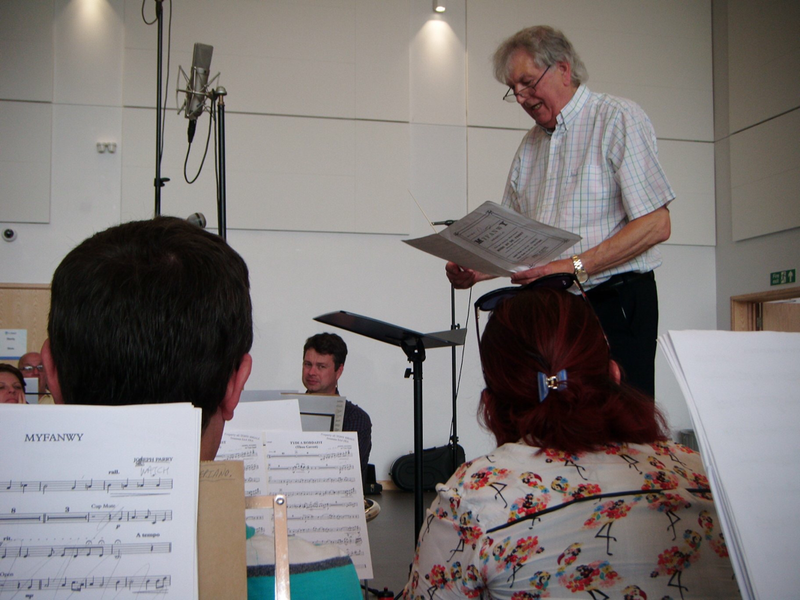 The band recently enjoyed a tremendous weekend in the recording studio together with the doyen of Welsh conductors, the renowned orchestral conductor Dr. Owain Arwel Hughes CBE. The resultant recording will be a disc of wholly Welsh music which also features our good friends from Pendyrus & Bridgend Male Choirs. The album is set for release in association with the Welsh Proms this summer! 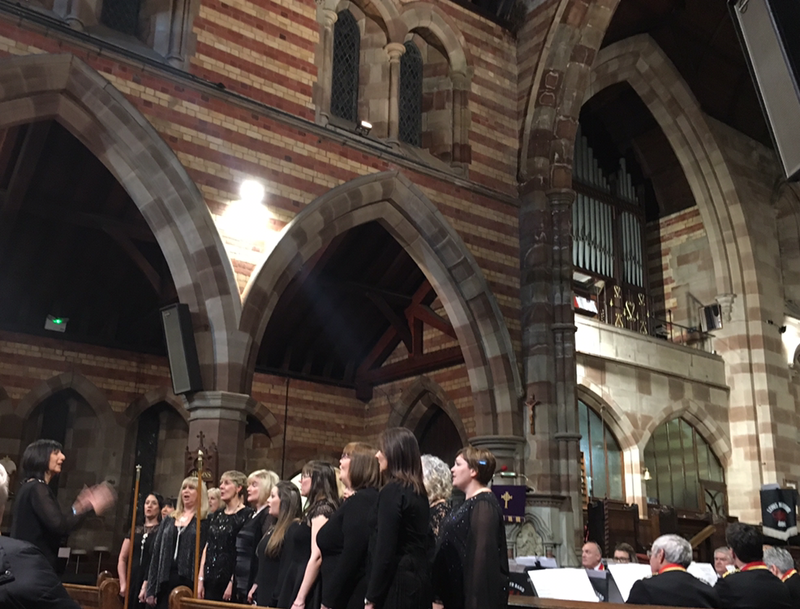 We had a tremendous time making the disc and would like to thank all our good friends who performed with us, the choirs, Dr. Arwel Hughes and also Phil Hardiman, Tim A. Duncan and our MD Craig Roberts for producing this weekend. 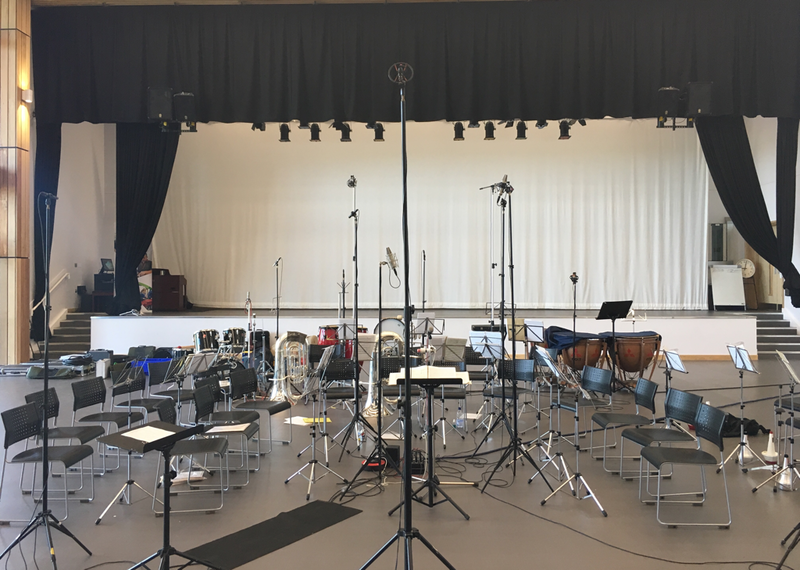 We’d also particularly like to thank each and every one of our members for all their incredible hard work both on the 12 hours of recording this weekend, and all the advance rehearsals & preparations. On Thursday May 10th, the band were delighted to perform in concert at St John's Church, Cymmer, together with our good friends from Cambrian Male Choir, in aid of the Mayor of Rhondda Cynon Taf's charities. 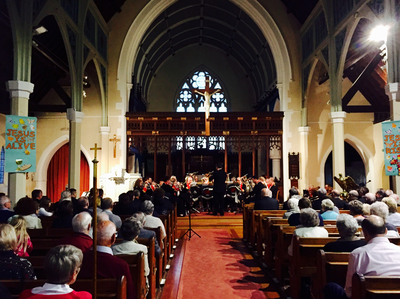 Over £400 was raised through the concert, which will now be donated to Alzheimer's Society Cymru/Wales, Guide Dogs Cymru, Y Bwthyn palliative care hospital, Pontypridd, and Friends of the Animals Wales (formerly Friends of the Animals RCT). 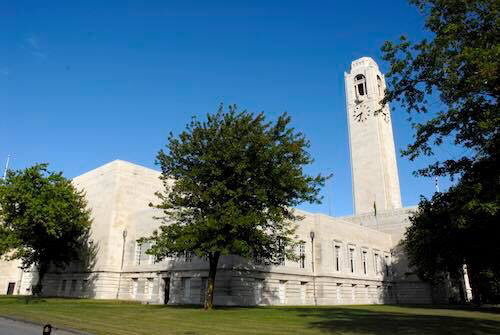 The current Mayor of Rhondda Cynon Taf is Cllr Margaret Tegg, who has been the elected County Borough Councillor for local Cymmer ward since 2008. Cllr Tegg worked in the nursing profession and retail sector for many years. 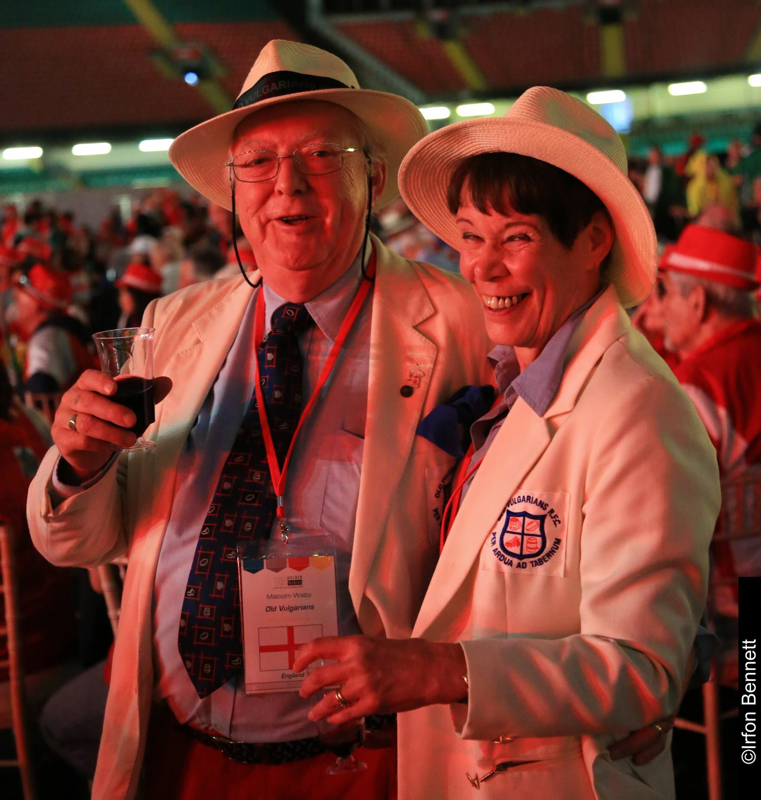 Now retired, she is a member of the Porth Cluster Communities First, a governor at Ysgol Gyfun Cymer Rhondda and Chair of the governing body at Cymmer Junior School. 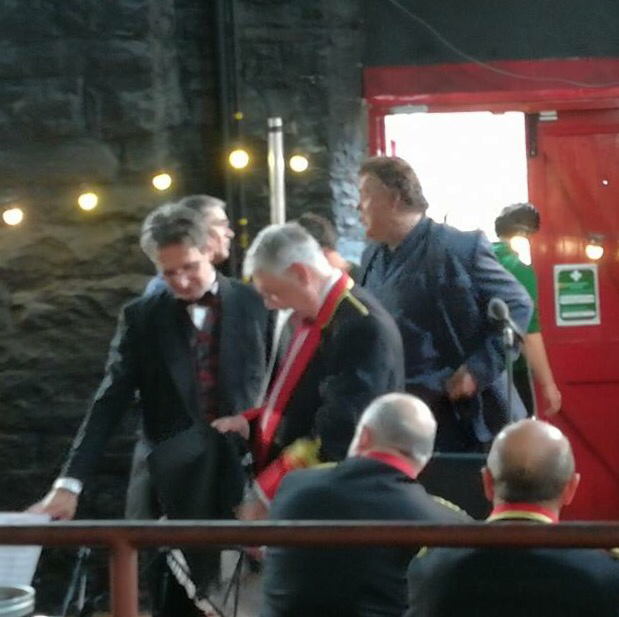 At the concert, the Mayor also presented Lewis-Merthyr Musical Director Craig Roberts with the the Mayor of Rhondda Cynon Taf's Good Citizen Award for Artistic Achievement and services to music, the arts and education in Rhondda Cynon Taf over many years. The band now look forward to supporting additional events in the local area this summer, with four major concerts scheduled between June and September. 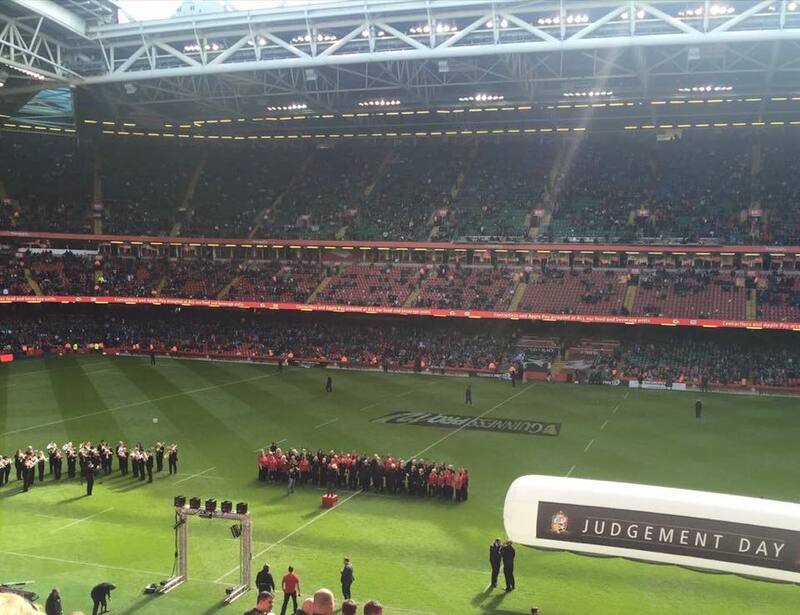 The band had an incredible time performing for a huge crowd of 62,338 Pro14 fans at the Principality Stadium for Judgement Day VI. Huge thanks go to all our members for two super performances at the stadium, and a solid 5th place at the SEWBBA Championships later that evening, the band's first performance in the elite Championship section in over 20 years! Our thanks go to WRU Director of Music Dr. Haydn James, the massed club choirs & all at the Welsh Rugby Union for another fantastic welcome at the national stadium. 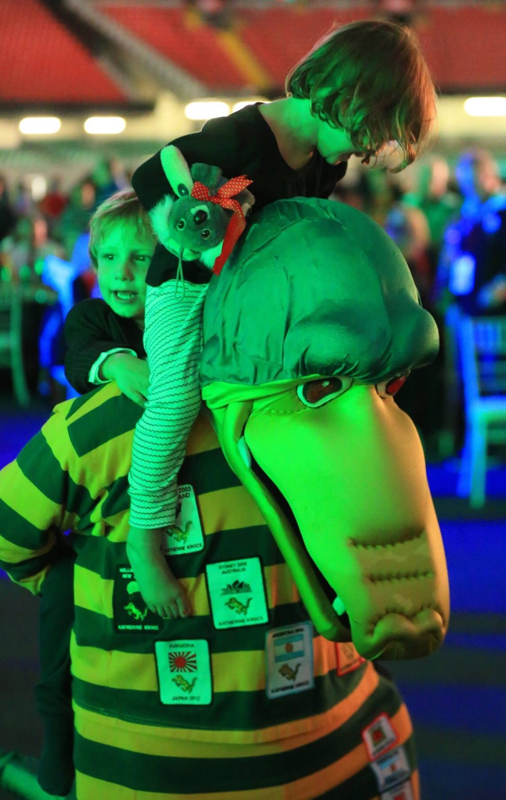 We look forward to returning for another event again soon. 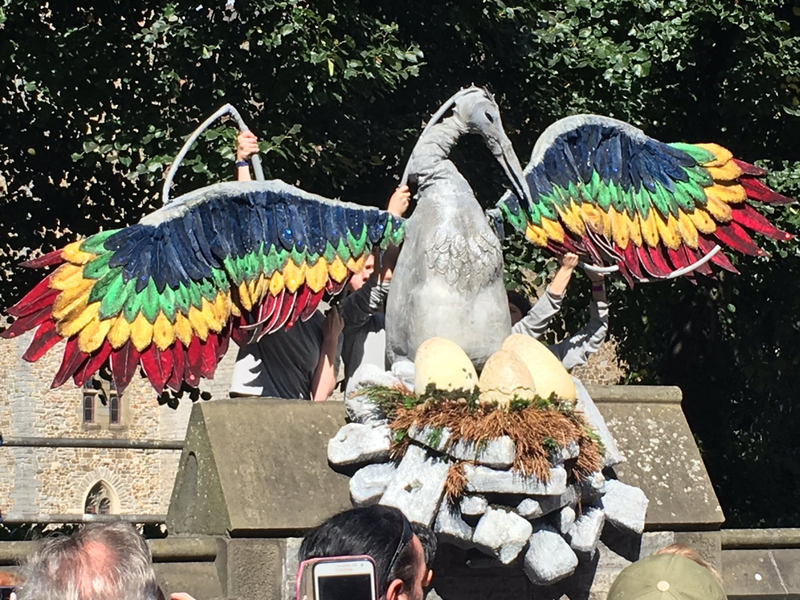 A series of images from the day can found below with additional images available in the Gallery section of the website here, while the current SEWBBA rankings can be found below. In mid-April, Lewis-Merthyr Band were delighted to support two events at Cyfartha Castle and Ynysangharad Park, Pontypridd during the South Wales tour of the Man Engine. 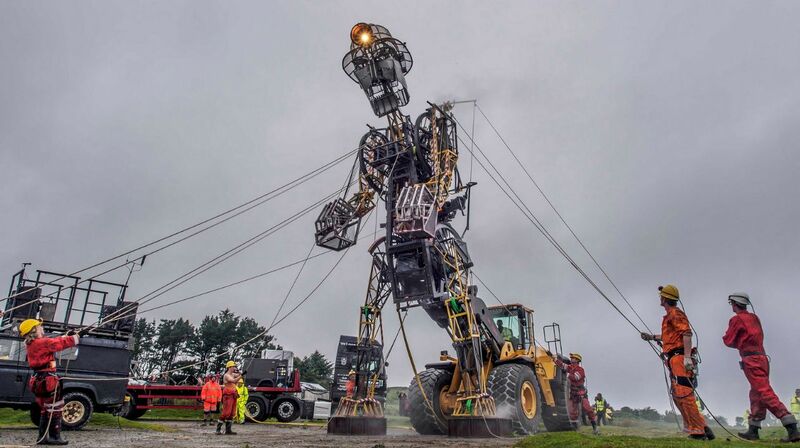 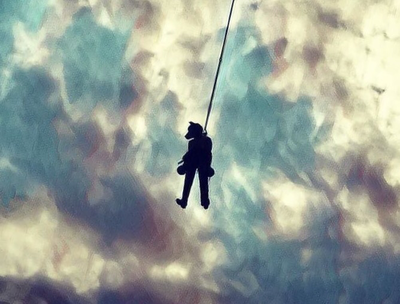 Powered by Volvo, Man Engine is the largest mechanical puppet ever constructed in Britain. 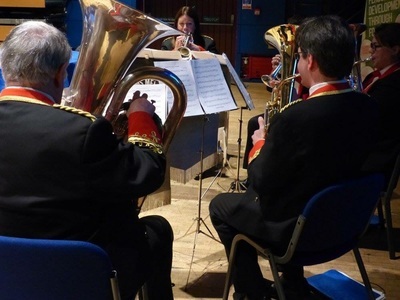 The 11.2m high engine toured the length of the Cornish Mining World Heritage Site last summer, and this Easter toured South Wales, including the two performances at Merthyr Tydfil and Rhondda Cynon Taf supported by the band. The band thoroughly enjoyed supporting both events, and premiering the Man Engine Anthem, composed especially for the occasion by Helen Woods, who has worked with the Welsh National Opera, BBC NOW & Royal Philharmonic Orchestra. 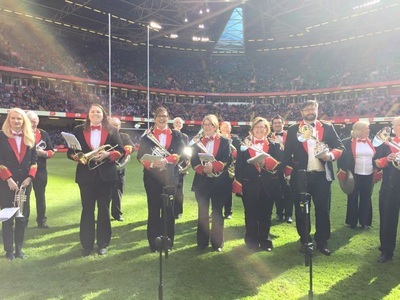 Lewis-Merthyr will be returning to once again perform at the national stadium for Judgement Day, the sixth annual regional double-header at the Principality Stadium, Cardiff. 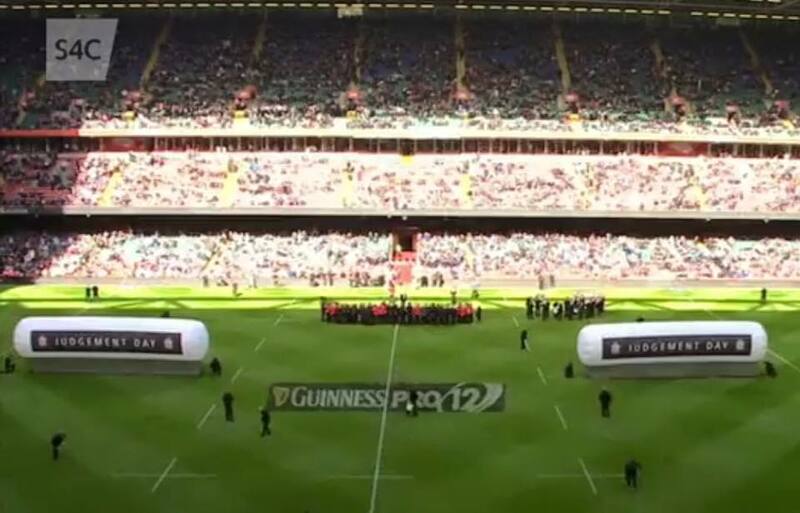 The event will take place on the afternoon of Saturday 28th April (KOs 15.05 & 17:35), and is the final weekend of Guinness PRO14 Championship action before the knock-out stages. 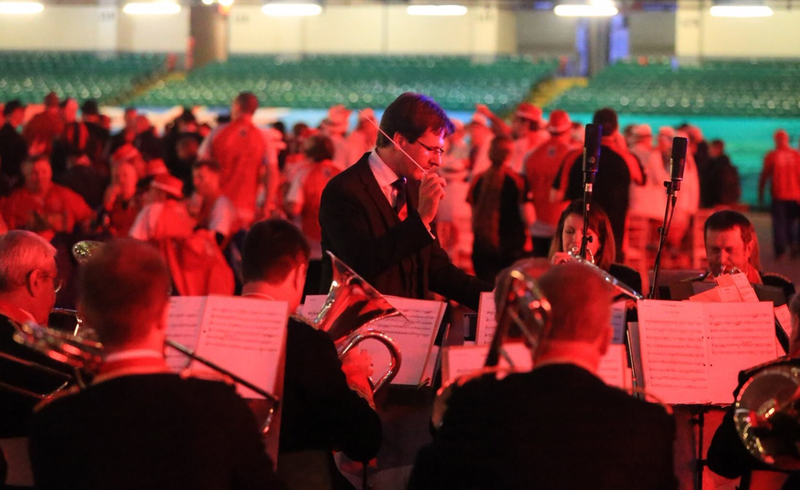 The band are delighted to once again be supporting the event, performing together with the massed club choirs, under the direction of WRU Director of Music Dr. Haydn James. 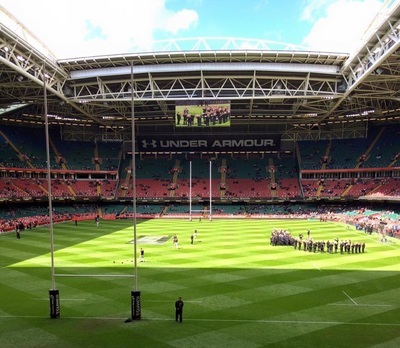 The Principality Stadium has had a magnificent year, even by its own standards, hosting a sold-out Champions League Final and a world record indoor heavy-weight boxing crowd watching Anthony Joshua's world title defence just two of the highlights. Welsh rugby is going from strength to strength too, with the international side's Under Armour Series breaking records with two sell-outs on the cards (against New Zealand and Australia) this past autumn. 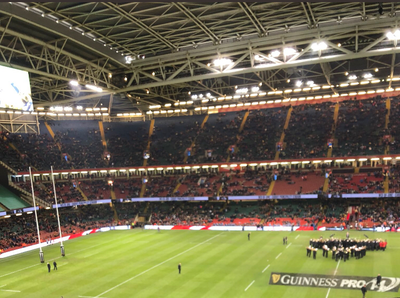 Healthy attendances have been seen at the four professional teams in both the Guinness PRO14 and European Rugby this season - with total attendances up by over 10,000 from the same point last season and crowds at the popular Welsh derby contests also higher than last year. 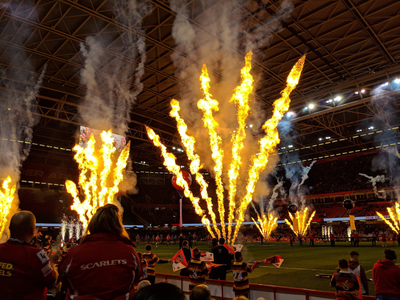 Prices for the Judgement Day have once again been frozen at £10-per-head for any seat in the ground at the derby day which sees the Dragons take on the Scarlets and Cardiff Blues face the Ospreys in back-to-back clashes in the capital. 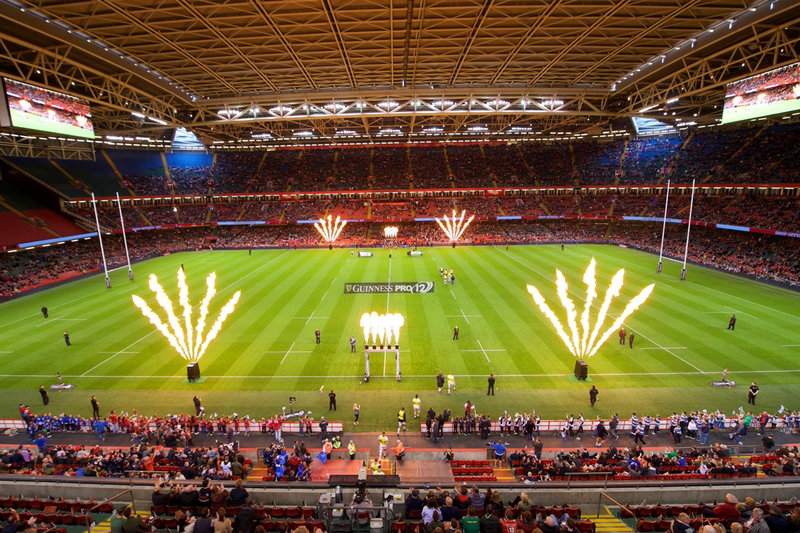 Over 170,000 fans have attended Judgement Day across three years alone, and a record attendance for any match involving a regional team was set in 2016 - which the band also performed for - when 68,262 people watched the Ospreys beat the Blues 27-40, followed by a Scarlets' 20-34 victory over the Dragons. 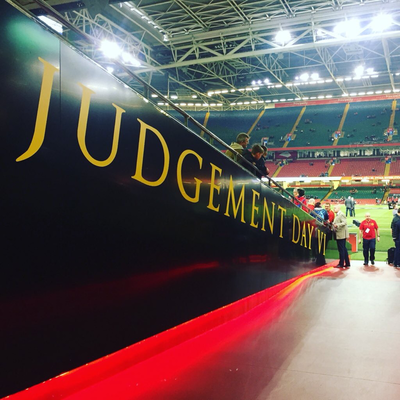 A major highlight of the Guinness PRO14 Championship season, Judgement Day will this year see the Scarlets and the Dragons kick off proceedings for the first time since year one (2013), on Saturday 28th April (KO 15.05hrs). 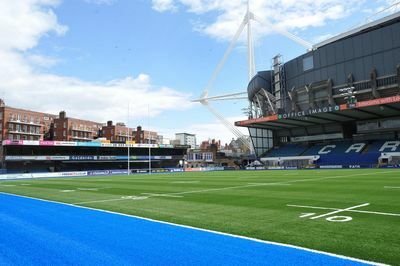 The second fixture of the day sees the Blues take on the Ospreys (KO 17.35hrs). 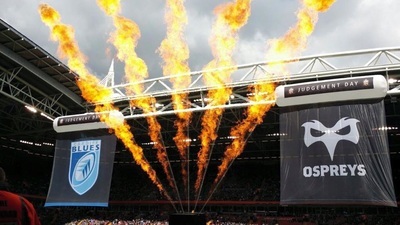 Last season Cardiff Blues triumphed over the Ospreys for the first time at the event 35-17 and the Dragons went down to their West Wales rivals a close-fought 16-21 in the second game of the day. 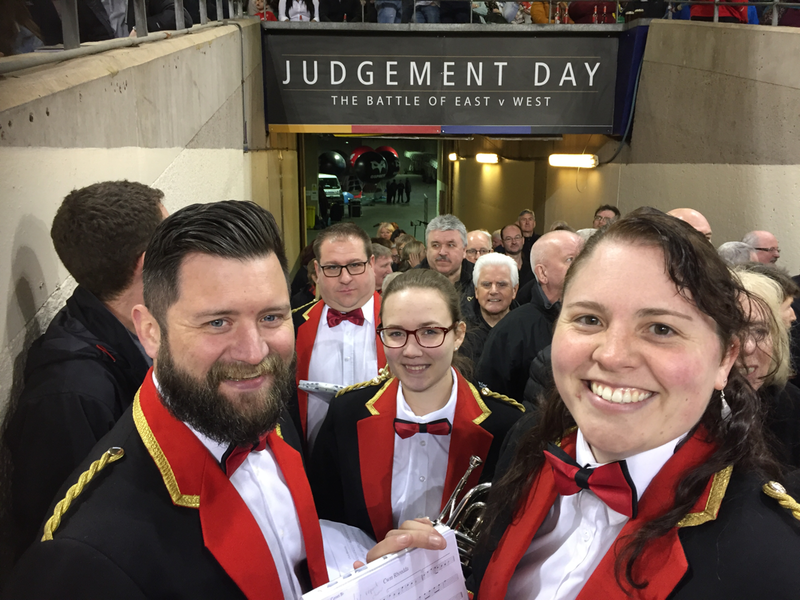 Regrettably the band won't get to see the second match, as - immediately after the second kick off - we'll be crossing the city to participate in the 2018 SEWBBA Championships, the band's first appearance in the championship section at the contest since 1998! "Judgement Day has become a must-see, must-visit fixture in the Welsh sporting calendar," said WRU chief executive Martyn Phillips. 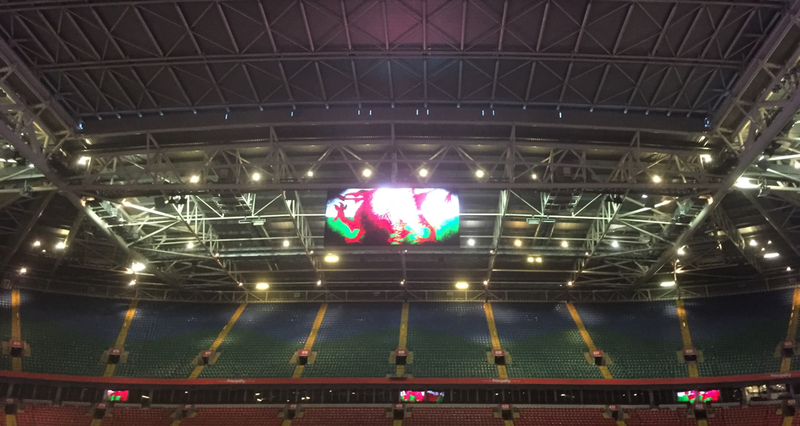 "It's a true celebration of the very best of Welsh rugby when our international stars and their teammates come together under one roof to compete against each other in regional colours. "It is a unique event which the players, coaches and supporters all look forward to in equal measure and we are set for another exciting day out at Principality Stadium on 28th April." 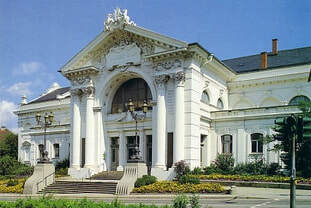 access to JDVI. Prices are £10 for each seat in the ground with a £1-per-ticket online booking fee, as well as postage, payable at the time of purchase. 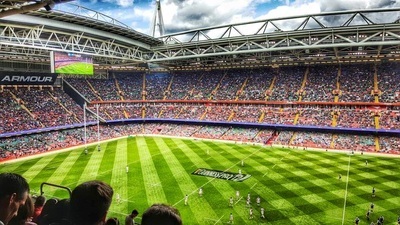 Mark Davies, Chief Executive of Pro Rugby Wales, which represents the four professional rugby teams said: "This season our double derby day at the national stadium will be the finale to the conference stages of the PRO14, so it will be an even bigger occasion for our rugby teams, players and supporters. 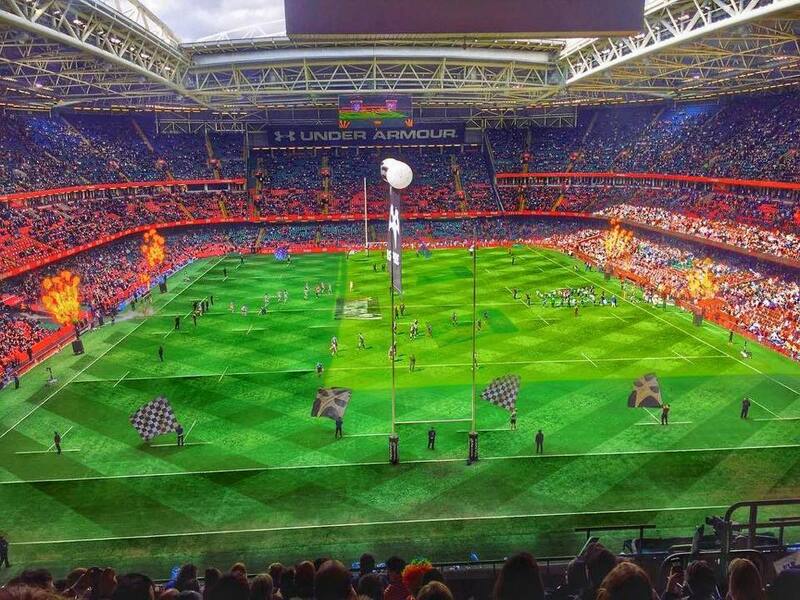 The Judgement Day games will have so much on them with PRO14 Final series places or European Champions Cup play-off places potentially at stake - so critical for our teams and will be highly competitive rugby fixtures. 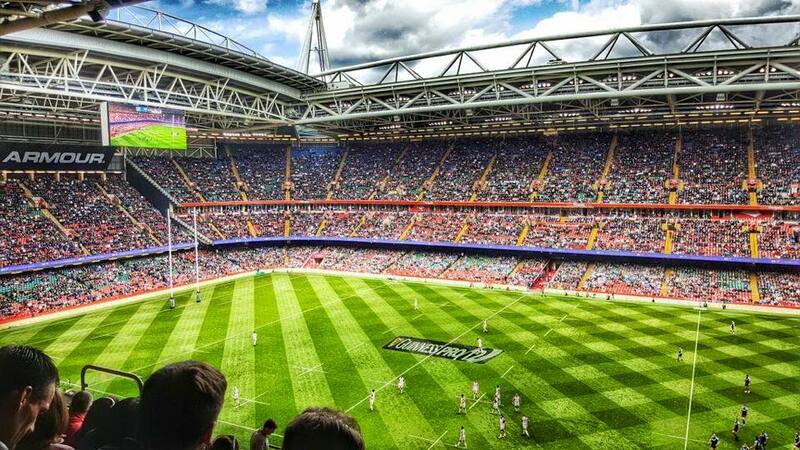 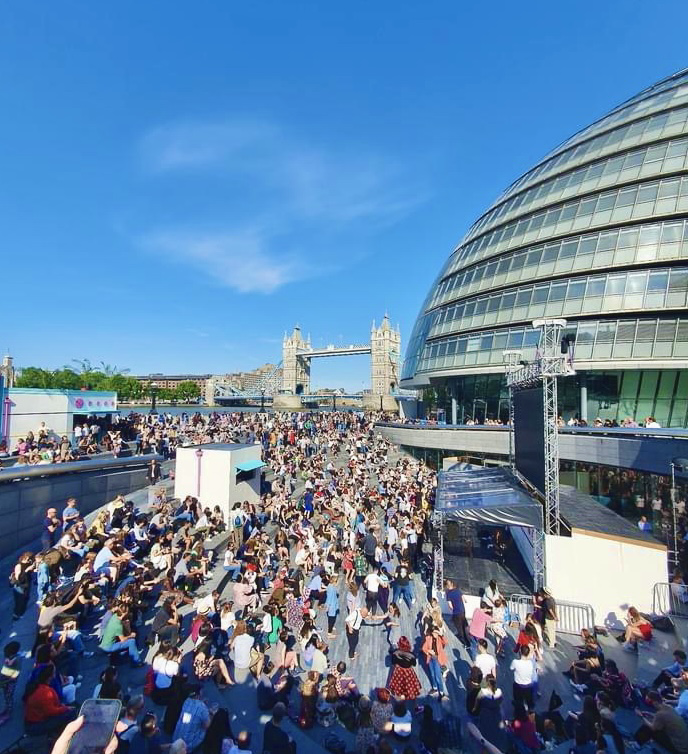 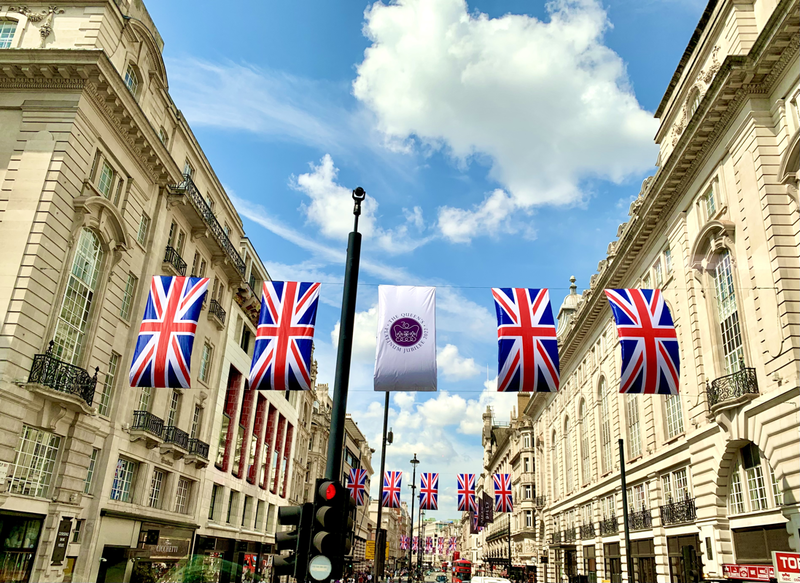 Once again we are looking forward to this successful rugby spectacle in the capital which attracts wider audiences and one we are all proud to be a part of in partnership." 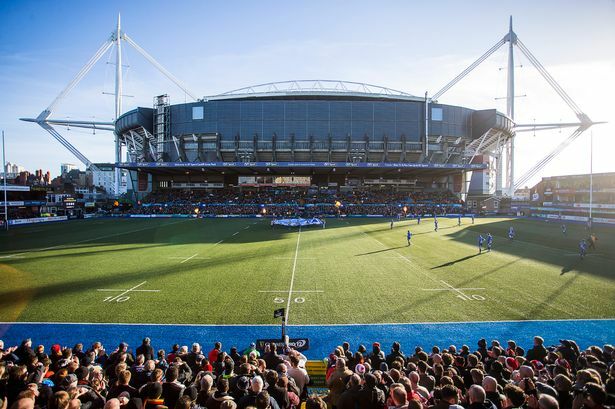 Cardiff Blues coach, Danny Wilson said: "Derby matches are always the games we all look forward to in a season, but to finish the PRO14 fixtures with Judgement Day will be particularly exciting for all involved." 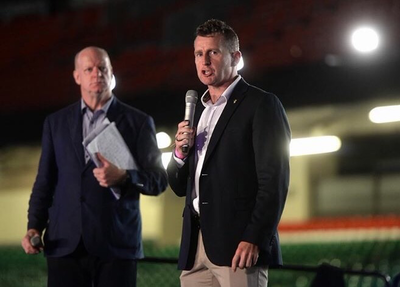 Dragons coach Bernard Jackman, said: "It will be my first Judgement Day event, but I've heard great things. There is obviously a lot of rugby to be played between now and then but it's an event we are all looking forward to." 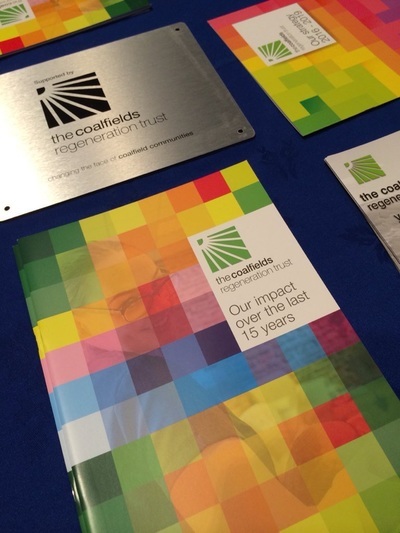 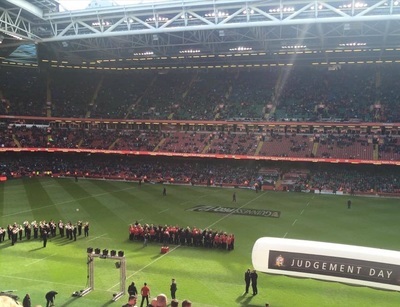 Lewis-Merthyr enjoyed a busy month in March with a series of engagements across South Wales. Saturday March 17th saw the band perform James Curnow's Brass Metamorphosis at the Brangwyn Hall, Swansea as part of the 2018 Welsh Regional Championships, and also enjoy rehearsal at the delightful Patti Pavilion. The band also featured in a major Voices & Brass concert with the Richard Williams Singers & Gentlemen Songsters at Llantrisant Parish Church on Friday March 23rd in aid of the Llantrisant Guildhall Restoration Project. The band also undertook two ensemble engagements at the former Lewis-Merthyr Colliery, now Rhondda Heritage Park, participating in their "Musical March" series on Saturday March 24th and at Coed Hills, St Hilary, Vale of Glamorgan on Sunday March 25th. 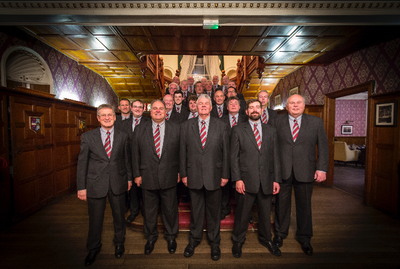 Regrettably the band's St David's Day concert on Thursday March 1st had to be postponed due to extreme inclement weather, however the rescheduled concert with now take place at our home venue ﻿St Johns Church, Cymmer﻿ together with our good friends of Cambrian Male Choir on Thursday May 10th. 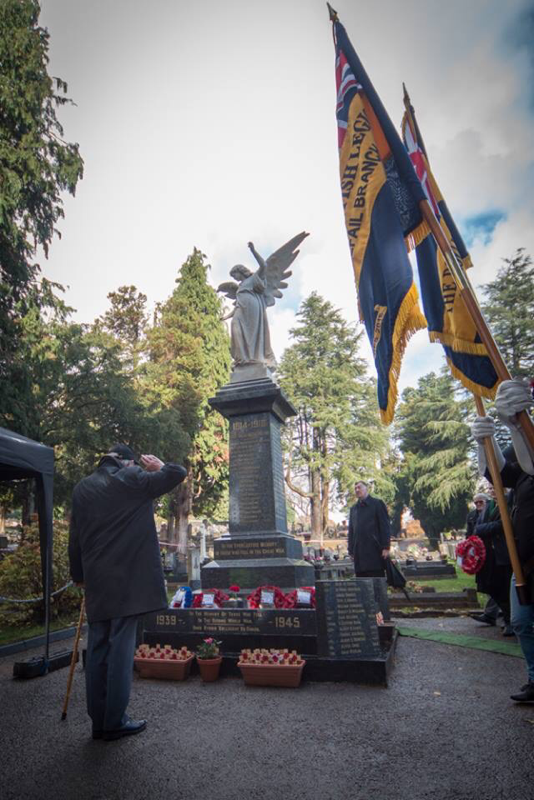 The band has recently discovered Pathe newsreel footage of the Cymmer Military Band parading for a visit of HRH Edward, Prince Of Wales, later King Edward VIII, to Rhondda on 7th December 1932. The band can be clearly seen - and heard! 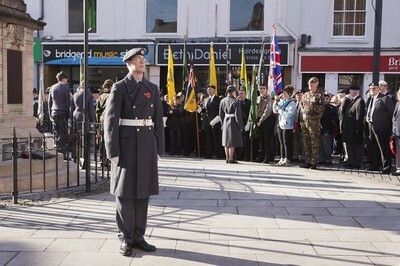 - c.0:55 seconds into the video, as they parade past HRH performing "Land of Hope & Glory". 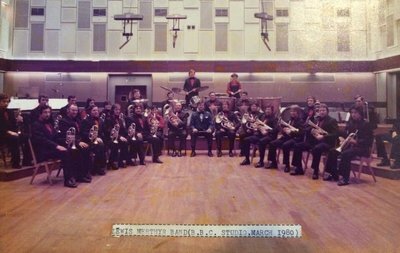 In a letter to Paul Williams and the band of March 1976, Muriel Amy Martyn, daughter of Mr G. F. Martyn, relates a tale of the visit, whereupon His Royal Highness, on seeing the band, remarks to his host, Colonel David Watts Morgan, "That's a damn fine band - who is it?". The quote is now included in the band's biography. On Thursday March 1st the band were due to undertake a St David's Day Concert together with Cambrian Male Choir, in aid of the Mayor's Charities at St John's Church, Cymmer. 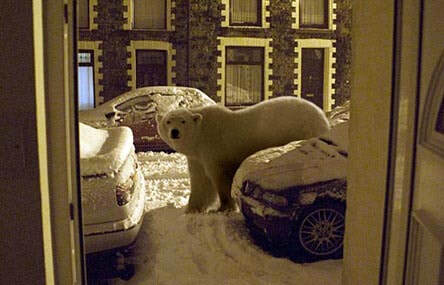 Due to the severe inclement weather across Wales that week however, the concert regrettably had to be postponed. 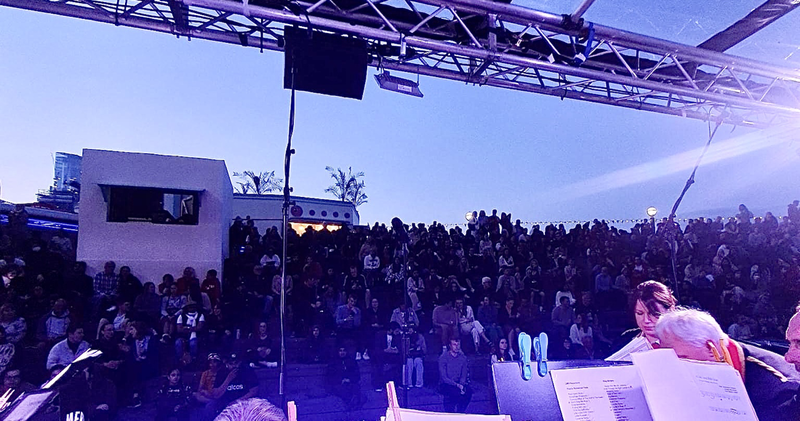 The performance has now been rescheduled for Thursday May 10th. 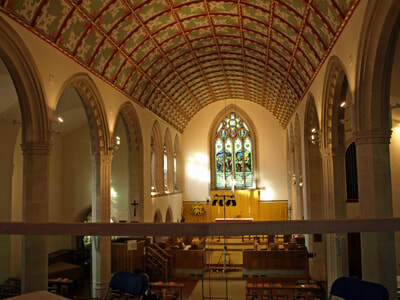 Tickets will be available online, and from St John's Church from Sunday March 24th. 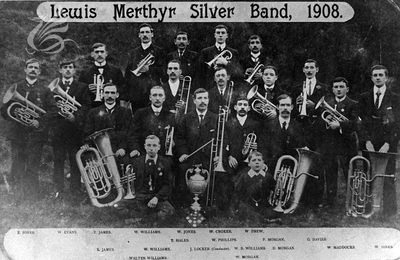 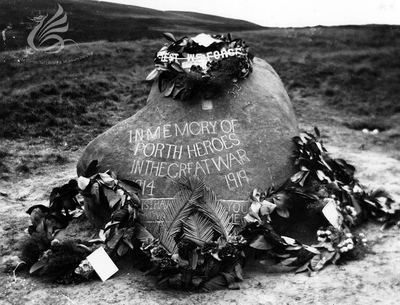 The band are currently undertaking research into the history of Lewis-Merthyr Band. 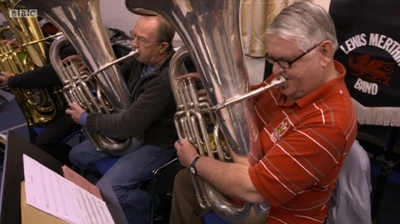 While previously thought to be founded in or around 1880, recent research can currently date the band back to 1855 or possibly before. Additional pages have also been added featuring the band's previous Broadcasts and Commissions together with a gallery of Historical Images of the band throughout the past 150 years. 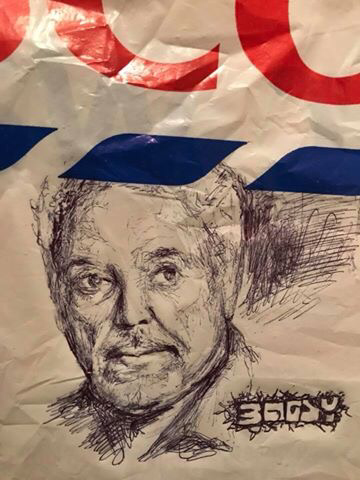 Lewis-Merthyr's own Brian Paull has been immortalised on "canvas" by the anonymous artist Bagsy. 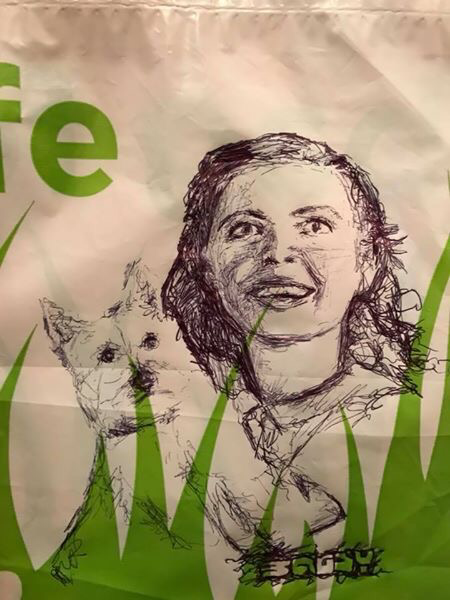 The Rhondda's own guerilla street artist - who models himself on the infamous Banksy - has captured images of a wide range of famous Rhondda and Welsh personalities, sketching them on supermarket carrier bags, which are then deposited anonymously in stores across the county borough for customers to discover. 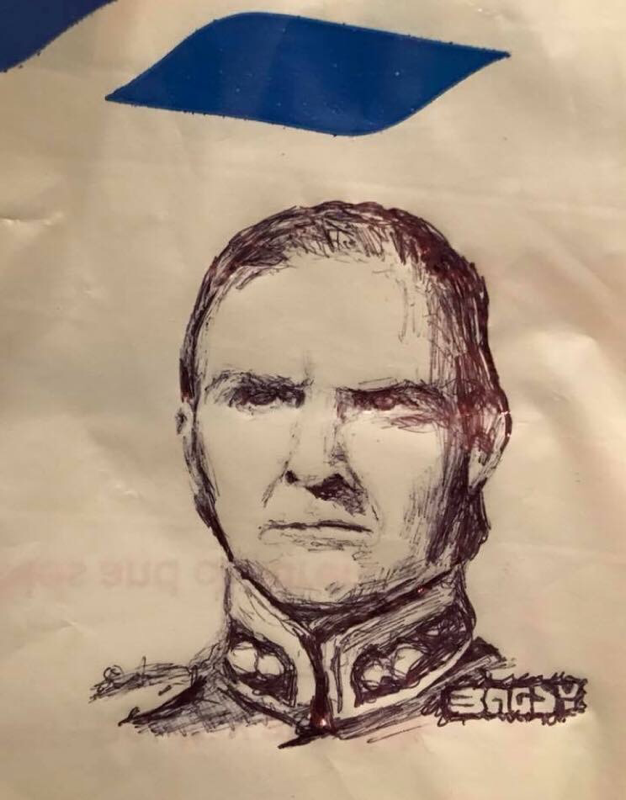 Personalities captured so far include Pontypridd born Sir Tom Jones, Ferndale born Zulu star Stanley Baker - and now Lewis-Merthyr's Brian Paull! The excellent sketch of Brian is based on an image from a recent photoshoot which members of the band undertook with photographer Elijah Thomas, the full selection of which can be found in the Gallery section of the website here The Bagsy recreation was revealed on the artist's social media accounts on Wednesday January 18th with the caption "Brian Paull, the oldest member of Rhondda's oldest brass band, Lewis-Merthyr". Brian is delighted to be featured in the artwork and, thanks to the artist's generosity, the original image is now en route to the band to be preserved in the Lewis-Merthyr collection of memorabilia amassed through 150 years of music-making in Rhondda. 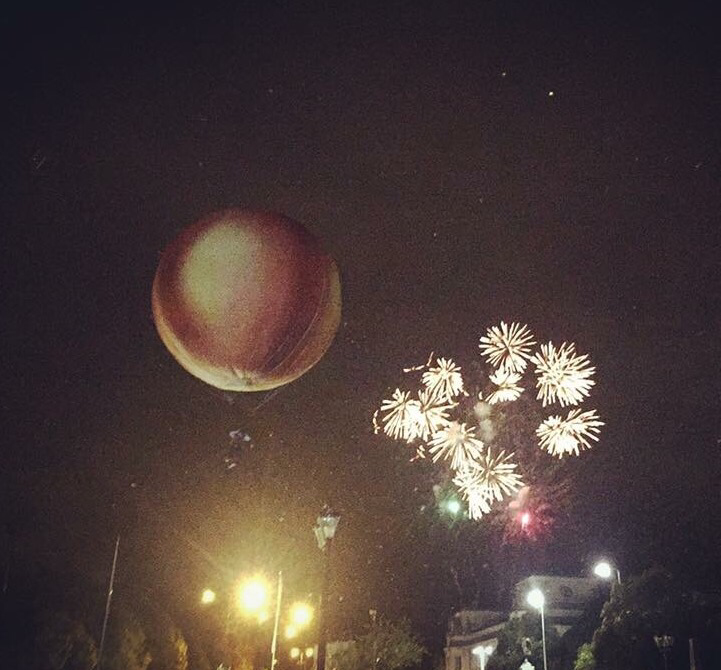 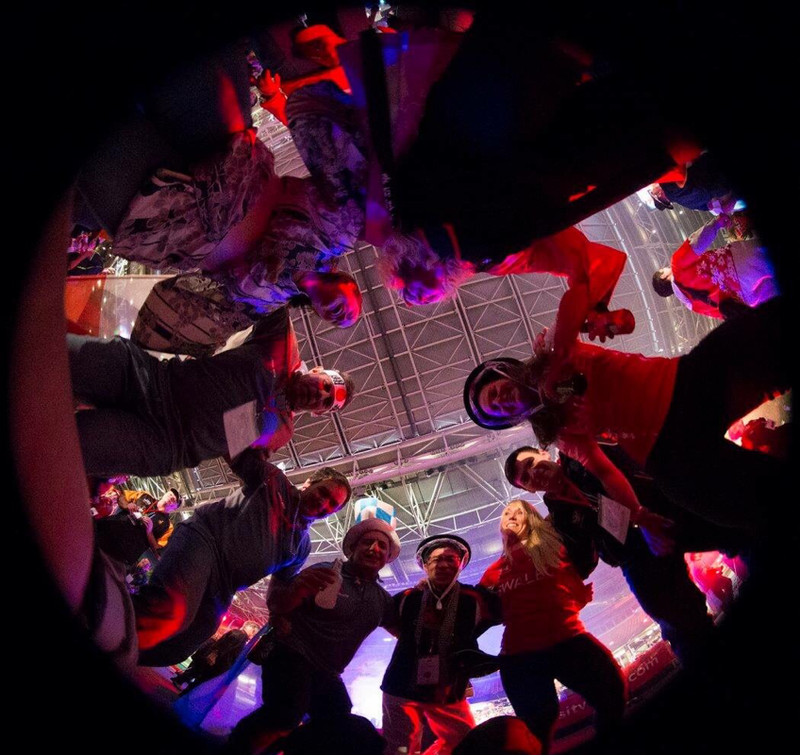 ​Happy New Year - New Members! 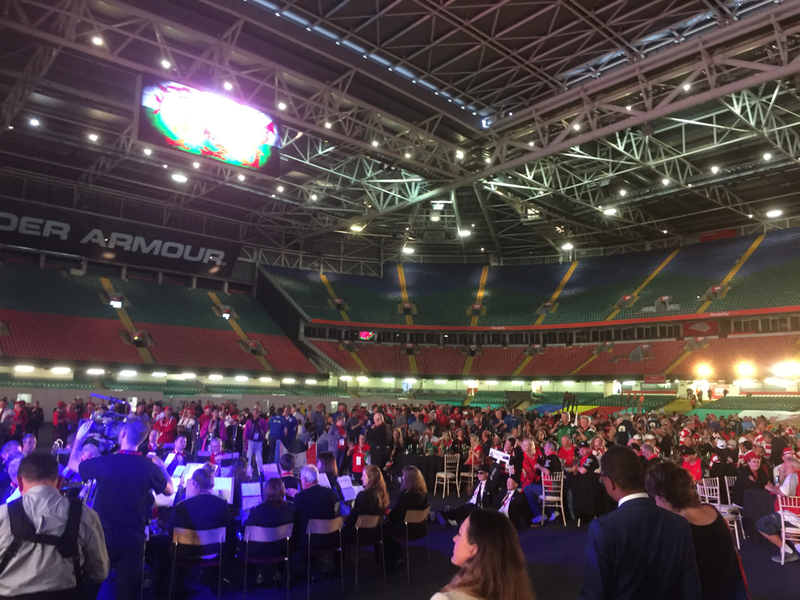 Lewis-Merthyr extends a warm new year welcome to new members for 2018, Jeremy Davies, Gemma Davies, James Davies and Alex Wellock. 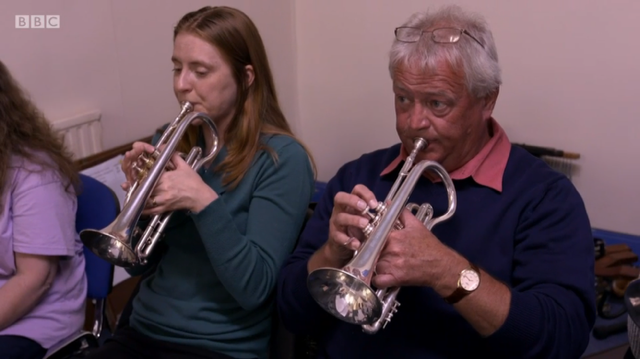 Husband and wife team Jeremy & Gemma hail from Ammanford, West Wales and join the band on Soprano Cornet and Horn respectively, while James is a respected peripatetic brass teacher with Gwent Music and joins the band on solo Eb Bass, together with Alex, a student at the University of South Wales, who joins the percussion team. The band is delighted to welcome all four new members to LMB. 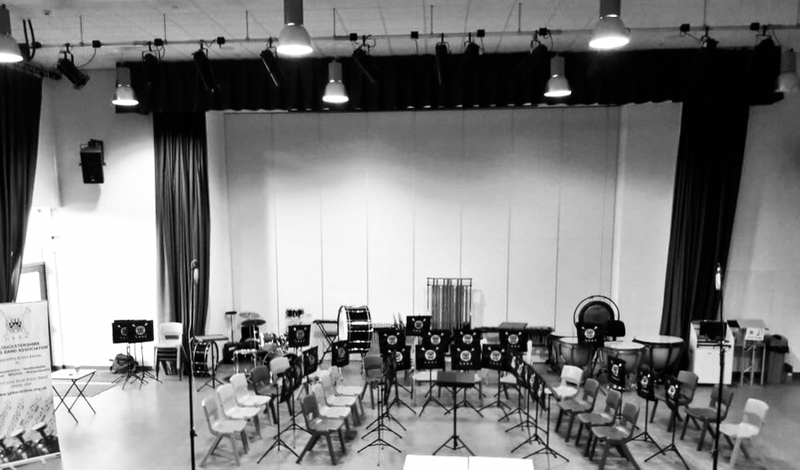 Lewis-Merthyr is always keen to hear from new members, particularly on Solo Cornet and Bb Bass at present, while seat share options also exist in other sections and is an option for heavily committed individuals. 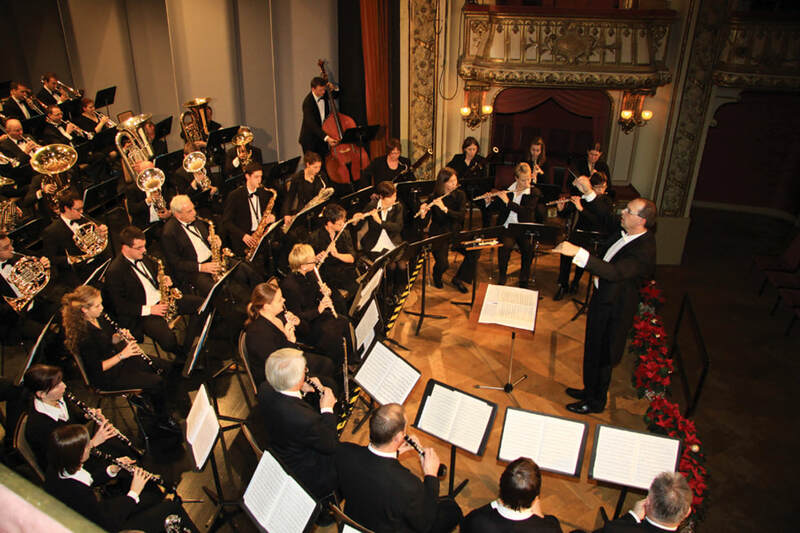 Rehearsals are held twice weekly on Monday & Wednesday evenings from 8:00 to 9:45pm and guest players are always welcome. 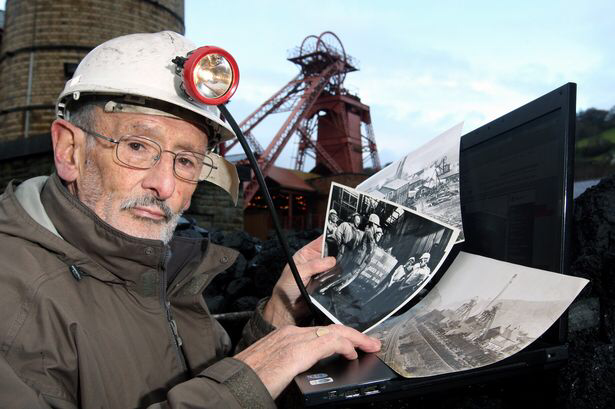 Several members of the band opened 2018 with a photo shoot at the former Lewis-Merthyr Colliery, now Rhondda Heritage Park, as part of a project being undertaken by photographer Elijah Thomas, capturing iconic images of Rhondda. 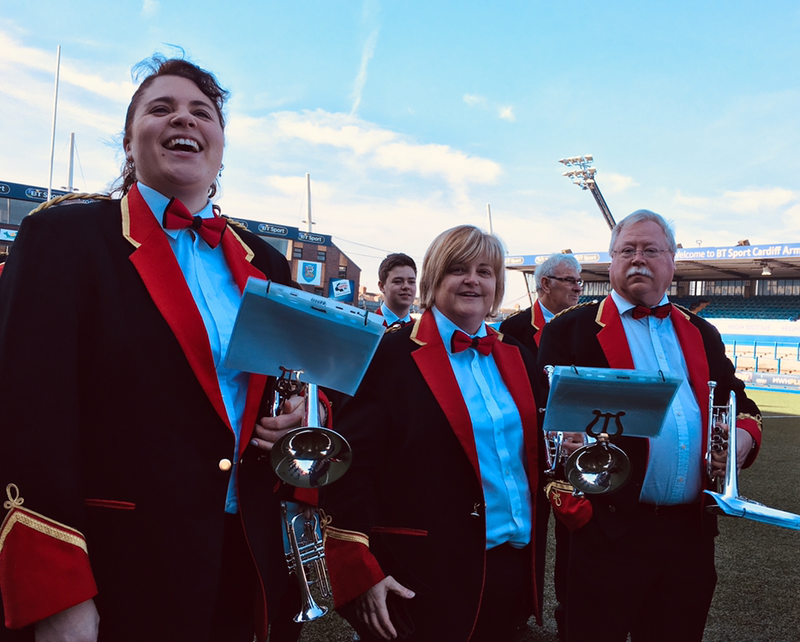 Participating in the shoot were two of the band's longest serving members, Brian Paull & Paul Williams (who between them hold over a century of membership of Lewis-Merthyr Band) plus two of our younger members, Rhiannon Griffiths & Laura Pegg. On Christmas Day, Lewis-Merthyr featured in a nationwide television broadcast with the legendary international baritone soloist Sir Bryn Terfel. 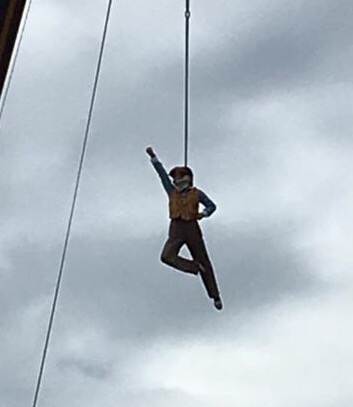 Filmed on location at the former Lewis-Merthyr Colliery - now Rhondda Heritage Park - the sequence featured a performance of Arwel Hughes' magnificent setting of John Hughes' Cwm Rhondda. 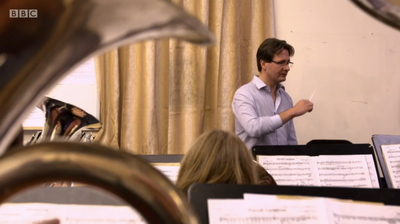 The arrangement for brass was specially transcribed for the band & Sir Bryn by Welsh composer Christopher Painter, and features an "amen" ending written by the composer's son, the famous orchestral conductor Dr. Owain Arwel Hughes CBE. The programme was broadcast on S4C at 21:00 on Christmas Day and remains available to view for a further 30 days online here The excerpt featuring the Cwm Rhondda performance can be found below. 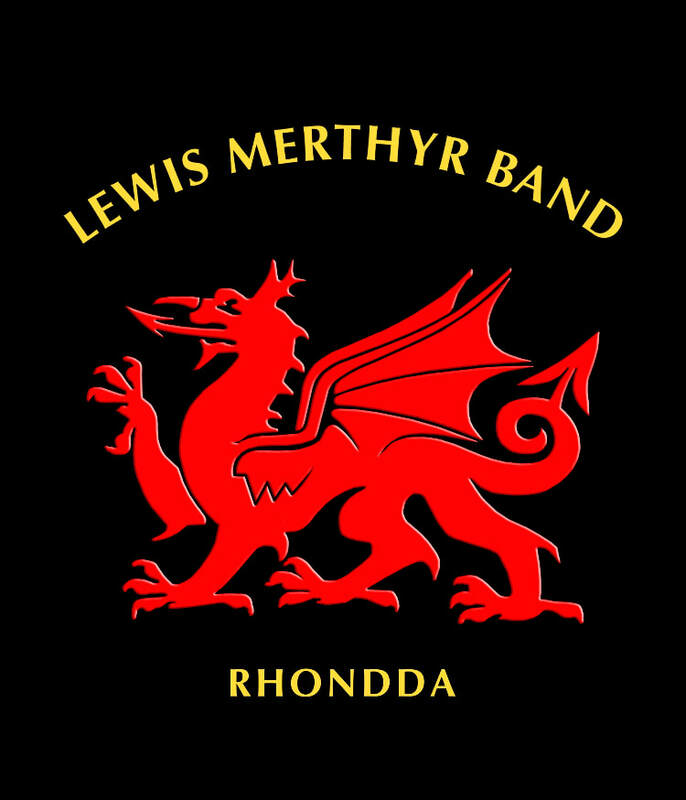 Lewis-Merthyr Band are the 2017 Welsh League First Section Champions! The band were awarded the prestigious Ruby Protheroe Memorial Trophy for the Champion Band of Wales in Section 1 for the first time in twenty one years following the band's success in the three Welsh League championship contests held across Wales throughout the calendar year. Lewis-Merthyr ended the year with a clear three place lead over the second placed band, and this bring to a close a very successful season for the band following our earlier success in winning the WWBBA Championship in early October and being placed Runner-Up SEWBBA Champions in the final contest of the year at the end of November. 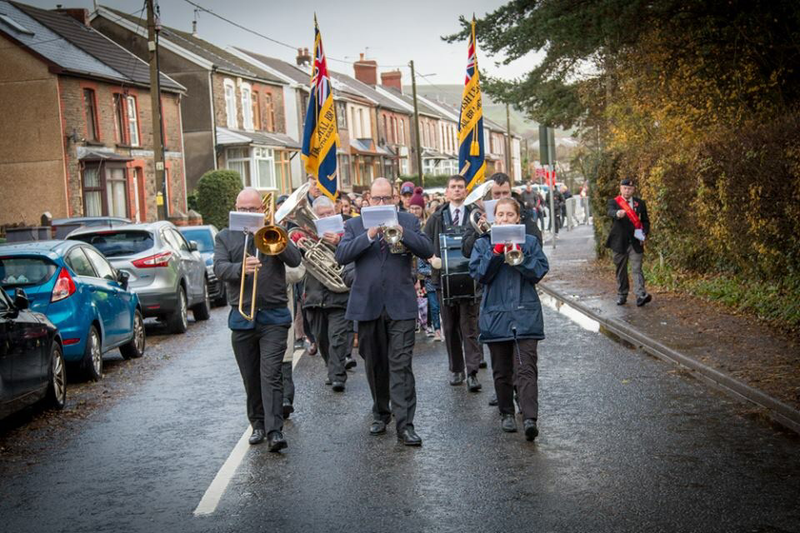 Lewis-Merthyr Band enjoyed a busy December, undertaking a series of engagements across South Wales throughout December. 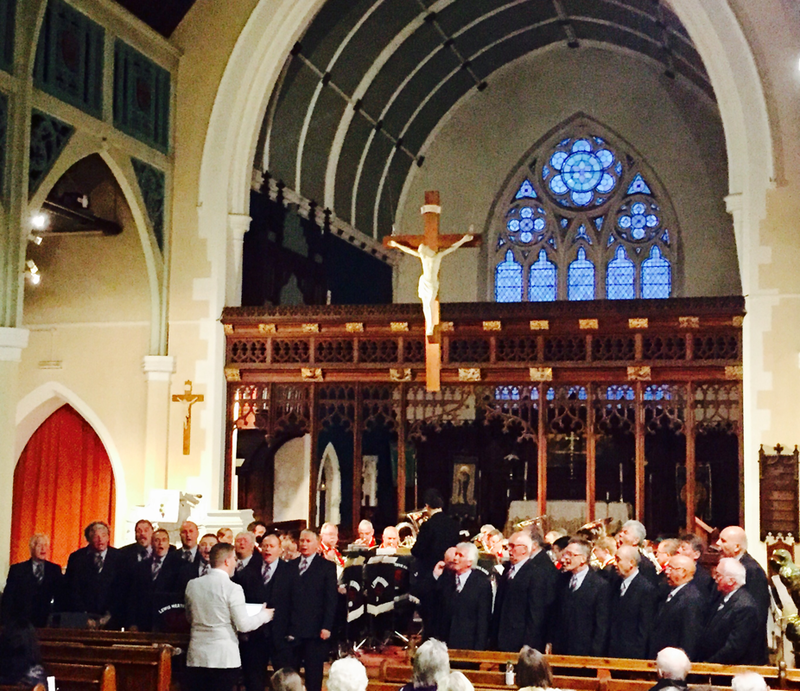 Additional highlights of the festive calendar also included our annual concert at St John's Church, Cymmer, where this year we shared the stage with Ogmore Valley Male Choir, and our final full band performance of the year, the very moving Christmas Service at Coychurch Crematorium. 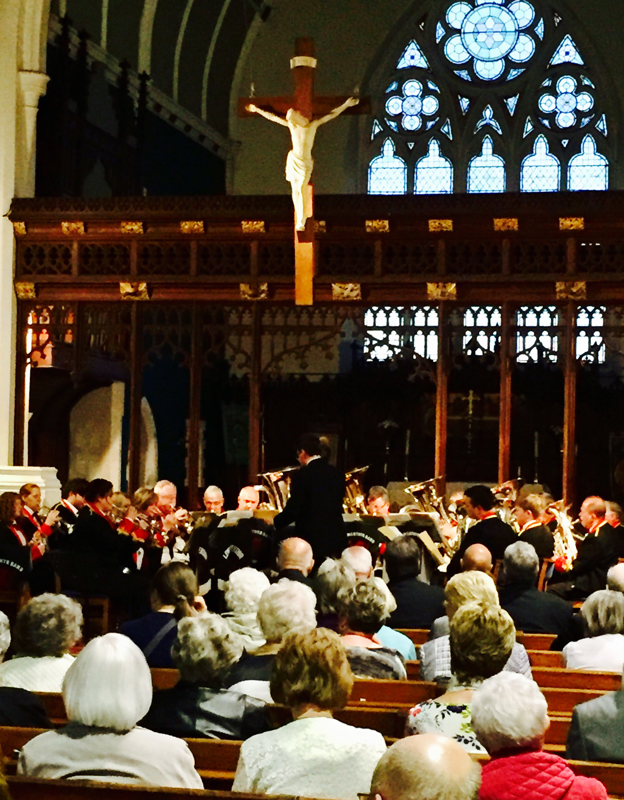 The band recently undertook two of our popular Brass & Voices performances together with our good friends at Pendyrus Male Choir and Bois Goetre-Hen a'r Cylch. 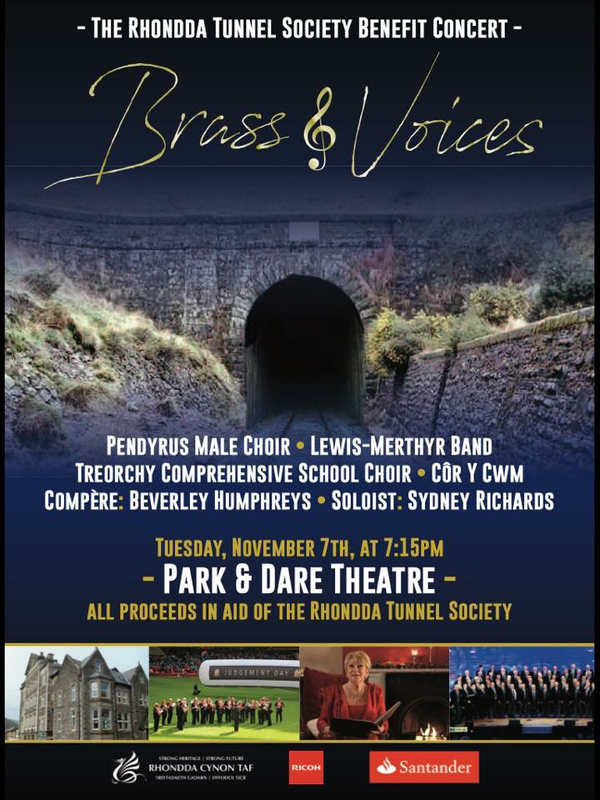 The first was held at the Park & Dare Theatre, Treorchy on Tuesday November 7th, once again raising funds for the Rhondda Tunnel project. In addition to Lewis-Merthyr and Pendyrus, the performance also featured BBC Radio Wales' Beverley Humphreys, Cor Y Cym, Treorchy Comprehensive School Choir and soloist Sydney Richards was tremendously received by the large and appreciative audience in attendance. 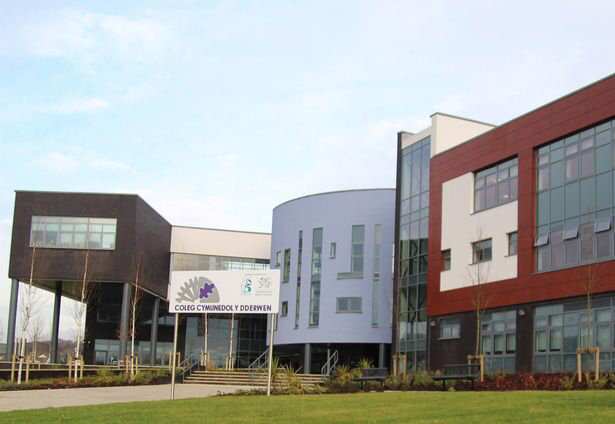 The second was held at Coleg Cymunedol Y Dderwen, Tondu with Bois Goetre-Hen a'r Cylch on Saturday November 18th. The band were delighted to share the stage with Bois Goetre-Hen once again and thrilled with the very warm welcome and standing ovation received. 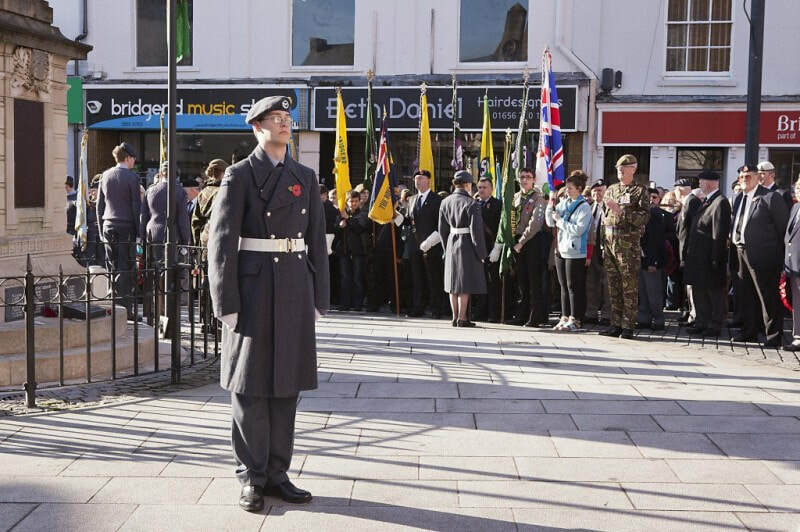 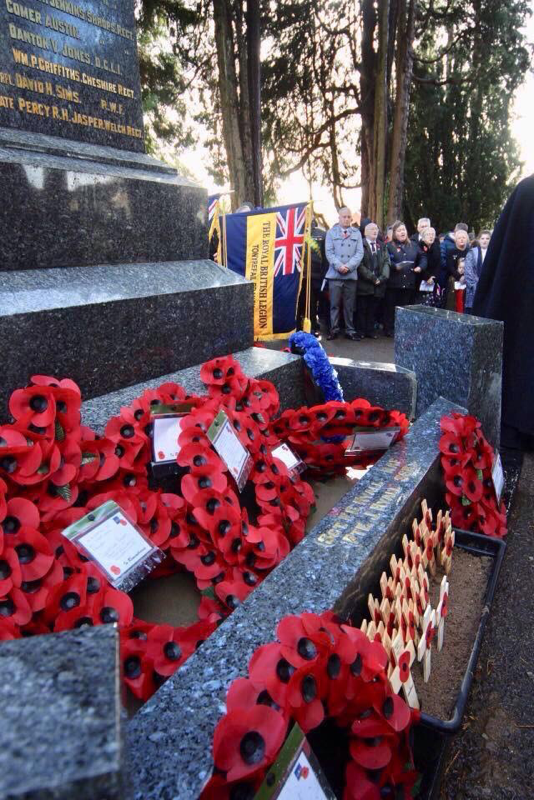 On Sunday November 12th, Lewis-Merthyr Band once again performed in support of Remembrance Day services and parades, this year in Bridgend, Tonyrefail & Penarth. 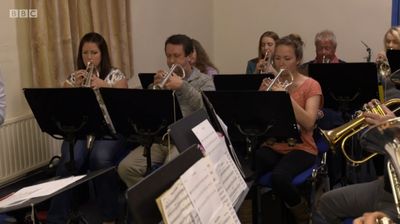 The band were delighted to undertake a recording session with Rondo Media for S4C’s popular Band Cymru television programme. 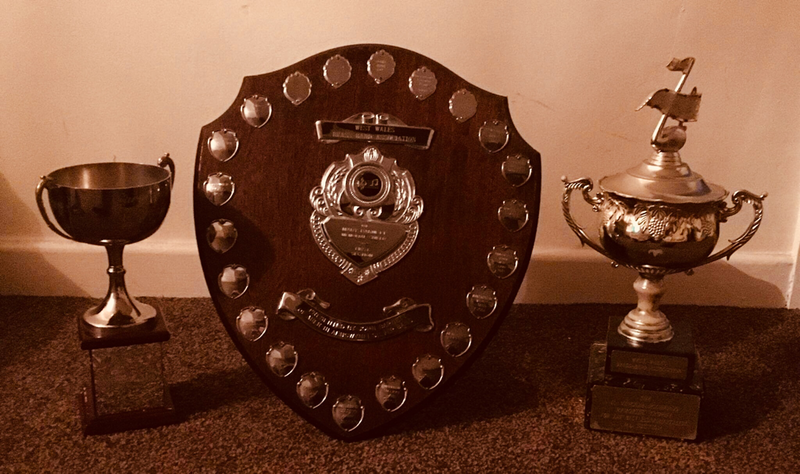 Our thanks go to all members & friends who performed with us on the recording, with particular thanks to WWBBA Best Instrumentalist Award Winner Zoe Alexander, who was finally united with the H. Vincent Richards Trophy following her winning performance with Lewis-Merthyr last month. 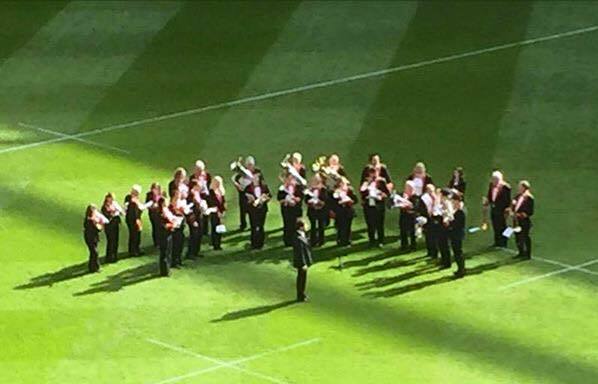 Our best wishes go to Zoe in her new position at the Flowers Band in Gloucester. 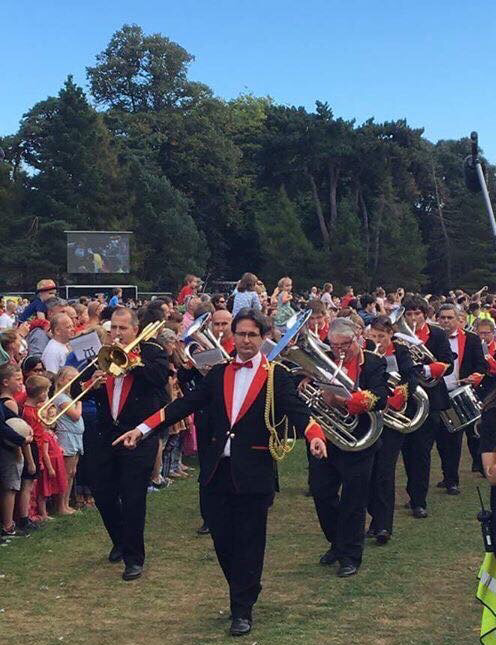 The band now look forward to two of our popular Brass & Voices performances at the Park & Dare Theatre, Treorchy with Pendyrus Male Choir on Tuesday, November 7th at 7:15pm, and at Coleg Cymunedol Y Dderwen, Tondu with Bois Goetre-Hen a'r Cylch on Saturday November 18th at 7:00pm. 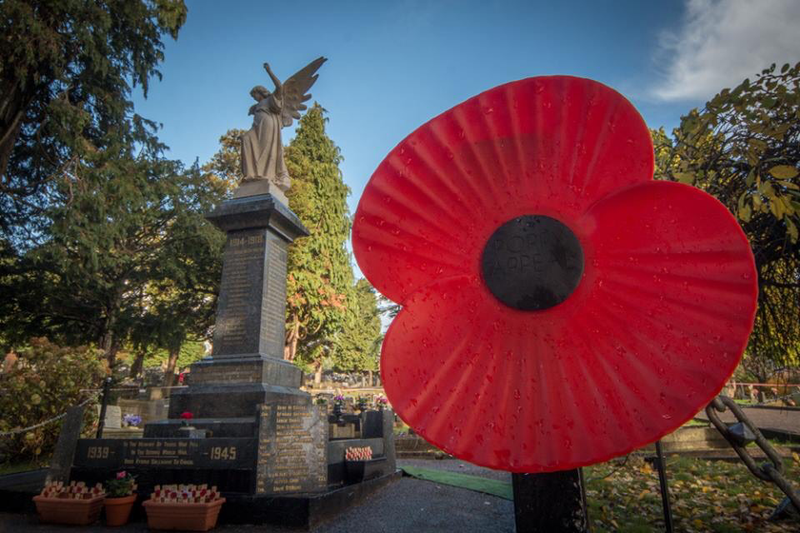 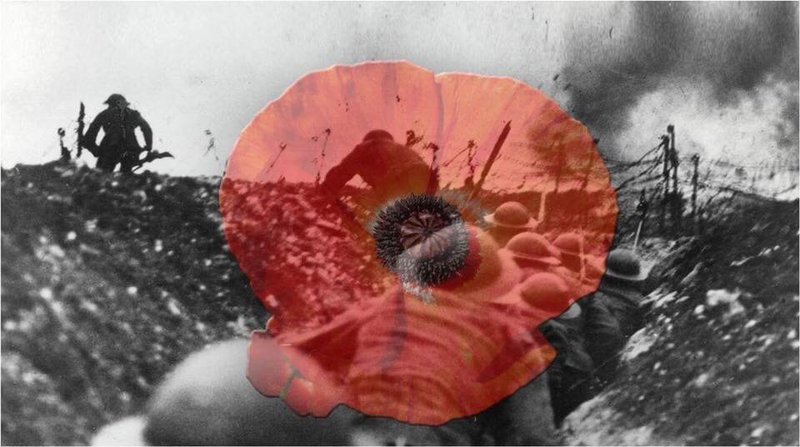 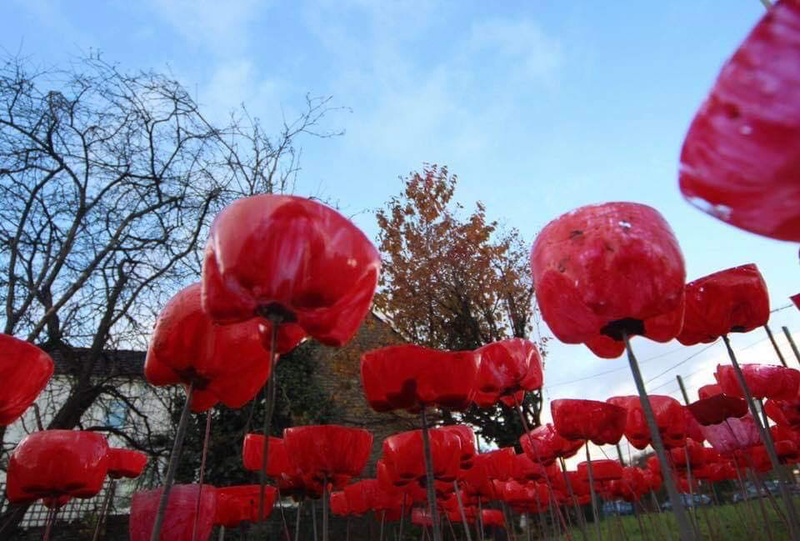 The band will also be supporting three Remembrance Day services at Tonyrefail, Bridgend and Penarth on Sunday November 12th. 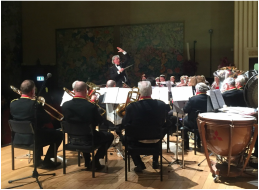 Lewis-Merthyr Band have been proclaimed the 2017 West Wales Brass Band Association First Section Champions. 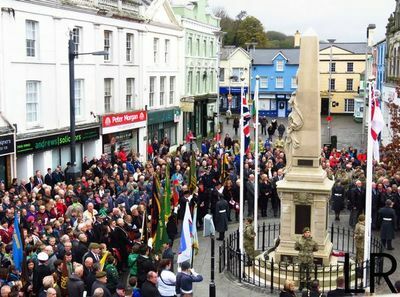 The accolade was awarded to the band following a decisive victory at the championships, held this year at the Memorial Hall, Burry Port, Carmarthenshire. 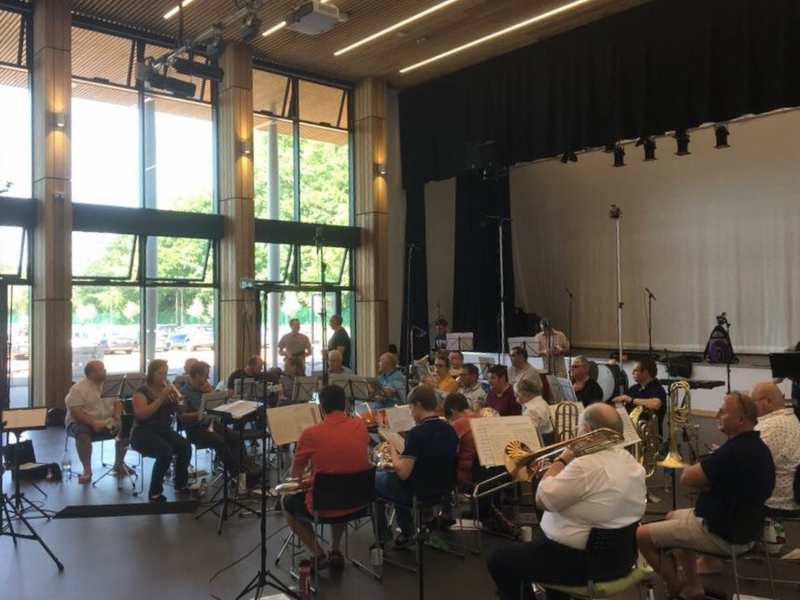 Adjudicator Ian Porthouse described the band's performance of the American composer James Curnow's "Brass Metamorphosis" as "well shaped" and "well directed" with "great energy". 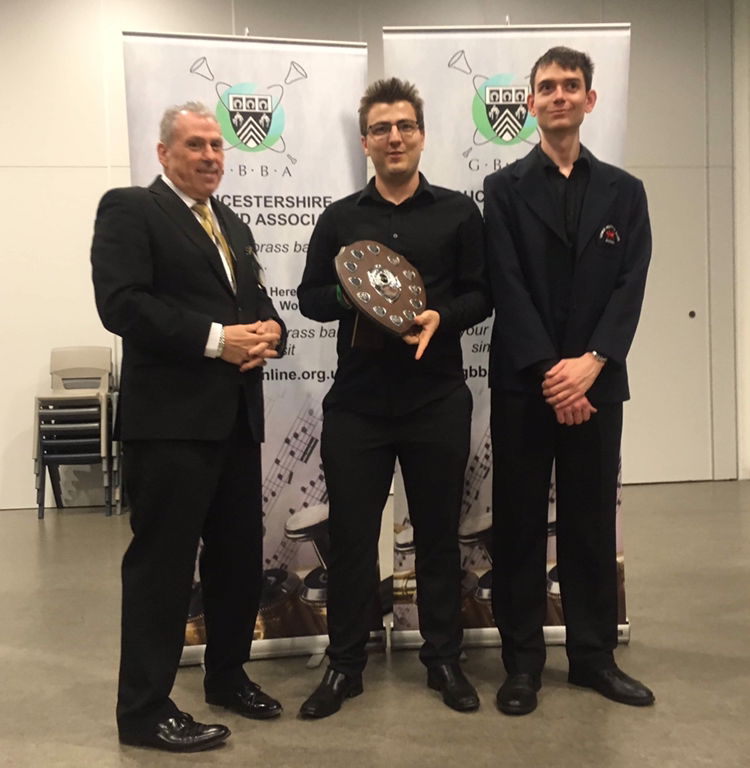 Ian awarded the band 190 out of a possible 200 points, together with additional awards for the Best Soloist to guest flugel Zoe Alexander and the Conductor's Award to Musical Director Craig Roberts. 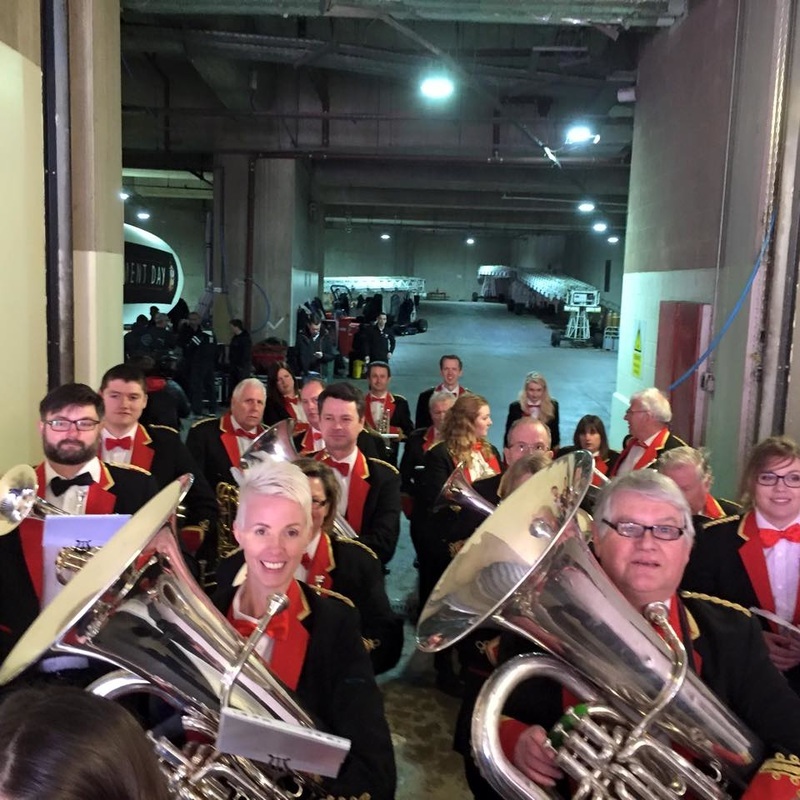 The band are delighted with this success and our thanks go to each and every member of the band for all their continued hard work and commitment. 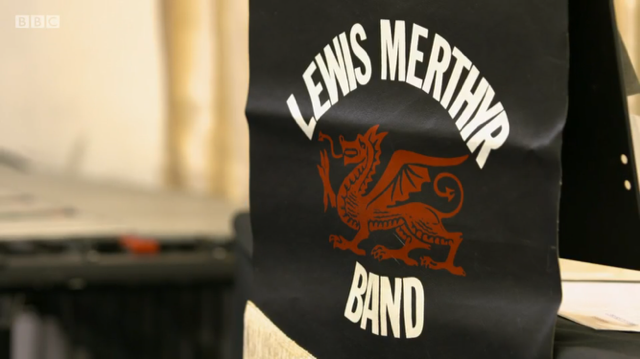 Lewis-Merthyr now look forward to a busy month in November, which will see a recording session for S4C on Sunday November 5th, as well as the band supporting Remembrance Day events in Bridgend, Penarth and Tonyrefail. LMB will also undertake two of our popular Brass & Voices concerts at the Park & Dare Theatre with Pendyrus Male Choir on Tuesday November 7th, and at Coleg Cymunedol Y Dderwen, Bridgend with Bois Goetre Hen a'r Cylch on Saturday November 18th. The band will then close the month, and contesting year, with the final competition of the 2017 Welsh League series at Merthyr Tydfil on Saturday November 25th, performing Gilbert Vinter's "Spectrum". 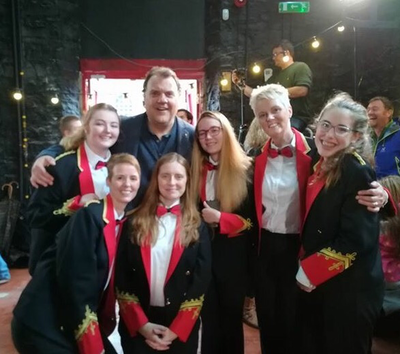 On Sunday October 1st, the band was delighted to feature in a television recording with the legendary international Welsh opera star Sir Bryn Terfel. 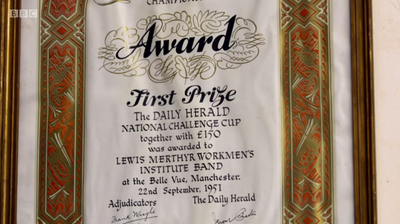 The filming was undertaken on location at the Rhondda Heritage Park, the site of the Lewis-Merthyr Colliery. Together with Sir Bryn, the band recorded a special setting by the Welsh composer Arwel Hughes of the traditional Welsh hymn Cwm Rhondda. 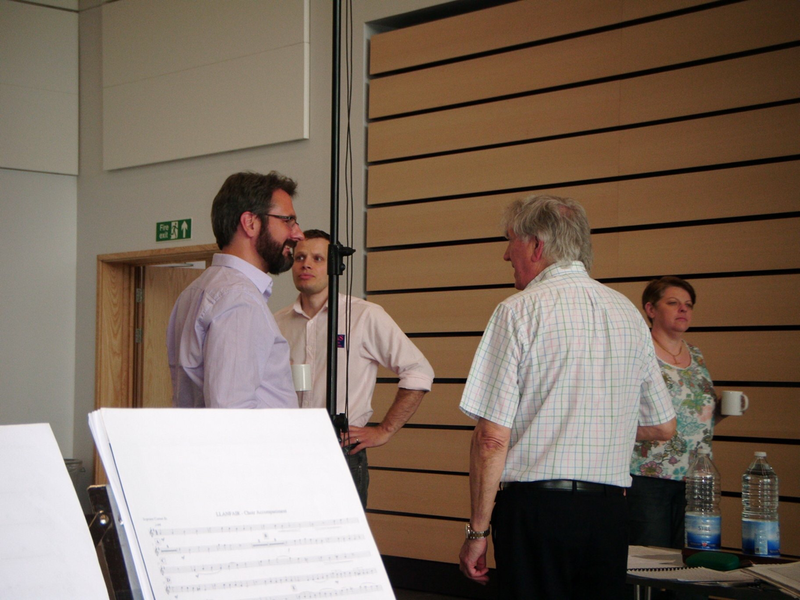 The arrangement was transcribed especially for the occasion by Christopher Painter, with a special "Amen" ending written by the composer's son, the renowned Welsh conductor Owain Arwel Hughes CBE. The band had an incredible time working on the project and are delighted to be featured in a broadcast of this magnitude. The resultant film will feature in the final episode of Sir Bryn's new television series "Taith Bryn Terfel - Gwlad Y Gan" and will be broadcast nationwide on or around Christmas Day. 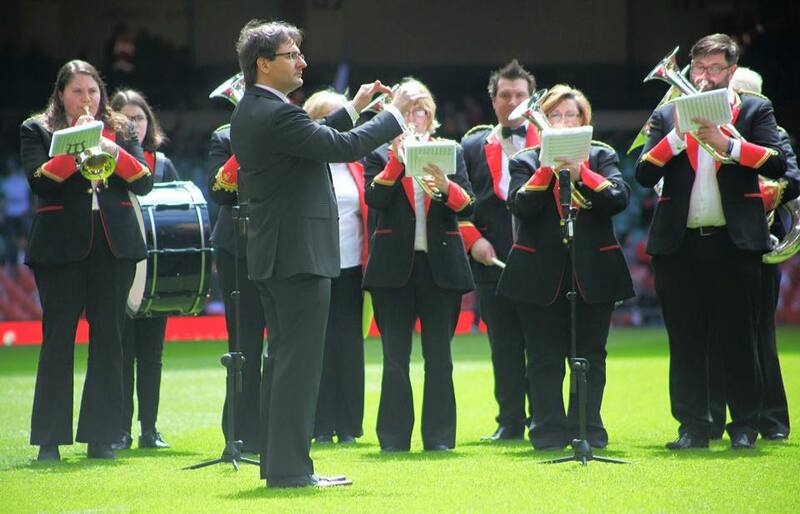 Lewis-Merthyr Band extends a warm welcome to new members Dave Short, Ffion Short, Brian Cleworth & Craig Maunder. 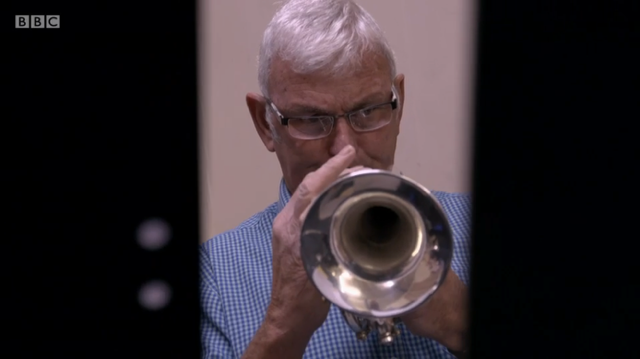 Dave is very well known and respected figure in brass bands and the wider musical world in Wales, holding the bass trombone position with Cory, Sun Life and the Liberty Big Band. 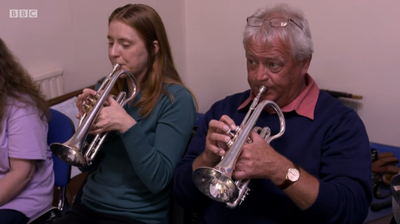 Dave returns to the band together with his daughter Ffion, a very welcome new member of the LMB cornet section. Brian is a member of the Prince of Wales Division Band, one of the new British Army brass bands based at RAF St Athan, while Craig Maunder, formerly of Llwydcoed Band, Ebbw Valley Brass and a longstanding current member of Canton SA Band, joins us in the percussion section. 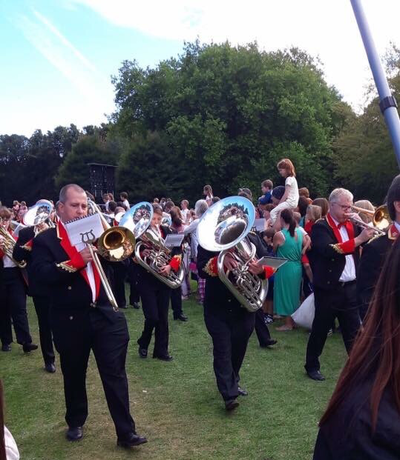 The band is delighted to welcome all four new members to LMB. 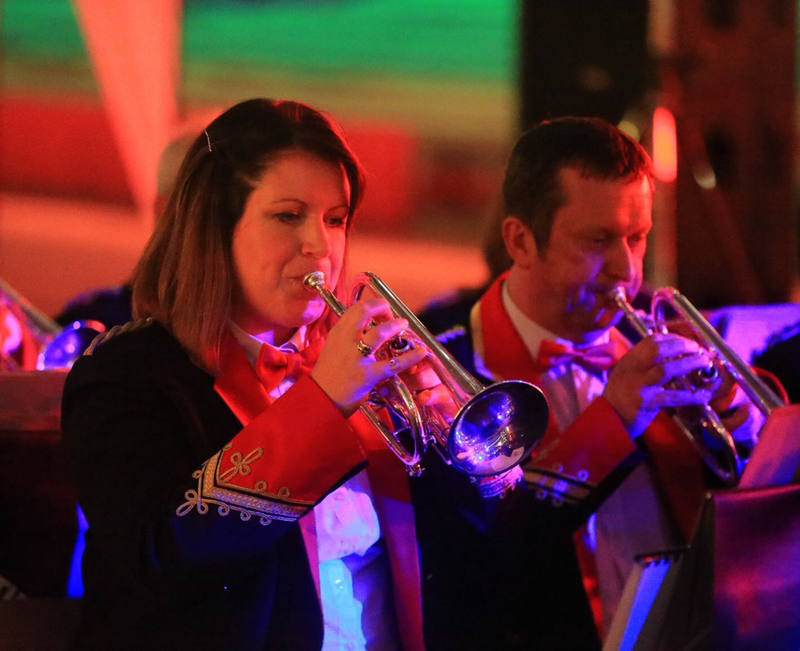 The band still has limited remaining vacancies on Cornet, Horn and Bb Bass. ​Our forthcoming engagements include concerts at the Park & Dare Theatre, a very special filming session for S4C television and more.​Images from recent engagements at the Principality Stadium, and appearances in London, Cardiff and wider, can be found in the Gallery section of the website here. 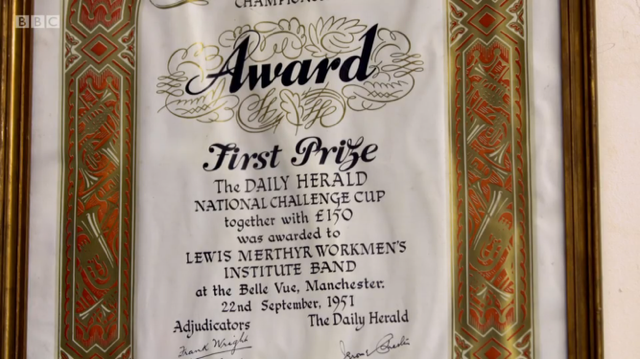 Lewis-Merthyr were again featured on BBC television in an additional screening of Episode 2 of "The Taff: The River That Made Wales" with Will Millard, screened on BBC Four on August 16th. 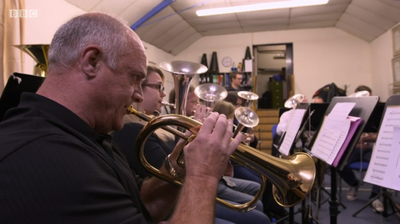 The episode features the band and interviews with Trustee Ivor England - a former miner at the Lewis-Merthyr Colliery - plus Musical Director Craig Roberts and members of the band. The band is also featured performing excerpts of Cwm Rhondda, Kenneth Downie's Purcell Variations and the Miner's Hymn, Gresford. 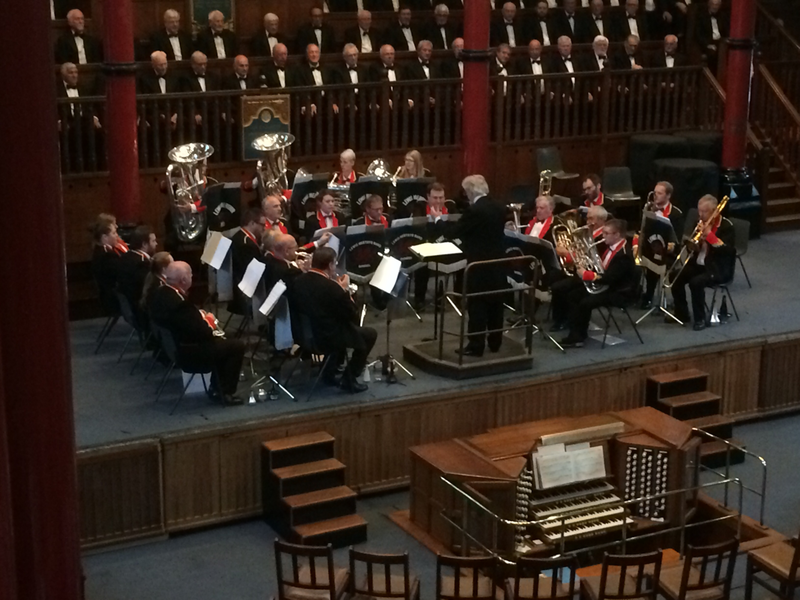 On Saturday June 17th, Lewis-Merthyr Band featured in a gala performance entitled Brass & Voices of Wales in the magnificent setting of the Old Speech Room at Harrow School, conducted by leading Welsh orchestral conductor Owain Arwel Hughes CBE. 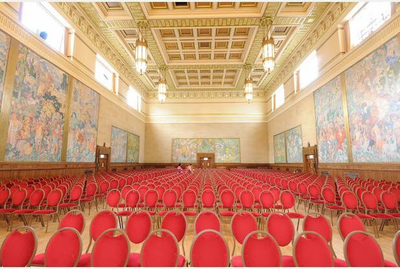 The concert followed in the highly successful series of performances held annually at the Welsh Proms in St David's Hall, Cardiff each summer and in additional concert halls across the Principality, including the famed Llangollen International Eisteddfod. 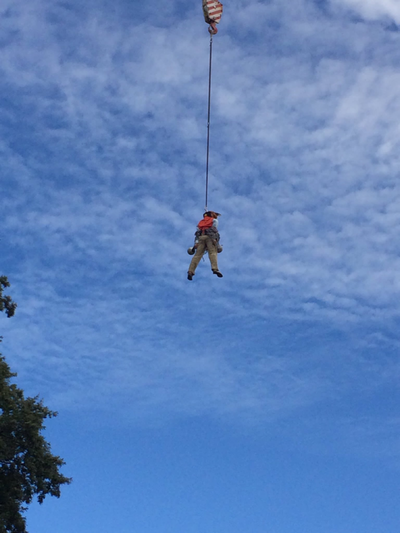 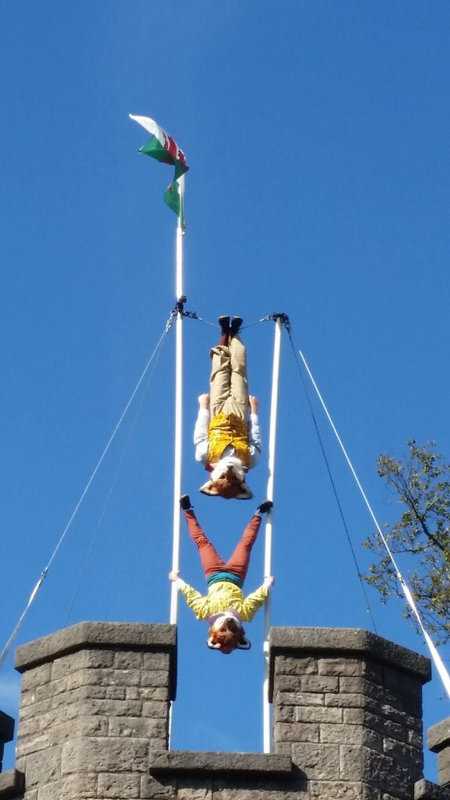 This particular performance had been organised to raise much needed funds for St Mary's, Harrow On The Hill and all proceeds from the event were donated directly to the St Mary's Roof Fund. 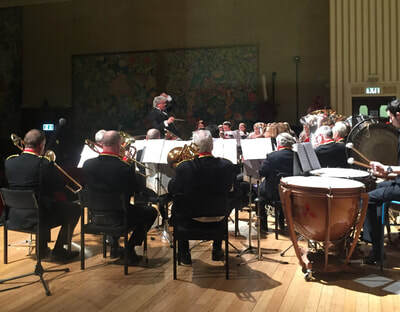 The band appeared alongside the 80 strong Bridgend Male Choir, in a programme that included Borodin's Danses Polovtsiennes, the epic March from Respighi's Pines of Rome and a wealth of traditional Welsh choral classics, including Myfanwy, Cwm Rhondda & more. 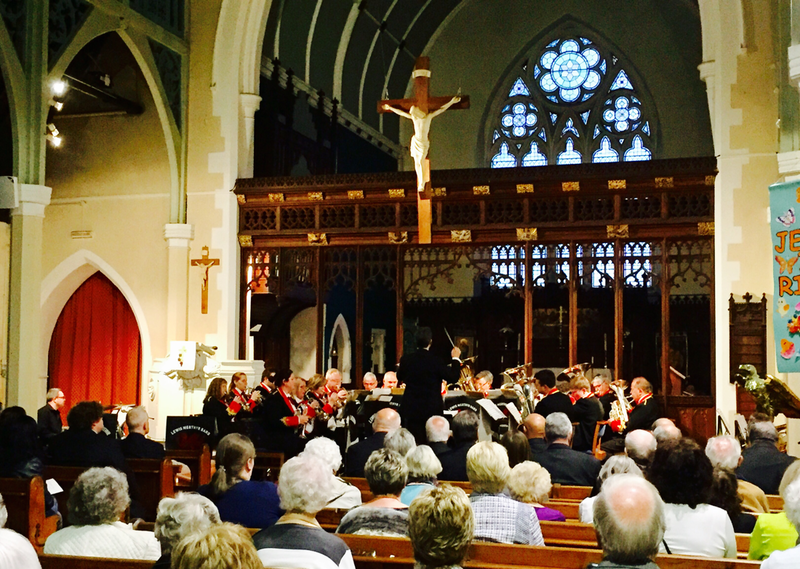 The band recently enjoyed an excellent Brass & Voices concert at St John's Church, Cymmer with our good friends Bois Goetre-Hen a'r Cylch Male Choir of Tondu. 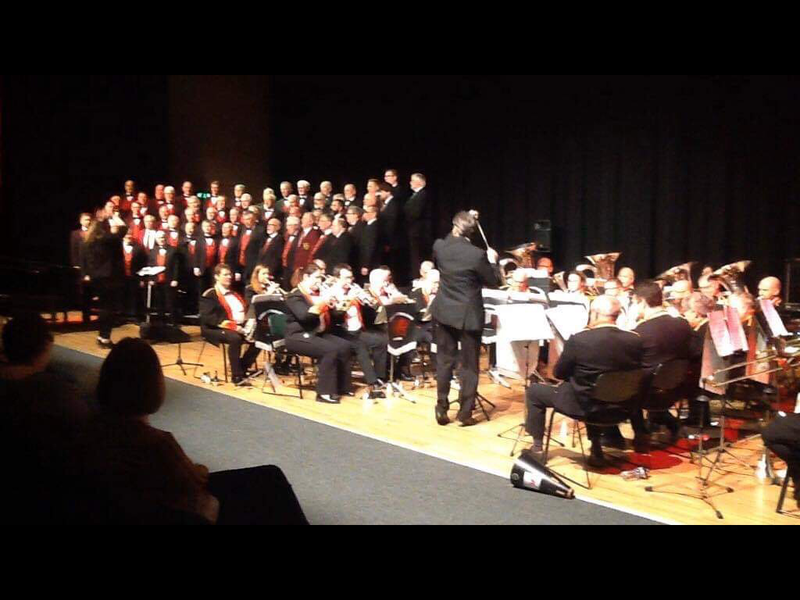 Both band & choir now very much looking forward to performing together again in Tondu on Saturday November 18th. 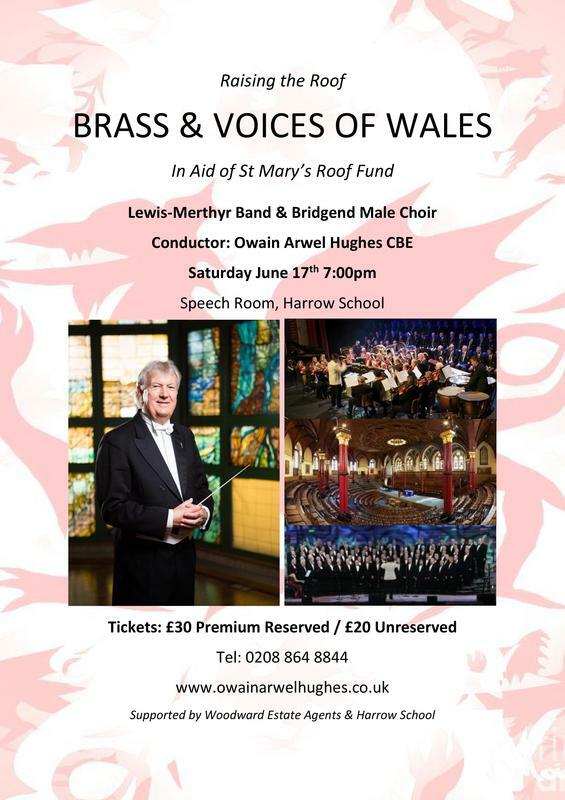 Lewis-Merthyr's next Brass & Voices performance will be in Harrow, London on Saturday June 17th, together with Bridgend Male Choir, where both groups will perform under the baton of the renowned orchestral conductor & Welsh Proms Artistic Director Owain Arwel Hughes CBE. 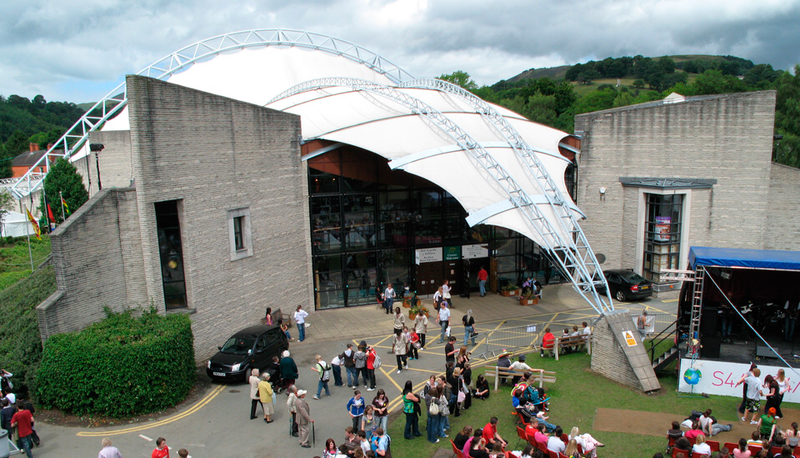 Further information on the event can be found below. 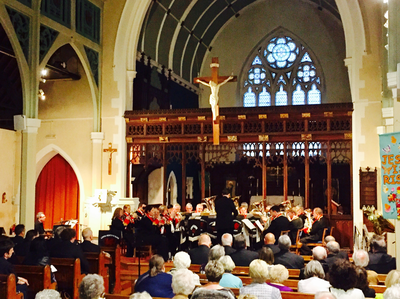 Thank you again to all members and to all in attendance for an concert at St John's. The band will return to the venue for our Christmas Concert on Thursday December 7th. 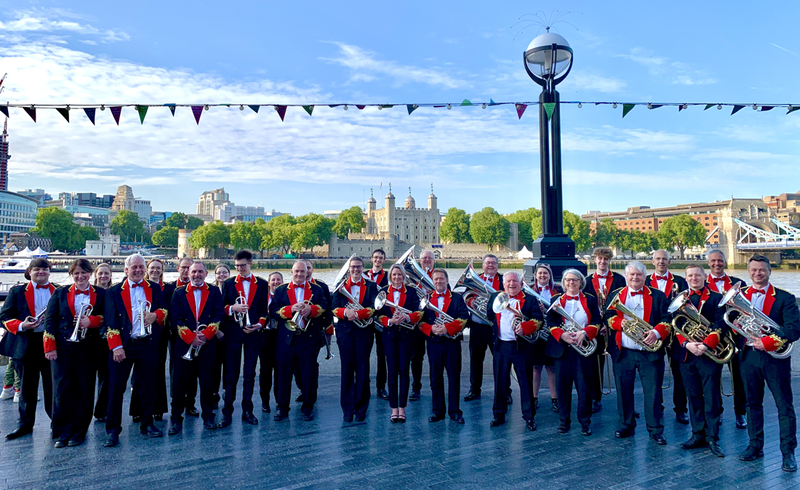 Following the success of our previous St David's Day event at the Brangwyn Hall, Swansea, this Spring / Summer Lewis-Merthyr will undertake two major Brass & Voices performances in Harrow, London and our hometown of Cymmer, Rhondda. 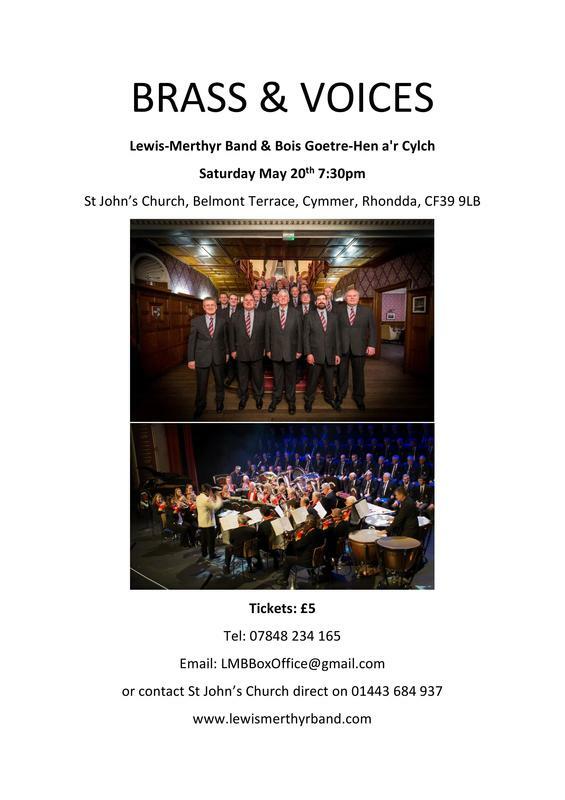 The first concert will be on home turf, and see the band perform together with Tondu based choir Bois Goetre-Hen a'r Clych, on Saturday May 20th at St John's Church, Cymmer. 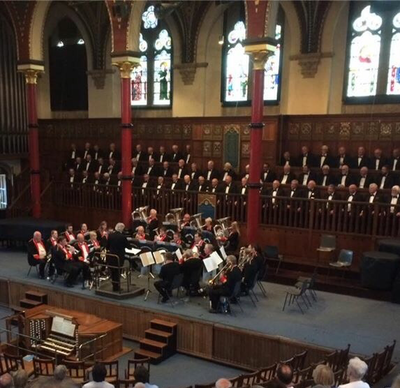 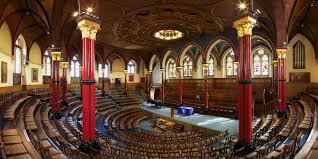 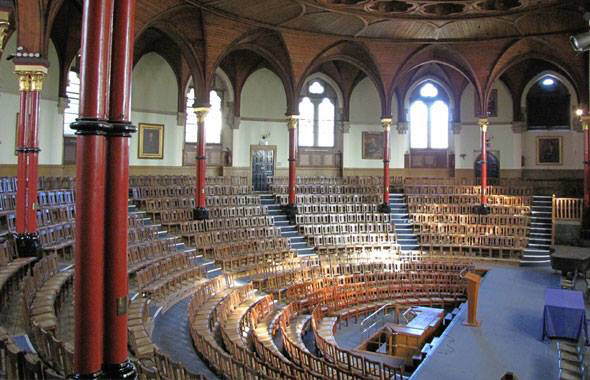 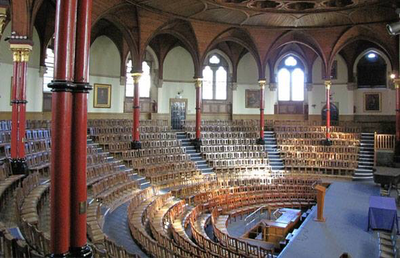 The second performance will then take place on Saturday June 17th in the magnificent setting of the Harrow School Speech Room, where the band will perform, together with Bridgend Male Choir, under the baton of legendary Welsh orchestral conductor Owain Arwel Hughes CBE. 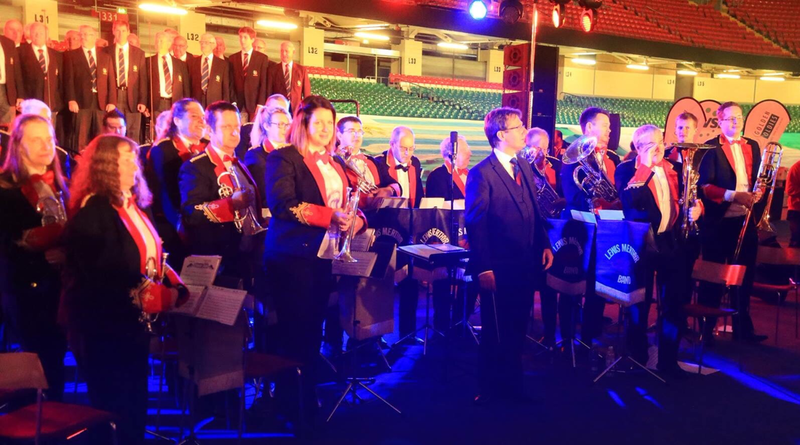 In the first of the Welsh League Championships of 2017, the band were awarded 4th place at the SEWBBA Championships in Merthyr Tydfil. This places the band currently third in the First Section of the League, ahead of the second stage of the championships at Burry Port, West Wales on Saturday October 7th. 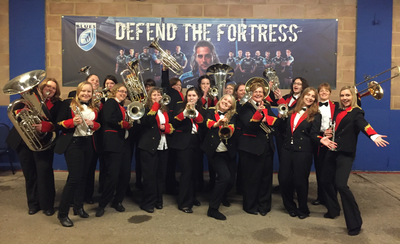 An ensemble from the band were delighted to support the recent Black Army Minis Super 7s Rugby Festival at Llantrisant RFC. 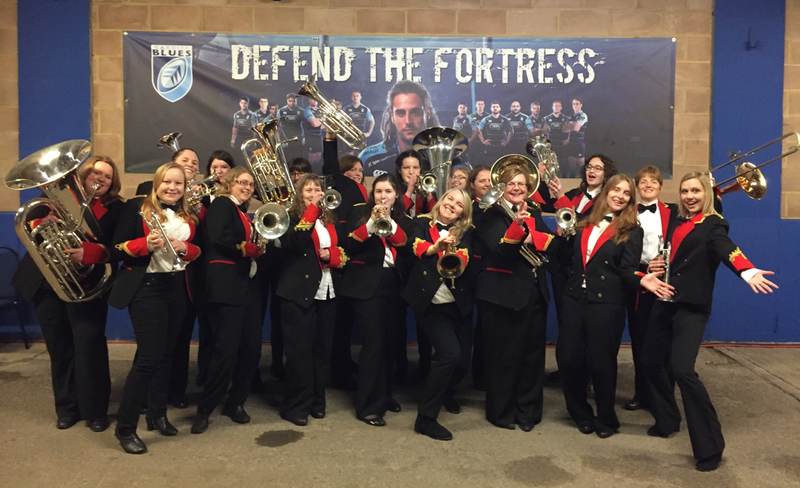 The female members of LMB were delighted to recently perform at the 2017 Six Nations Championships supporting both the Wales v England and Wales v Ireland women's international rugby matches at Cardiff Arms Park, on Saturday February 11th and Saturday March 11th respectively. For the matches, the members undertook a national first, forming part of Wales' first all-female brass band! 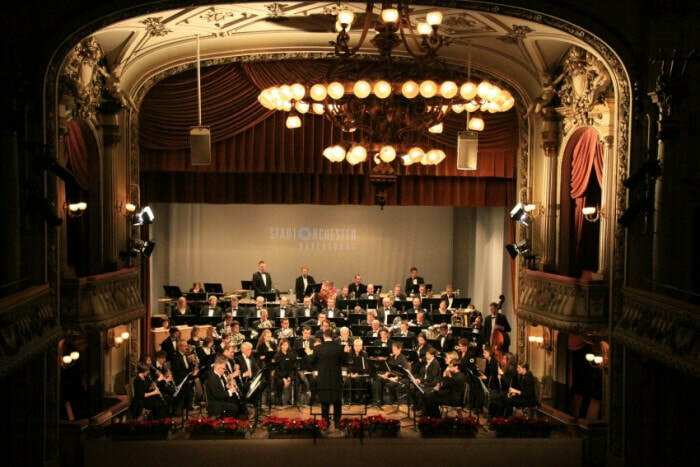 The band performed together with two 100 voice all-female choirs. 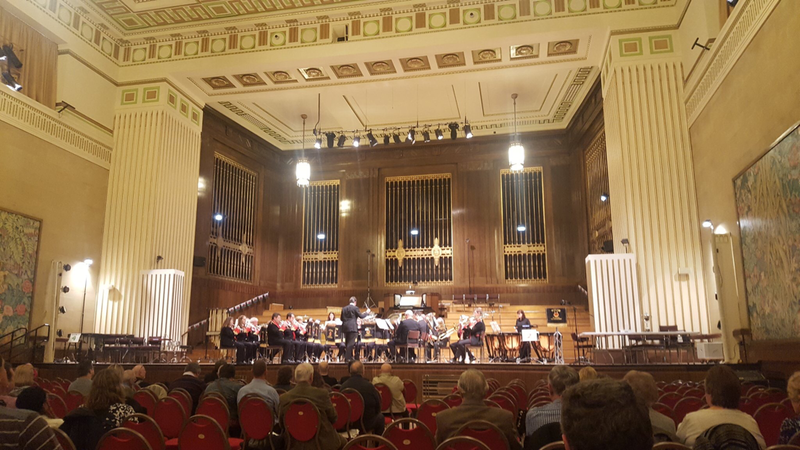 The band were delighted to once again perform at Swansea's magnificent Brangwyn Hall in the 2017 Welsh Regional Championships on Saturday March 18th. 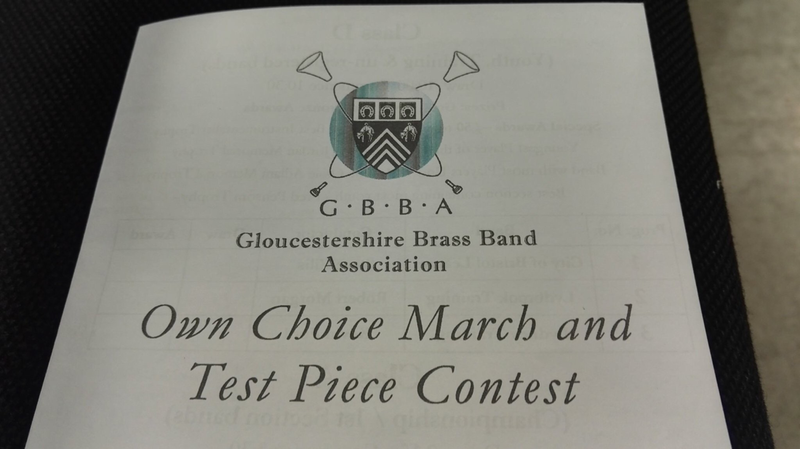 The band gave a very strong performance of Philip Sparke's Land of the Long White Cloud, but were placed 7th from a number two draw in the field of 10 First Section bands. 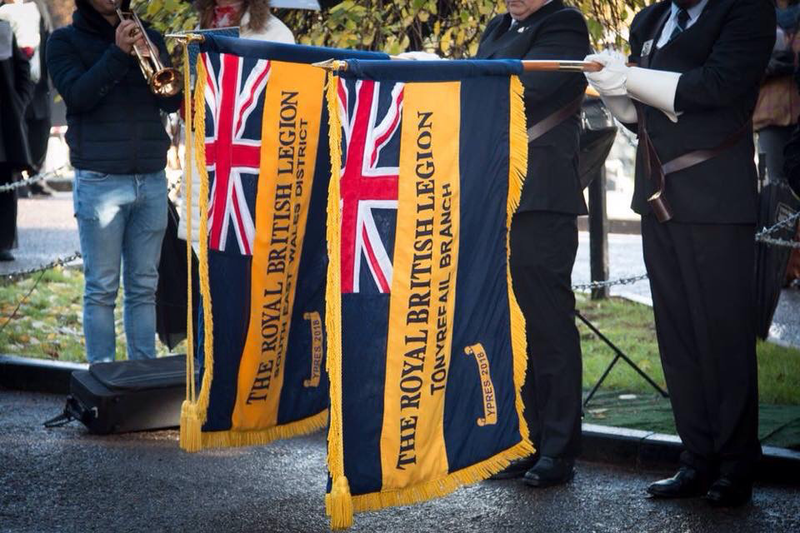 The band are delighted to retain our First Section status for 2018 however and look forward to a better result - and better draw - at the SEWBBA Championships in May. 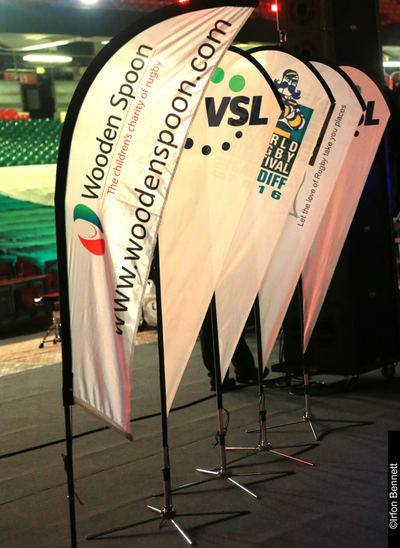 Huge thanks go out to all our members for all their hard work and commitment in preparation for the Welsh Regional and Welsh Open Championships over the past months. The band were delighted to recently participate in the 2017 Welsh Regional Championships at the Grand Pavilion, Porthcawl, and reunite with two good friends of the band, former longstanding Musical Director Mr Nigel Seaman and trombone soloist Tom Scaife. 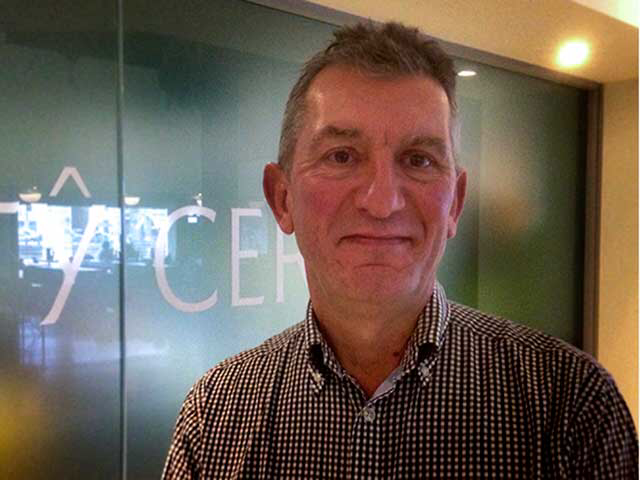 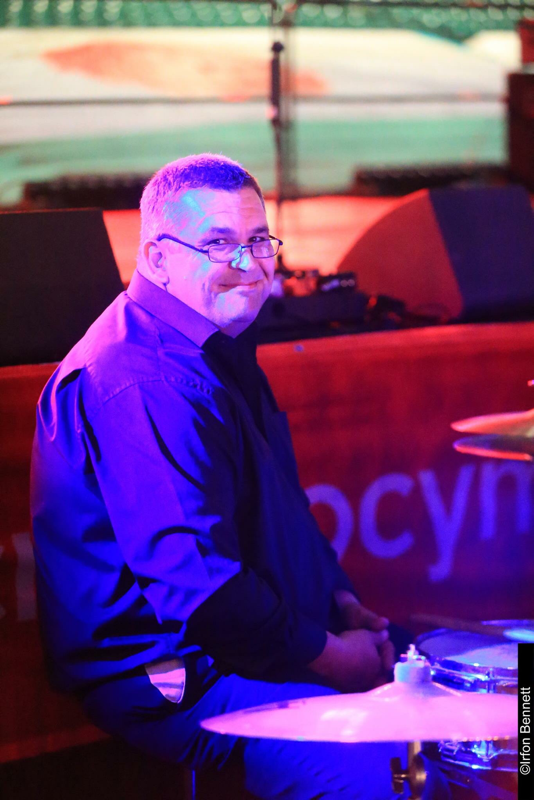 Nigel was MD for the band during one of the most successful periods in its history, leading LMB to the Welsh Championship and many more contest, concert and broadcast successes during the mid 1980's. 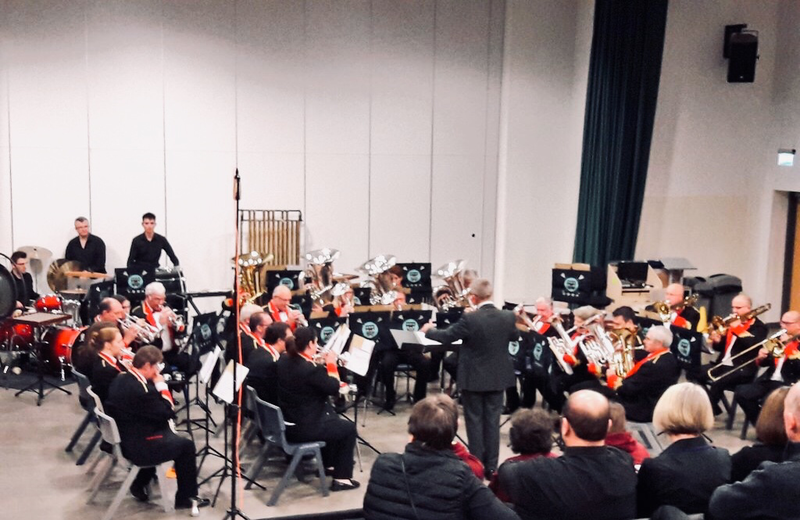 It was a pleasure for the band to welcome Nigel back to the bandroom for the first time in 19 years, to conduct the band in the absence of regular MD Craig Roberts, who was overseas, adjudicating at the Mid-Atlantic Brass Band Festival in the USA. The band's programme featured works by Paul Lovatt-Cooper, Ben Hollings, Darroll Barry and Alexander Borodin, plus the classic trombone showstopper, Arthur Pryor's "The Bluebells of Scotland" which was performed with alacrity by Royal Academy of Music graduate Tom Scaife, who is now studying in Bern, Switzerland with former Vienna Philharmonic Principal Ian Bousfield. 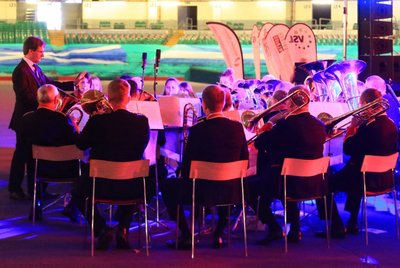 The band thoroughly enjoyed the performance, despite receiving the dreaded Number One draw and was placed 5th within the First Section bands competing, and received 10th position overall. 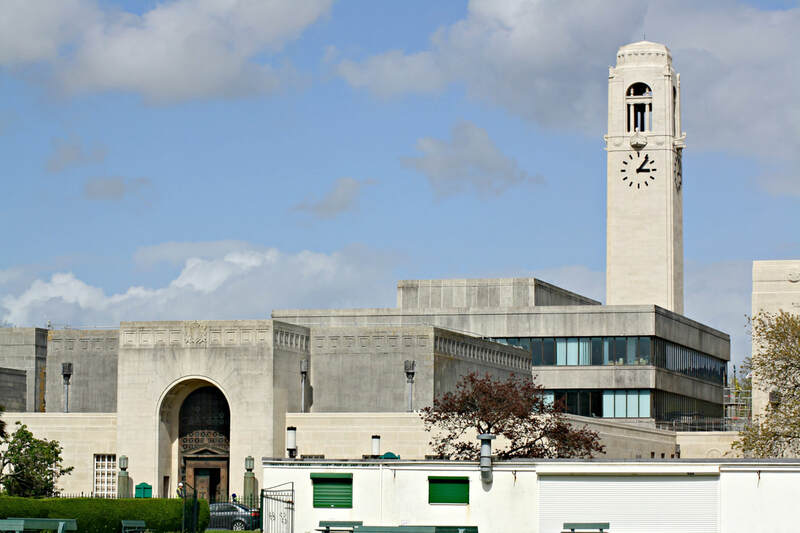 The band's next performance will be at the Welsh Regional Championships at the Brangwyn Hall, Swansea on Saturday March 18th performing Philip Sparke's "Aotearoa - The Land of the Long White Cloud". 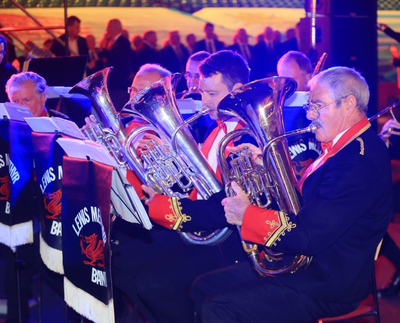 At the recent 2017 Band Dinner, the prestigious Life Membership of Lewis-Merthyr Band was awarded to longstanding member and Bandmaster Frederick Nicholas. 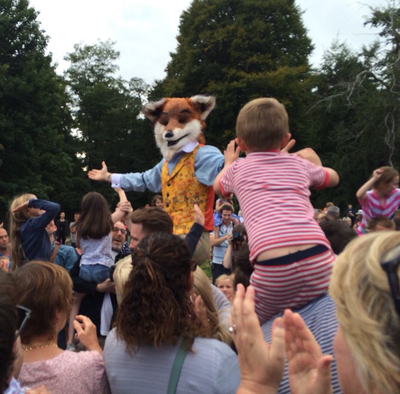 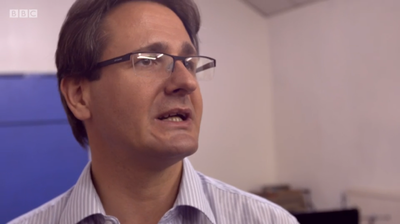 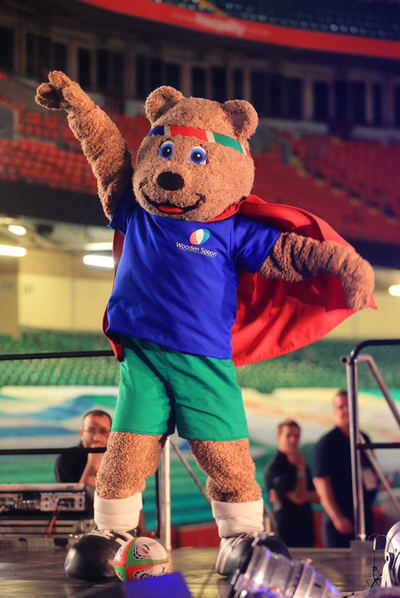 Educated at Tonypandy Grammar School, Fred is a graduate of the University of Wales. 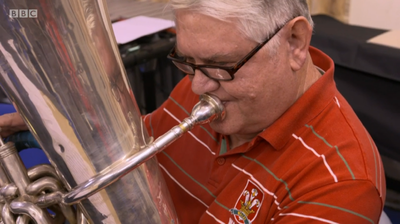 Until his retirement in 2012, Fred was Head of Music at Bryn Celynnog Comprehensive School in Beddau, Pontypridd. 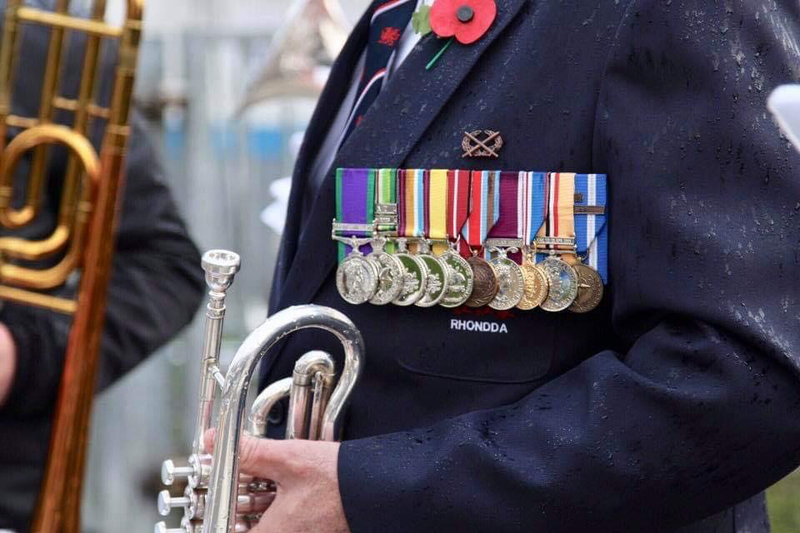 A longstanding member and Bandmaster at Lewis-Merthyr, Fred has also conducted numerous other bands including Rogerstone and Ynyshir. 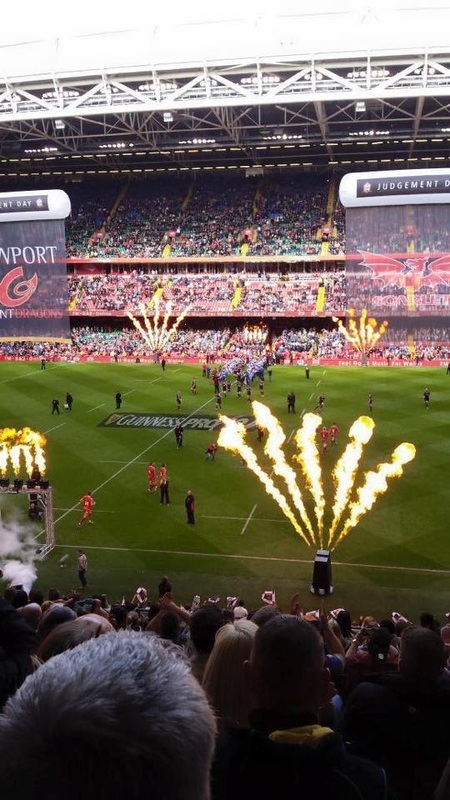 Following on from a busy and successful year in 2016, Lewis-Merthyr now look forward to another exciting year ahead in 2017. 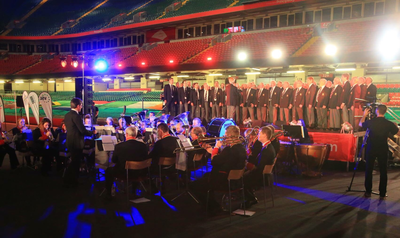 The band begin the year with our annual dinner on Saturday February 4th, following which the female members of the band will then be appearing with an all-female band & choir at Cardiff Arms Park on Saturday February 11th, performing for the Wales v England Womens Rugby International at Cardiff Arms Park. The full band will then appear in competition for the first time in 2017 at the Welsh Open Entertainments Championships at the Grand Pavilion, Porthcawl on Saturday February 18th. 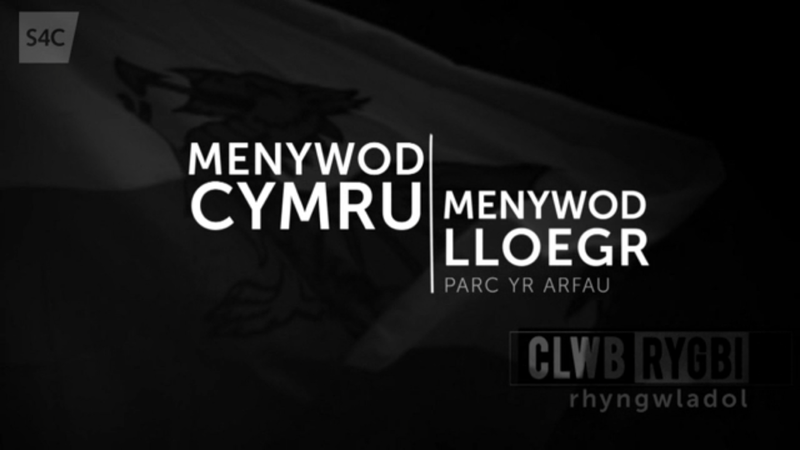 In March, Lewis-Merthyr will then perform for the Wales v Ireland Womens Rugby International at Cardiff Arms Park on Saturday March 11th, before competing at the Welsh Regional Championships in the Brangwyn Hall, Swansea on Saturday March 18th, performing Philip Sparke's Aotearoa - The Land of the Long White Cloud. In 2016, Lewis-Merthyr Band undertook over 35 public performances throughout the course of the calendar year. 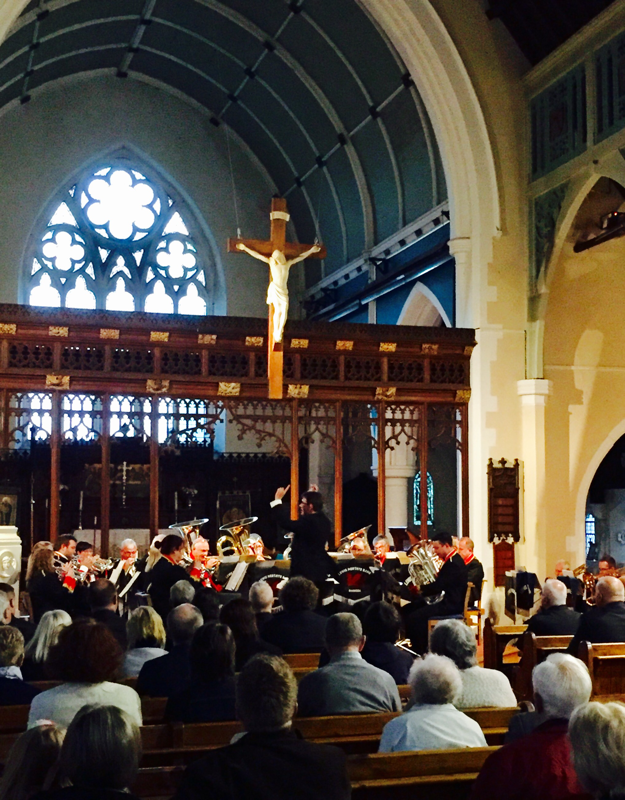 Our final formal concert of the 2016 season was held in Coychurch, Bridgend, where the band featured in the popular annual Carol Service at Coychurch Crematorium, delighting the large congregation present. ​Previous guest artists for the event have included Welsh Proms featured soprano Angharad Morgan and the 100 strong Bridgend Male Choir. This year the band were delighted to be featured, performing together with resident organist - and former Lewis-Merthyr member - Rhiannon Williams-Hale. Works featured during the evening included a magnificent combined rendition of Sir Arthur Sullivan's "The Lost Chord", Zacar's "When A Child Is Born" plus Leroy Anderson's ever popular "Christmas Fantasy" to close. Lewis-Merthyr were delighted to support the event, which proved an inspiring close to an excellent year for the band. 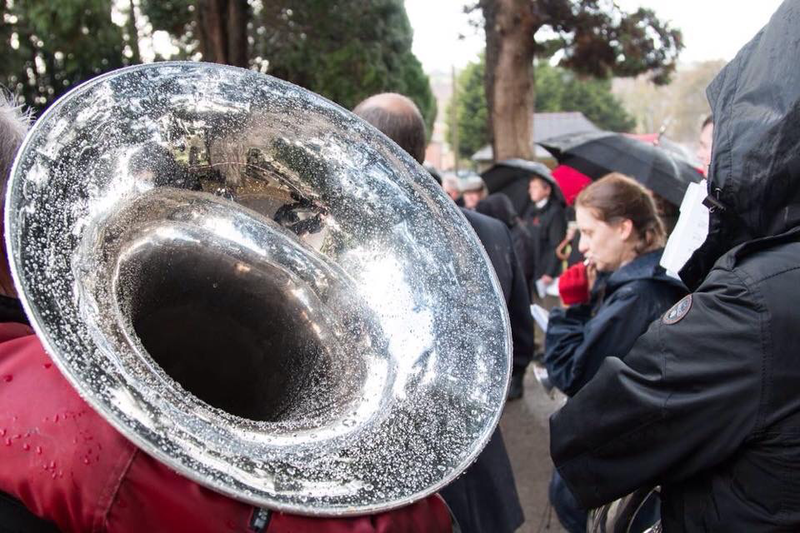 LMB will now close the festive season with a final series of Christmas carolling engagements at Culverhouse Cross, Llantwit Fardre & Talbot Green. 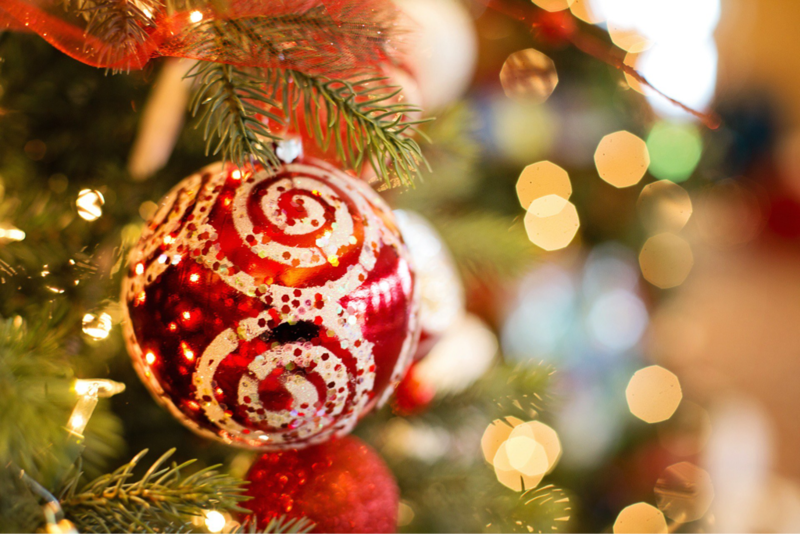 ​We wish all our friends & followers a very Merry Christmas & Happy New Year ahead - Nadolig Llawen a Blwyddyn Newydd Dda i chi gyd. 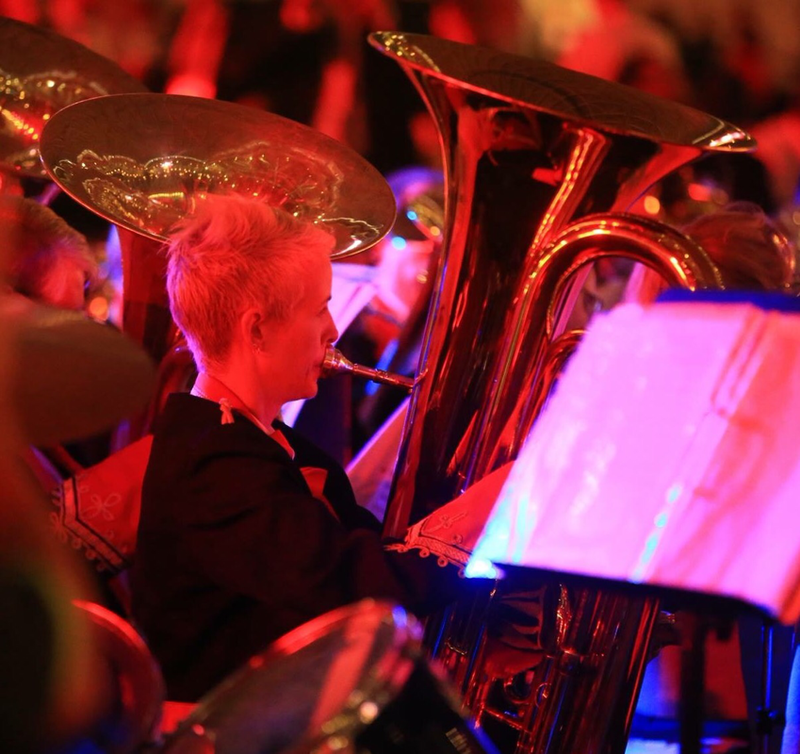 The band recently undertook two excellent festive concerts at our local Parish Church, St John's, Cymmer together with Porth County Community School and Cambrian Male Choir, and also the Christmas Lights ceremony at Porth Town Square. 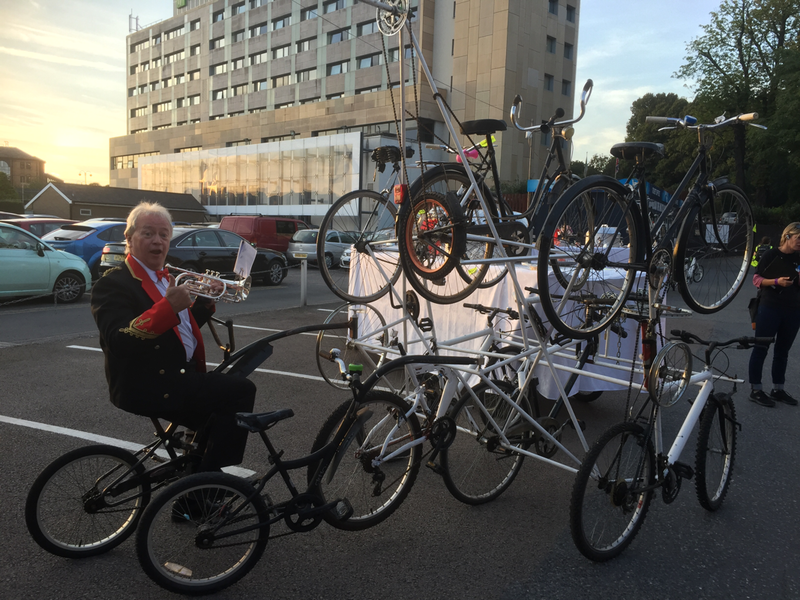 All events were incredibly well supported and it has been a delight for the band to be able to engage with and entertain so many members of our local community. The undoubted stars of all these performances however were definitely the next generation of Lewis-Merthyr talent, the members of our new Youth Band programme, currently being operated in partnership with Porth County, Tonyrefail & Cymmer Junior Schools. 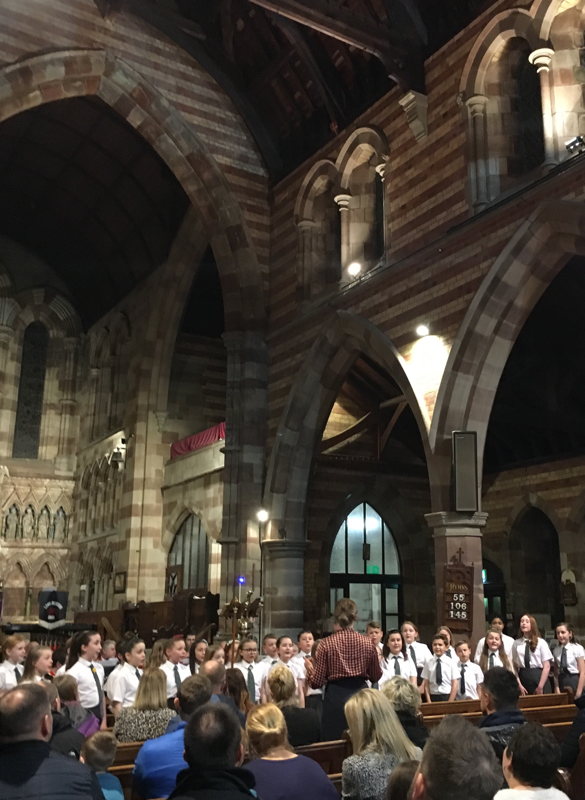 Young musicians from each of these schools, came together to perform in concert for the very first time, rightly stealing the show and receiving deserved rapturous applause from the capacity audience at St John's. 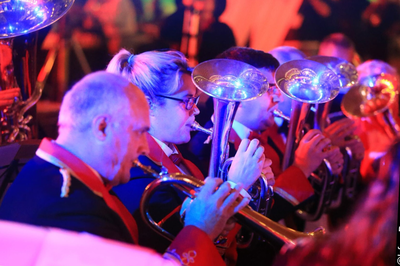 As every year, the band is undertaking a large number of festive engagements across Rhondda Cynon Taf and wider this Christmas. 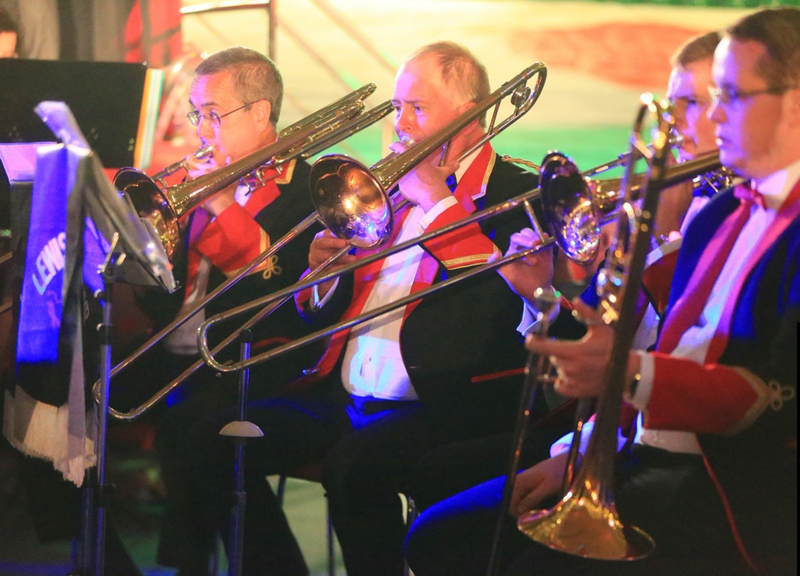 On December 7th & 8th the band will feature in two concerts at St John's Church, Cymmer - the Porth County Community Carol Service, plus our own Christmas Concert with Cambrian Male Choir. 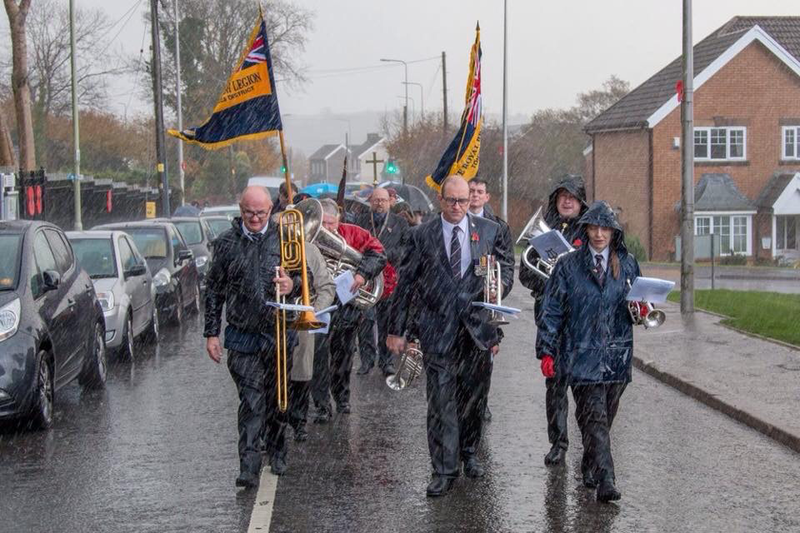 Following these, the band will then also feature in a special Brass & Organ Carol Service at Coychurch on Thursday December 15th. In addition to these concert performances, Lewis-Merthyr will also be undertaking a wealth of Christmas Carol performances at Porth, Coryton, Culverhouse Cross, Llantwit Fardre & Tonyrefail. 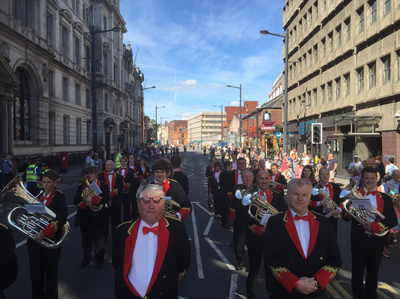 ​Lewis-Merthyr ended the 2016 contesting season with success, again being named Runner Up Welsh League First Section Champions following a strong 4th placing from a number one draw at the recent South East Wales Brass Band Association Championships in Merthyr Tydfil. The band were highly praised for their rendition of Sir Malcolm Arnold's "Fantasy for Band" by adjudicator Derek Broadbent. 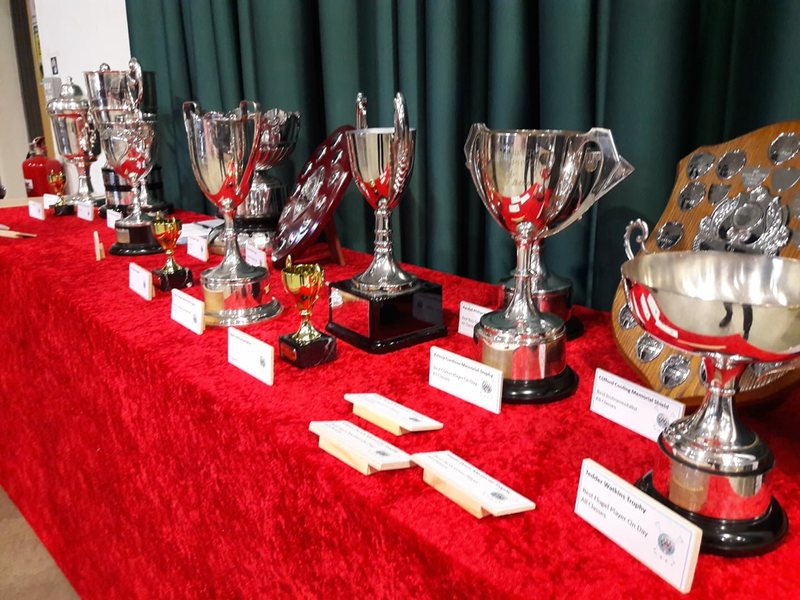 The full adjudication will soon be made available in the Contest Adjudications section of the website here Our thanks go to all members for their sterling commitment and high level of performance throughout the 2016 season. 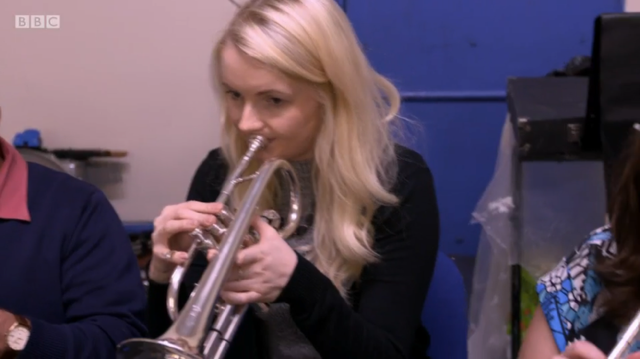 Everyone at Lewis-Merthyr Band offer all our best wishes to Principal Cornet Louise Russell on the imminent birth of her third child and forthcoming maternity leave for the festive season. 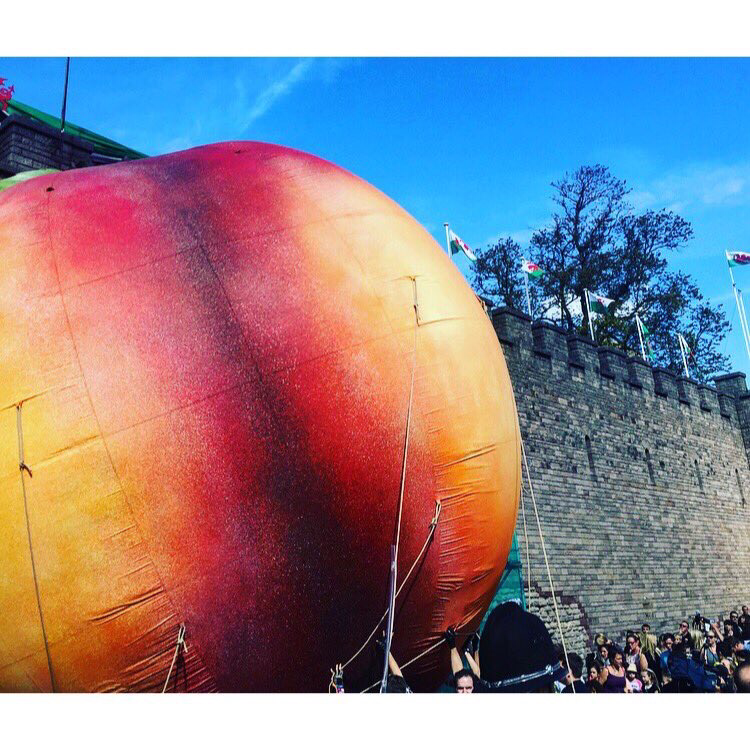 All members send our very warmest wishes to Louise, Jeremy and family and look forward to baby Rugman-Russell joining the extended Lewis-Merthyr family very soon! The recent Brass & Voices concert, in aid of the Rhondda Tunnel Society, was an incredible success. 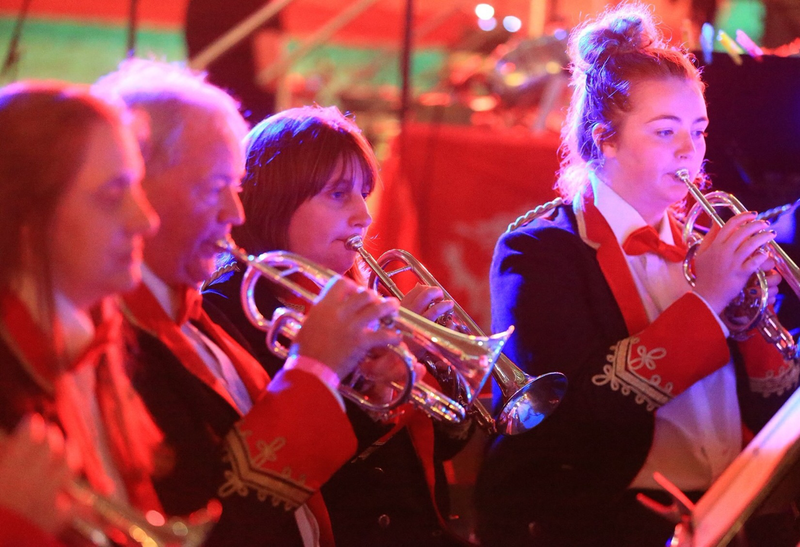 A large and tremendously appreciative audience, which included Plaid Cymru Leader Leanne Wood AM and Rhondda MP Chris Bryant, were delighted with the performances of the band, choirs and soloists alike. 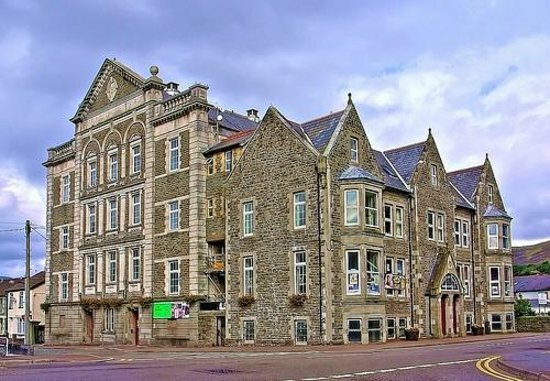 Lewis-Merthyr and Musical Director Craig Roberts were delighted to return to the iconic Park & Dare Theatre to perform after gaps of over thirty years(!) 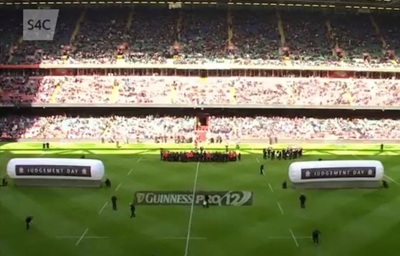 and eight years respectively. 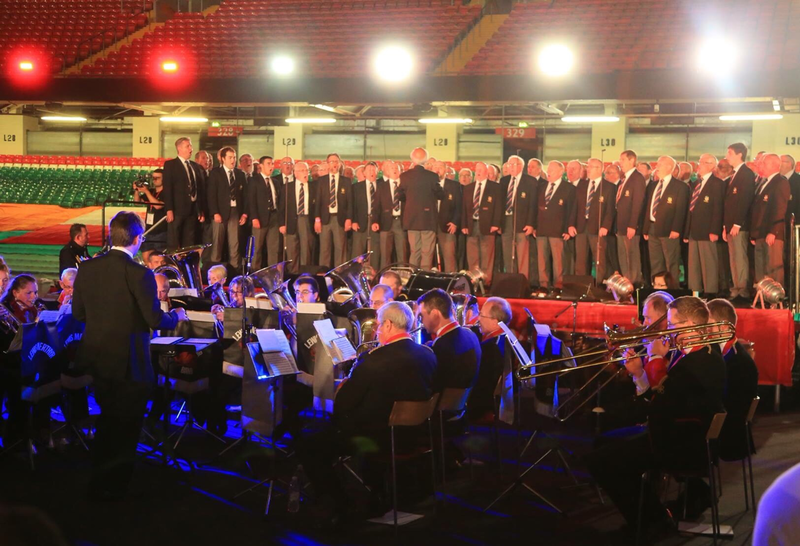 The Rhondda Tunnel Society were delighted with the response to the concert, which should raise c.£6000 for the Tunnel Project Fund, thanks to the audience support and sponsorship of Rhondda Cynon Taf County Borough Council, Santander, Ricoh Print and additional local businesses. 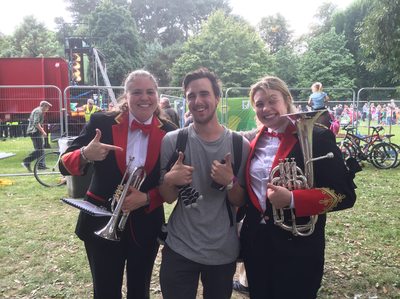 Lewis-Merthyr Band look forward to undertaking additional projects with Pendyrus and the Tunnel Society in the near future, and to returning to the Park & Dare Theatre again soon. Our thanks to all our friends and followers for your support. 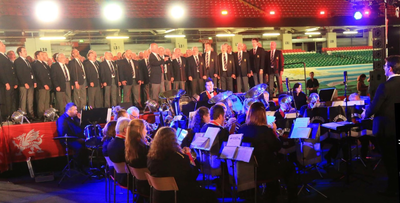 On Thursday October 13th, Lewis-Merthyr Band will join forces with the renowned Pendyrus Male Choir, Treorchy Comprehensive School Choir and Côr Ysgol Gynradd Gymraeg Ynyswen, for a grand scale Brass & Voices concert in aid of the Rhondda Tunnel Society. Compered by BBC Wales' Beverley Humphreys, the performance will feature a host of traditional favourites, movie soundtracks, songs from the shows and more. 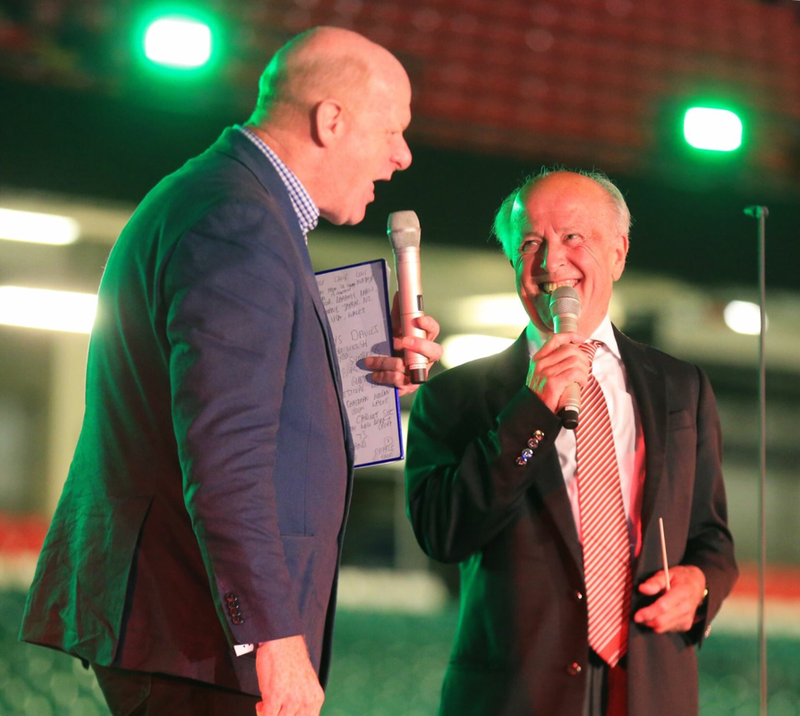 Truly an evening not to be missed! 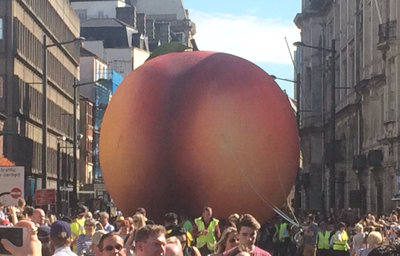 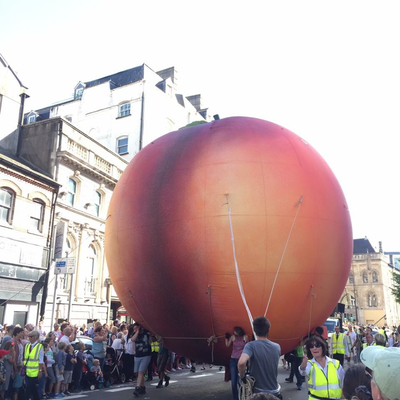 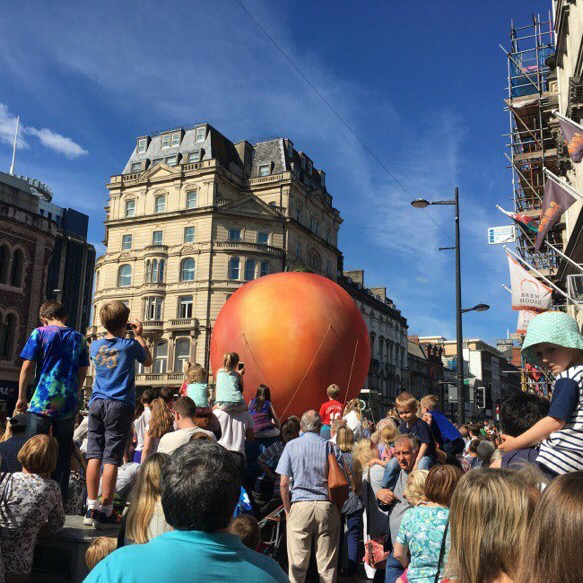 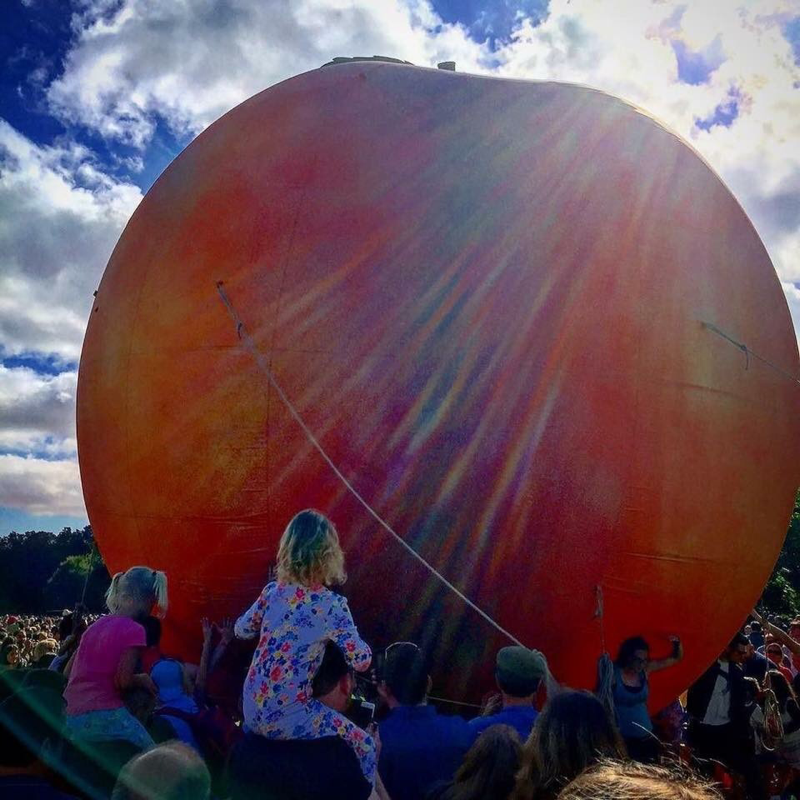 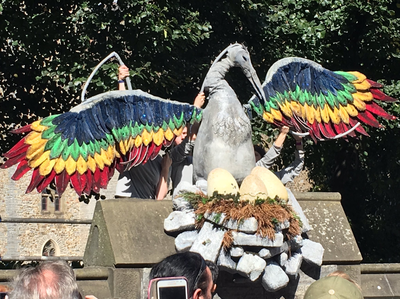 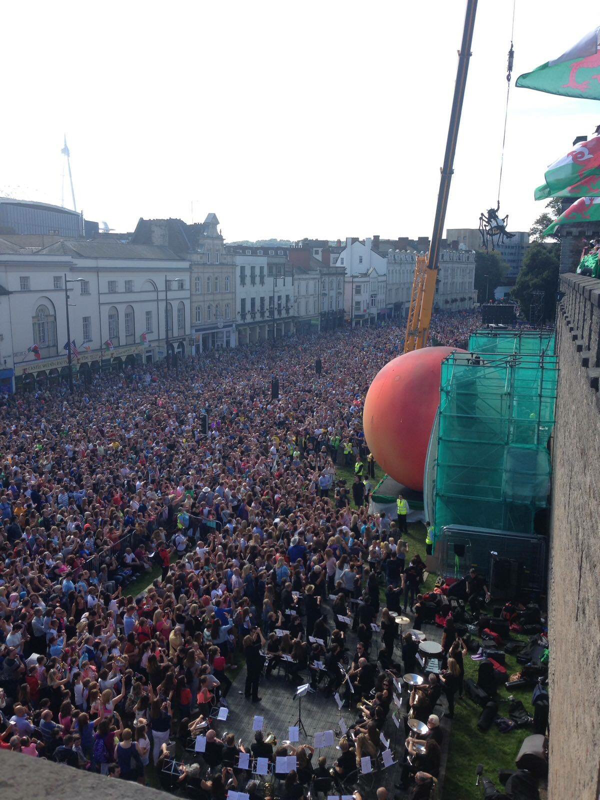 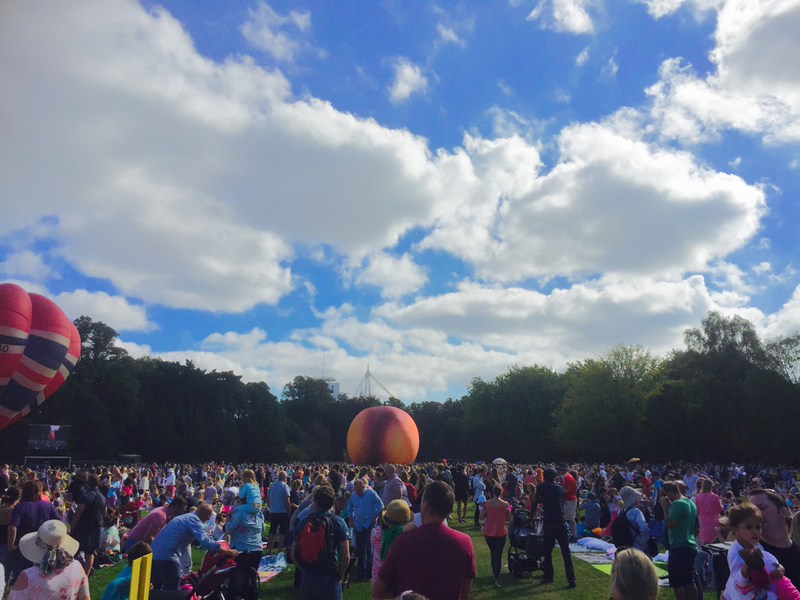 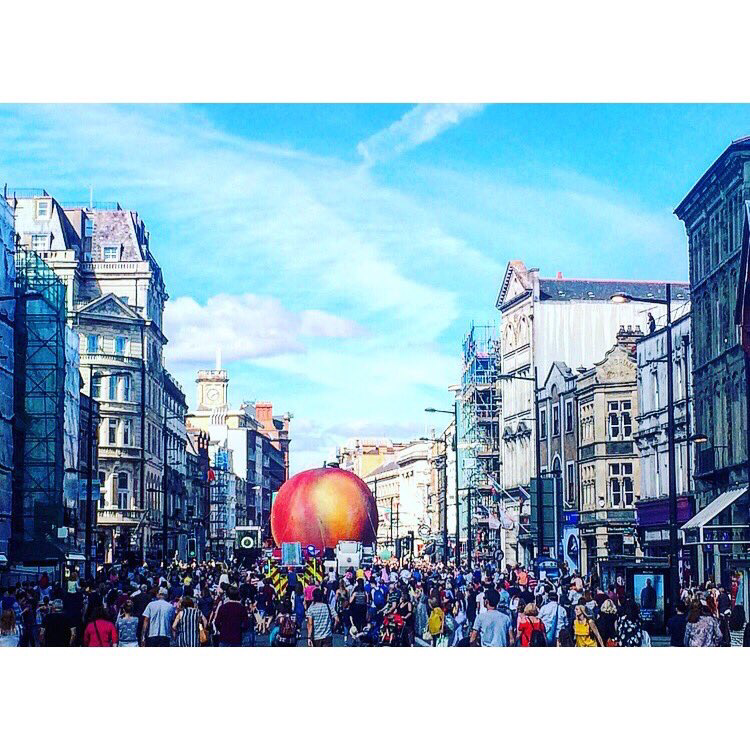 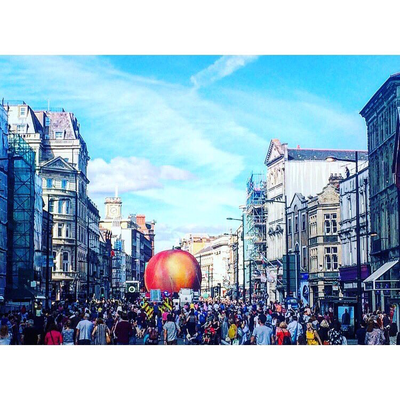 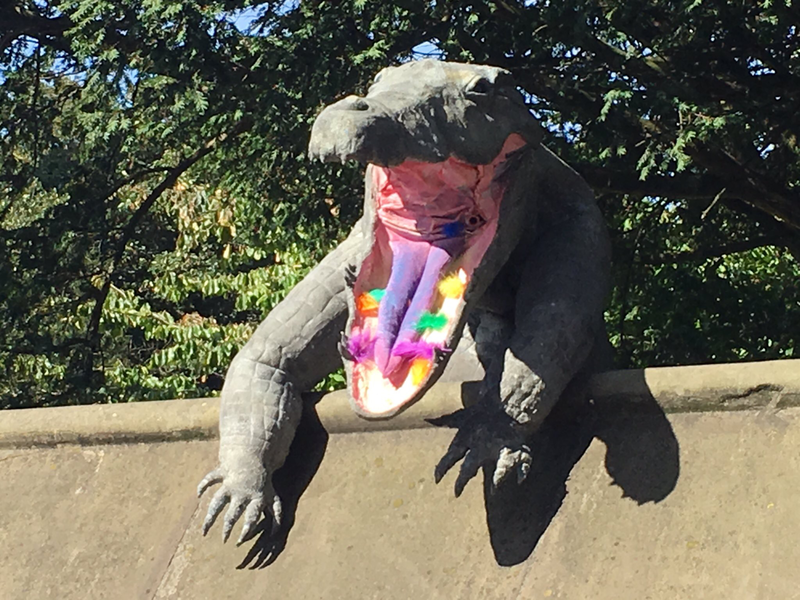 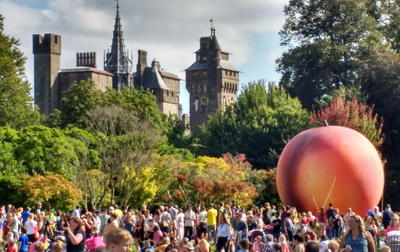 The Welsh capital will become a place where reality is turned on its head, and where the laws of physics, logic and the predictable will give way to magic, fun, invention and the surreal, as if Roald Dahl himself is at the helm. 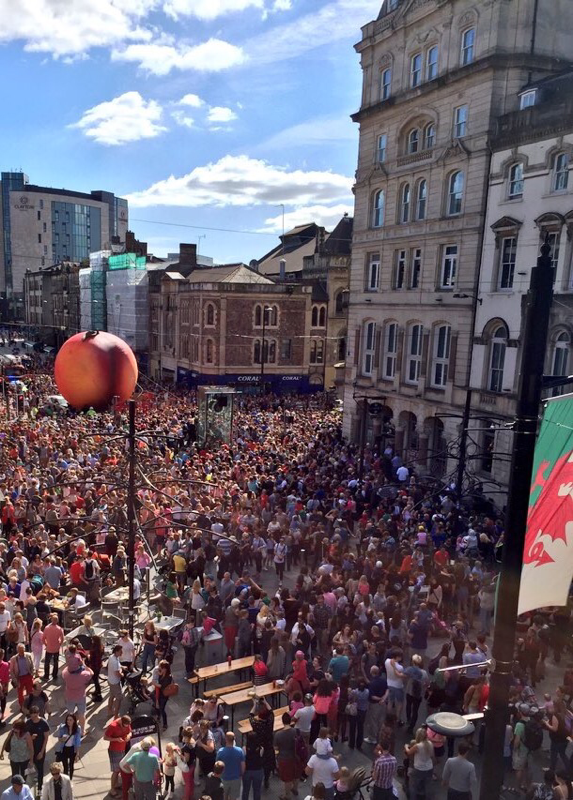 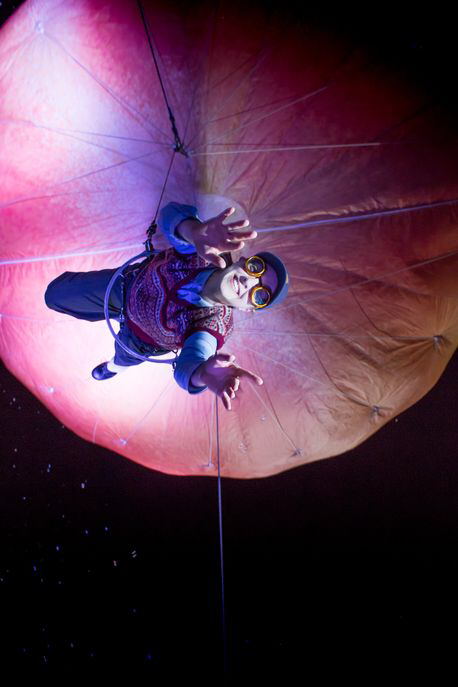 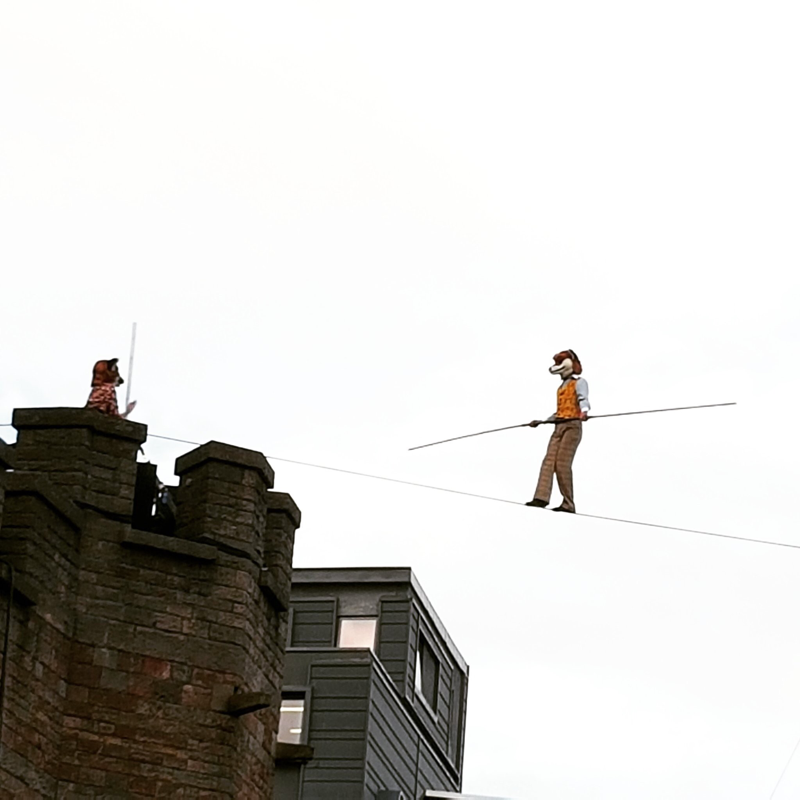 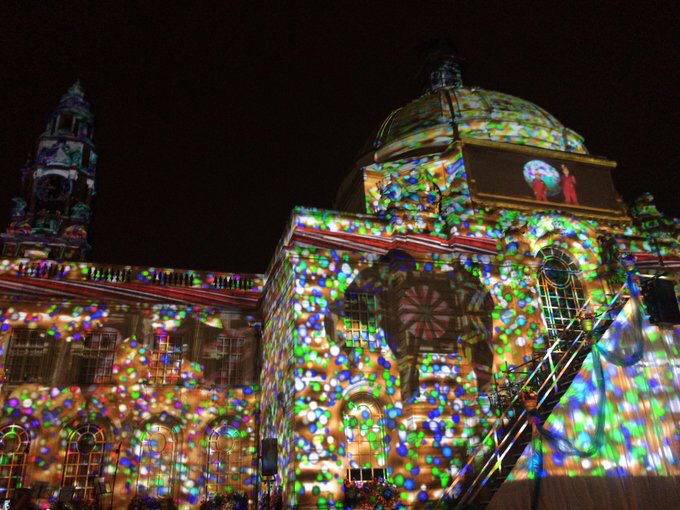 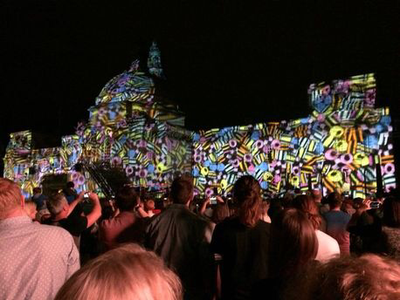 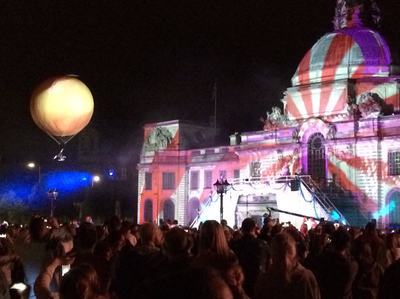 This epic weekend will involve a cast of thousands of performers from across the city and jaw-dropping spectacles. 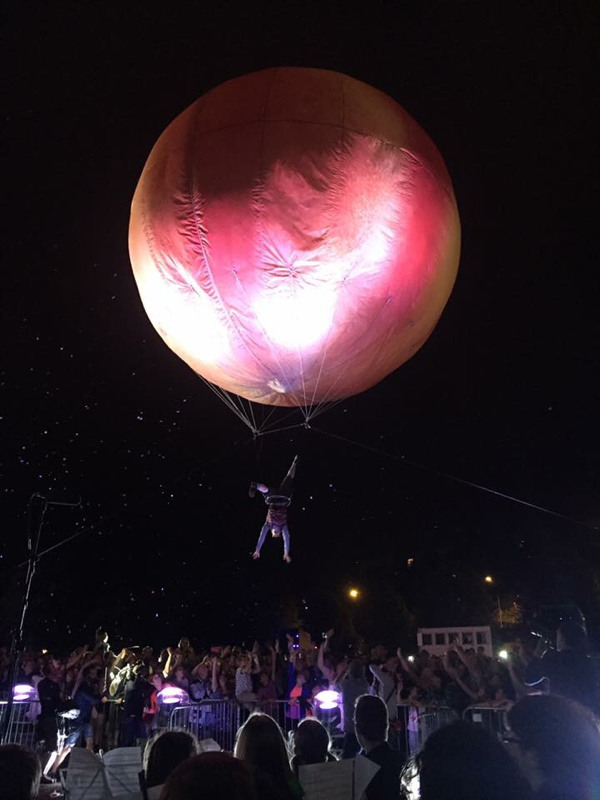 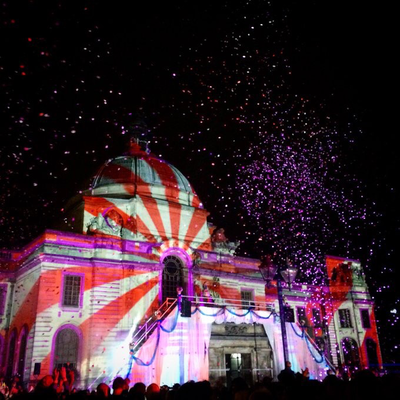 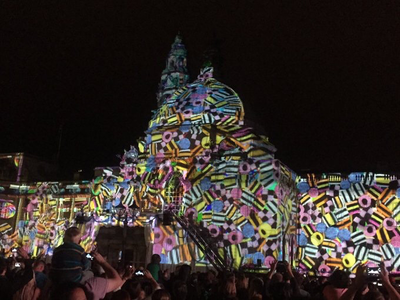 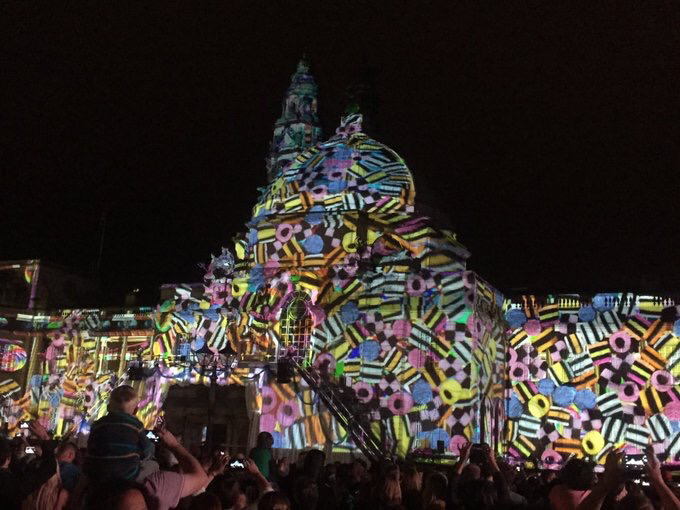 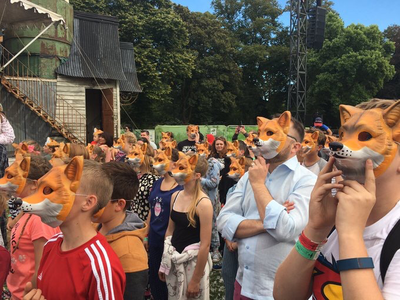 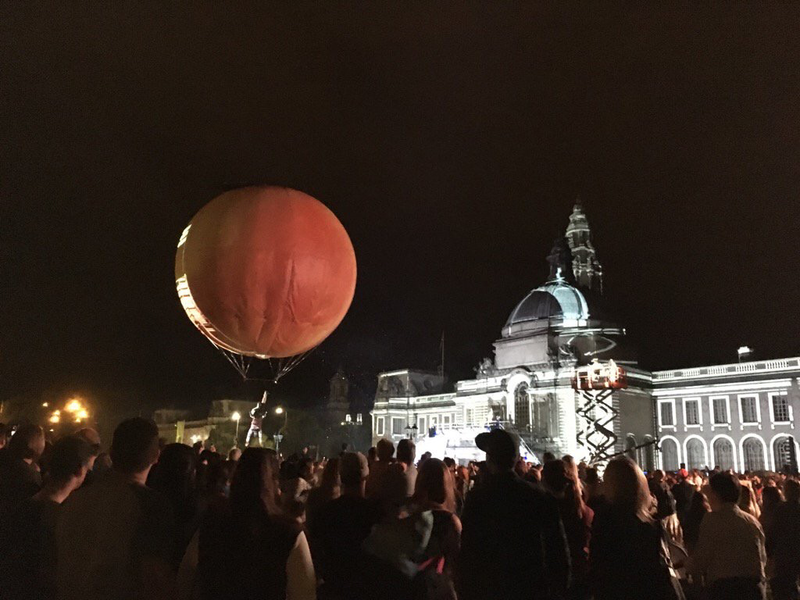 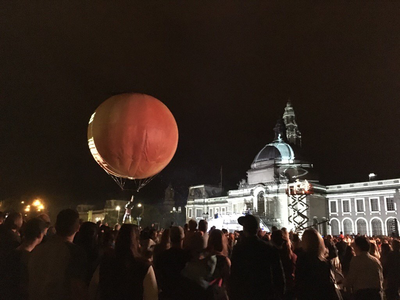 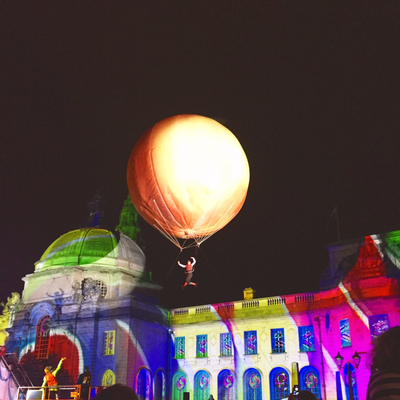 Immerse yourself in everything from large-scale events to intimate performances - all staged across Cardiff’s streets and public spaces, in shops and arcades, at iconic buildings and parks. 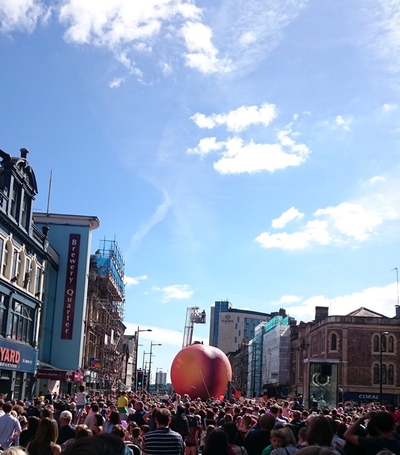 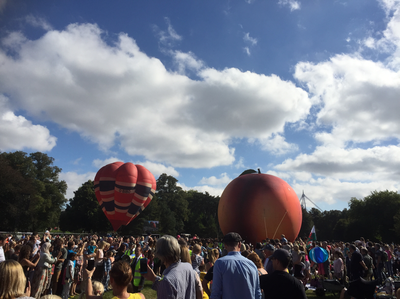 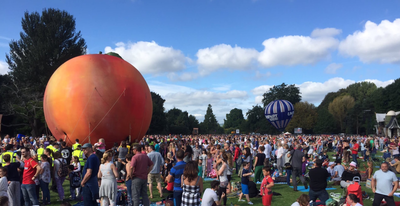 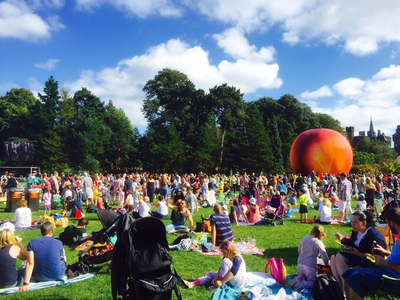 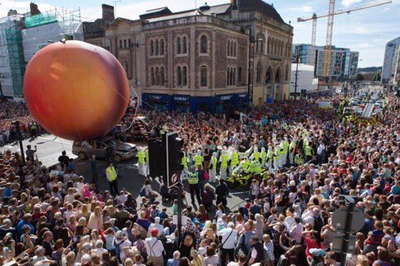 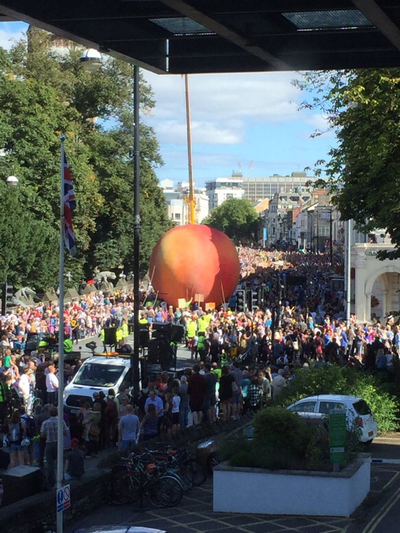 Born in Cardiff, one hundred years ago this September, Roald Dahl’s imagination has touched the most extraordinary number of people. 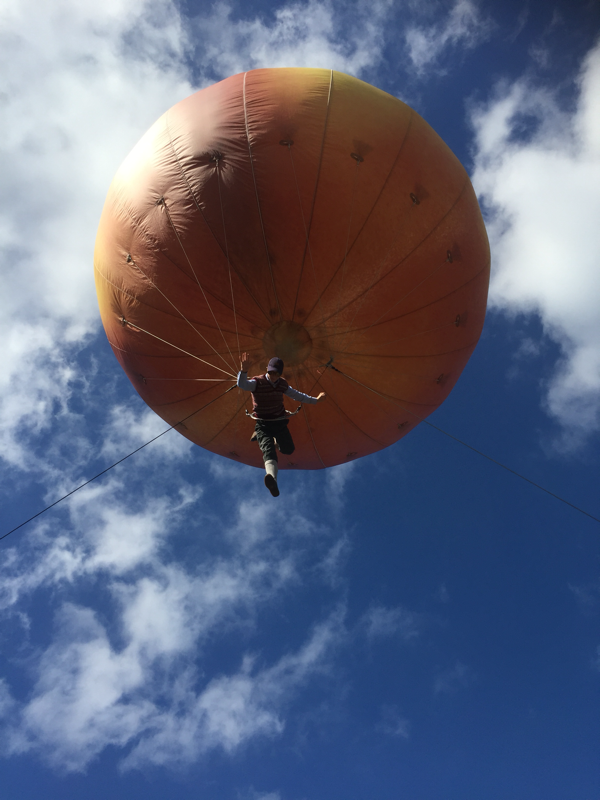 It has been part of our childhood and our children’s childhood. 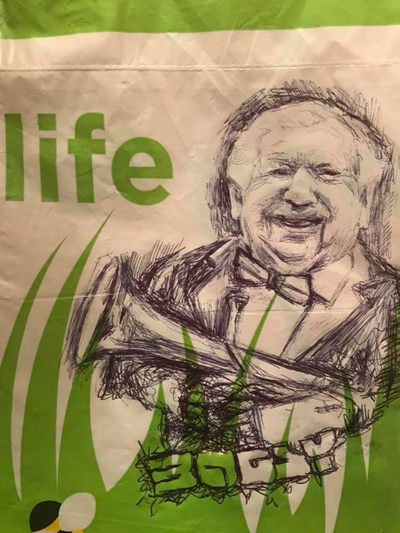 To mark his centenary and to give thanks for the legacy he created, this will be a totally surprising celebration of the man, his characters and his stories. 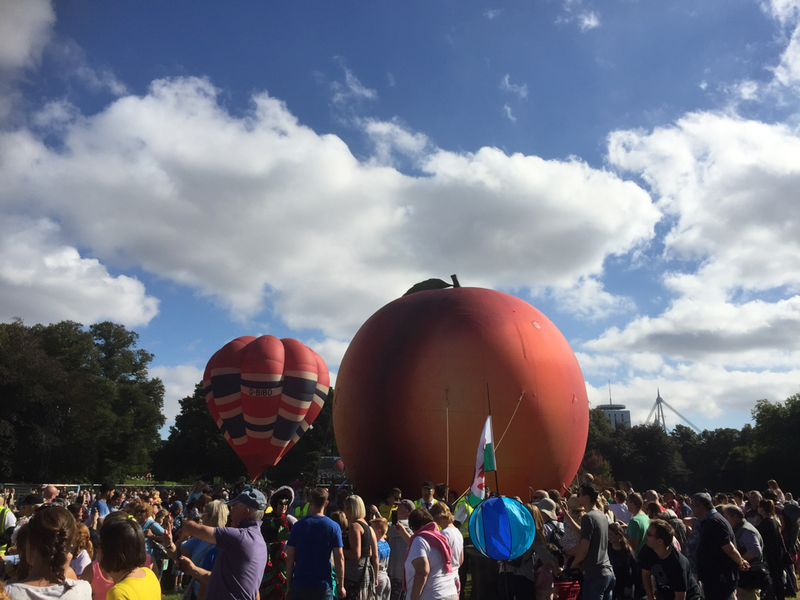 Produced by Wales Millennium Centre and National Theatre Wales, in association with The Roald Dahl Literary Estate, and led by a creative team from Wales and across the globe, Roald Dahl’s City of the Unexpected will be a world-class event worthy of a world-class writer." 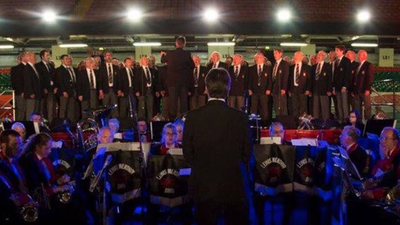 Lewis-Merthyr has enjoyed a successful start to the summer with engagements at Rhondda Heritage Park, performing for the installation of a plaque in memory of Trade Unionist A. J. Cook; a private function at Abergavenny, under guest conductor Denis Mahoney; and a performance at Penarth, under guest conductor Major Denis Burton. 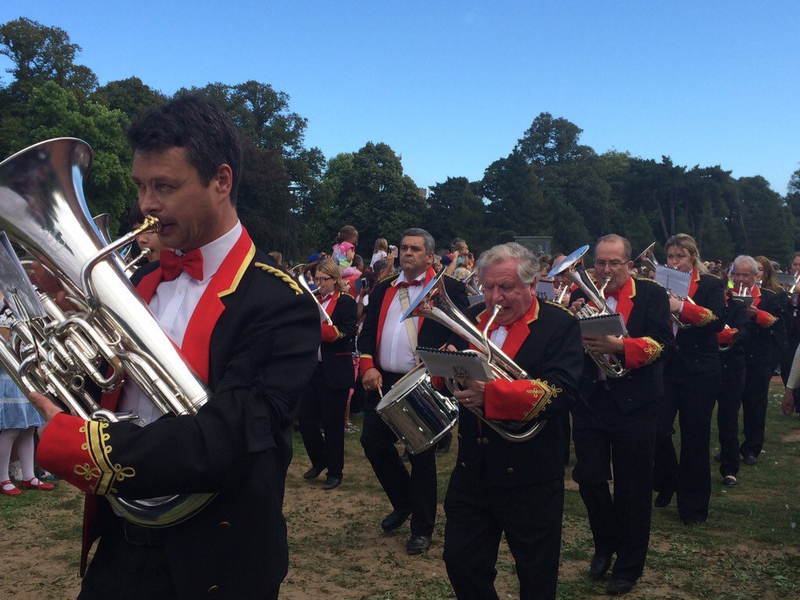 The band also recently performed in concert at Bedwellty House & Gardens under regular Musical Director Craig Roberts. 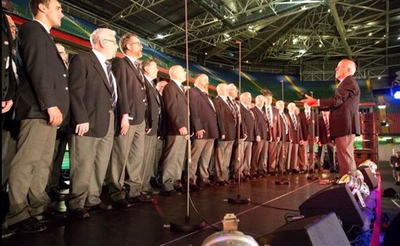 Lewis-Merthyr will round off a busy summer with a second engagement at Penarth on August 20th, plus an appearance at the Principality Stadium, Cardiff on August 21st, featuring in the Opening Ceremony of the World Golden Oldies International Rugby Festival with Pendyrus Male Choir, under the baton of WRU Director of Music Dr Haydn James and LMB MD Craig Roberts. 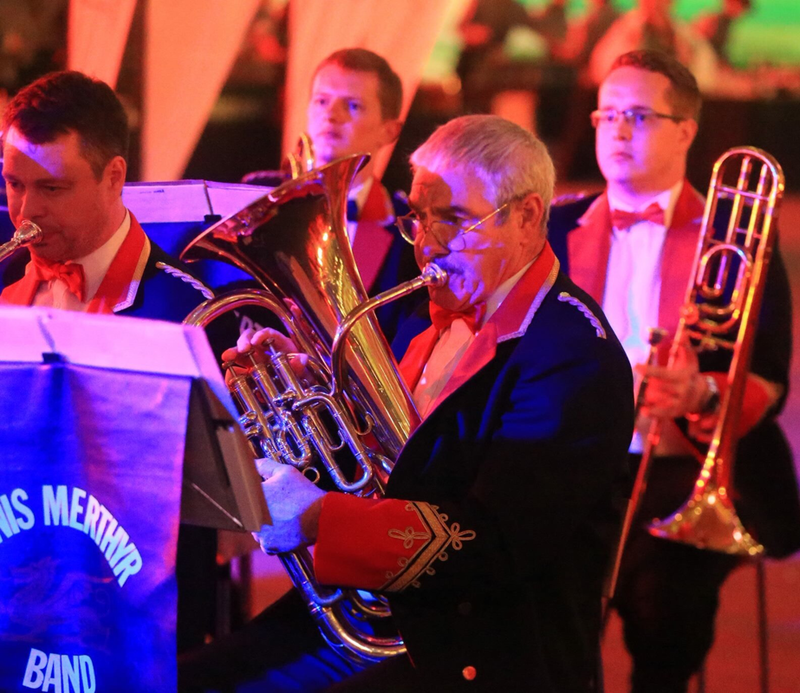 Beyond the summer, the band then look forward to the new contesting season in the autumn with the WWBBA Championships at Fishguard, West Wales and the Wychavon Festival of Brass in Evesham, Worcestershire. 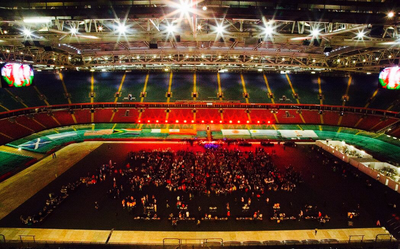 The band will also be involved in a major concert project in Cardiff in September. 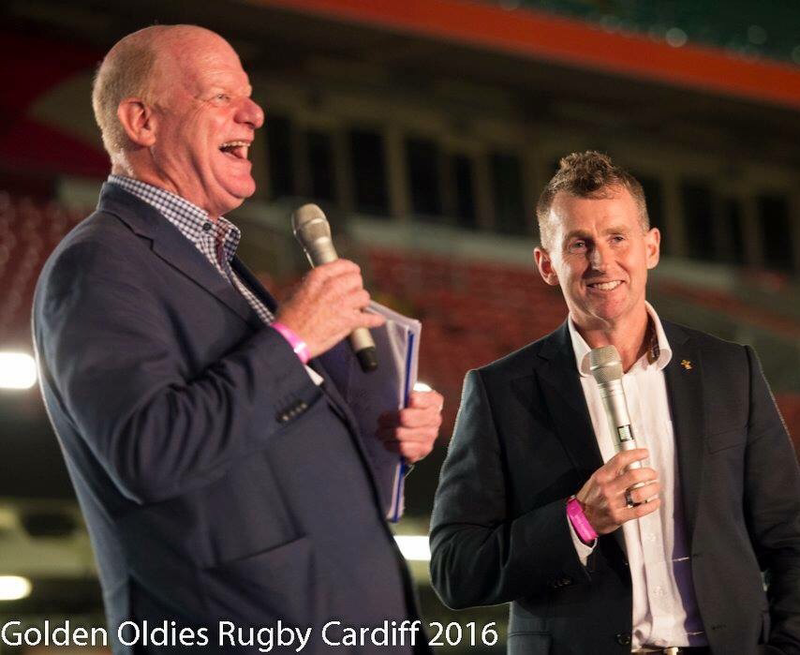 This August will see the 21st World Golden Oldies Rugby Festival head to the heart of rugby – Cardiff, Wales, a city steeped in rugby and rugby traditions, and the focal point for the highly respected Wales Rugby team. World Golden Oldies Rugby Festivals have previously been staged in England, Scotland, Ireland, France, South Africa, Canada, the USA, Australia, New Zealand, Japan and Argentina but, to date, never in Wales. 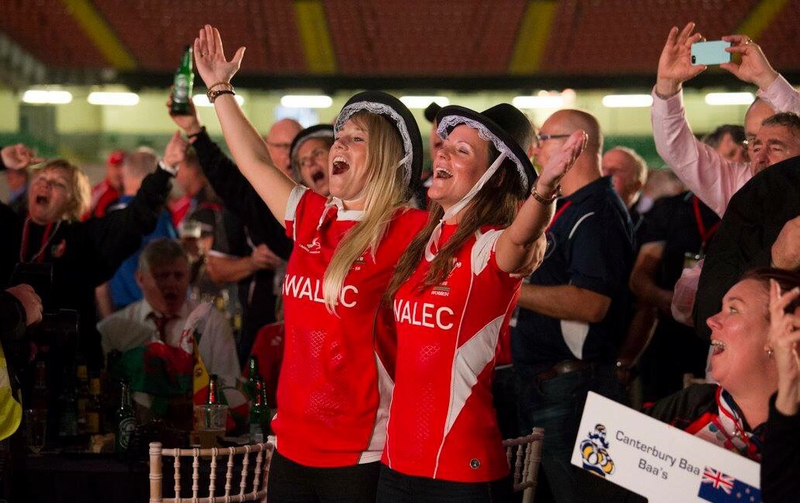 ​This summer however teams, players, wives, partners, supporters and officials will finally be able to enjoy the renowned Welsh hospitality, soak up the incredible rugby atmosphere, visit Wales' wonderful pubs and restaurants, and enjoy the many attractions the Welsh capital has to offer, and Lewis-Merthyr Band will play a major part in the festivities. 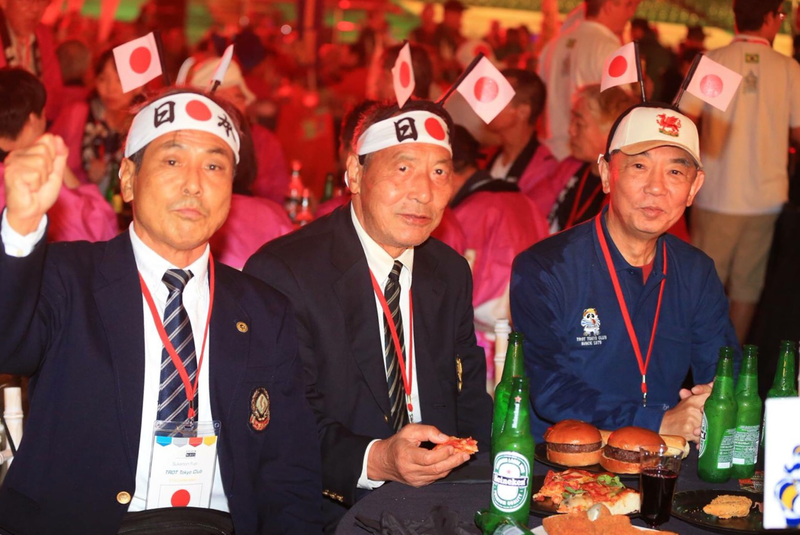 The first Golden Oldies World Rugby Festival was held in Auckland in 1979. 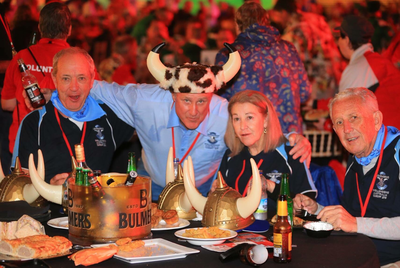 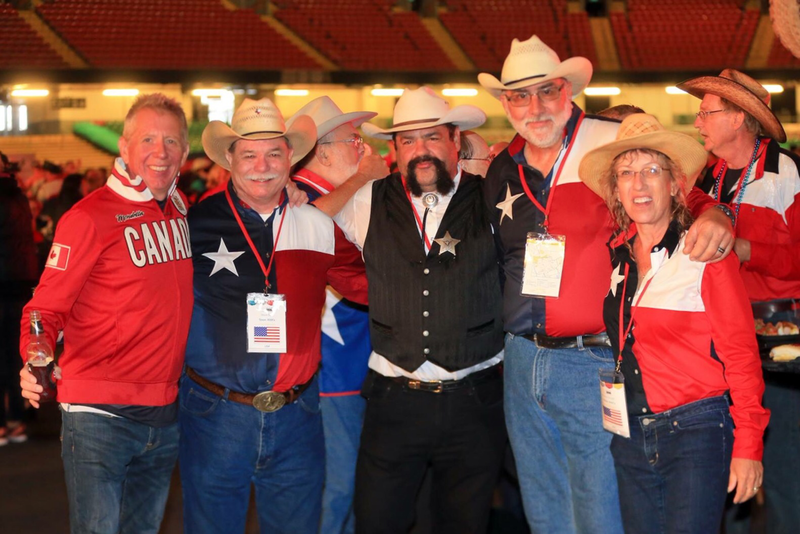 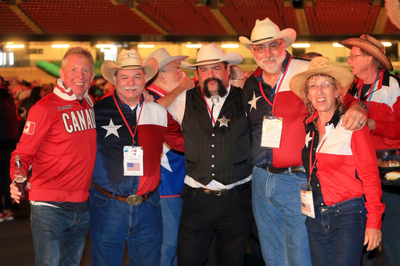 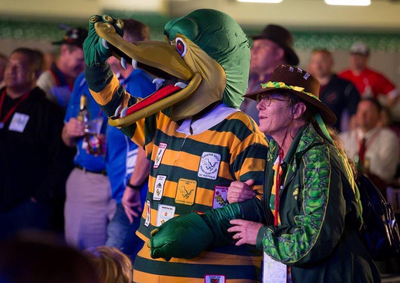 Held roughly every two years since, in Rugby destinations around the World, the Golden Oldies Rugby movement keeps growing based on the fundamental ethos of Fun, Friendship and Fraternity. 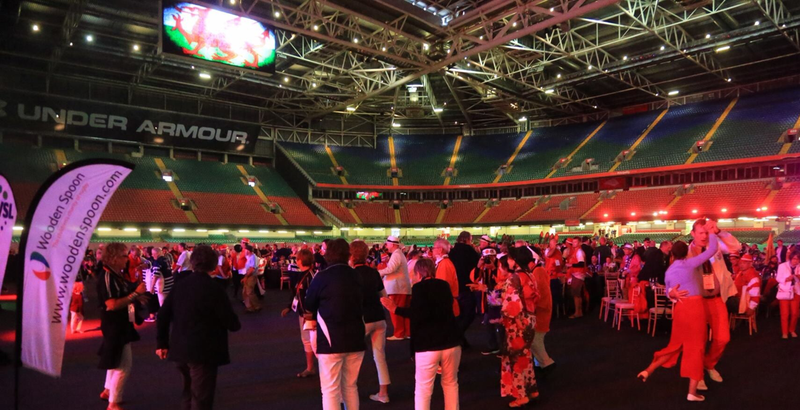 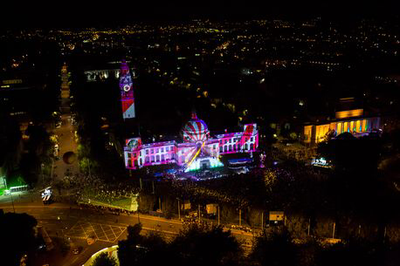 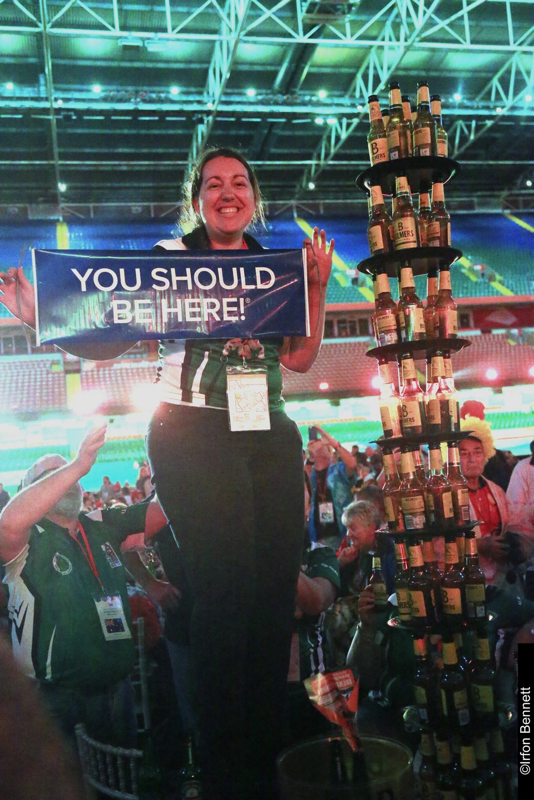 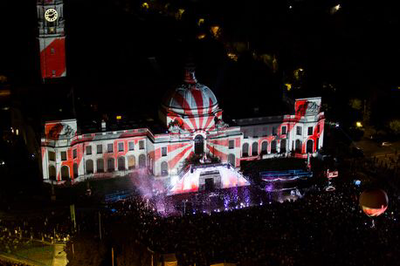 In 2016 the organisation are celebrating the 21st World Festival in style at the heart of world rugby, Cardiff – over 100 teams from 18 Countries have entered for the celebrations! 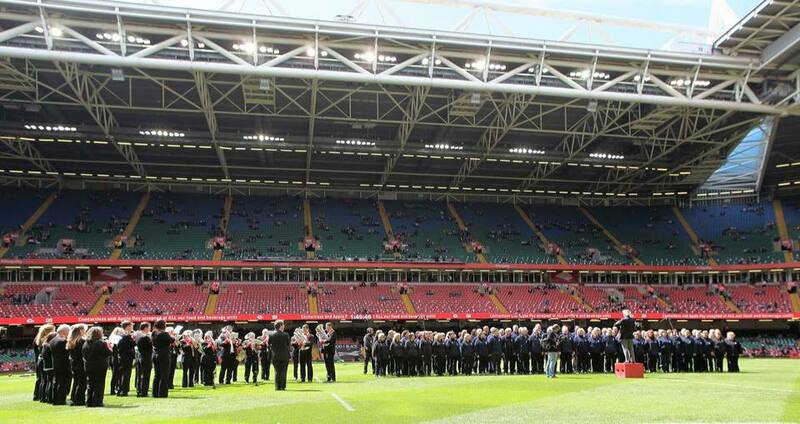 On Saturday August 20th, the festival Opening Ceremony will take place at the Prinicpality Stadium where the Lewis-Merthyr Band and Pendyrus Male Choir will perform under the batons of esteemed WRU Director of Music Dr. Haydn James and Lewis-Merthyr MD Craig Roberts. The band are thoroughly looking forward to once again appearing at the Stadium and working with Dr James again, and to welcoming the participants from across the globe to Cardiff and Wales this summer. 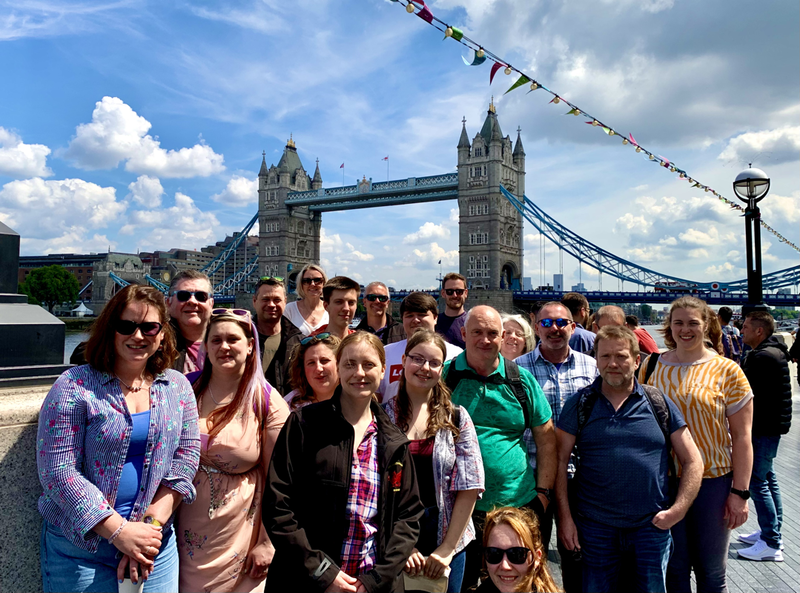 On Wednesday June 15th, Lewis-Merthyr featured in concert together with students of Tonyrefail School in "An Evening of Movies, Musicals & Pop!". 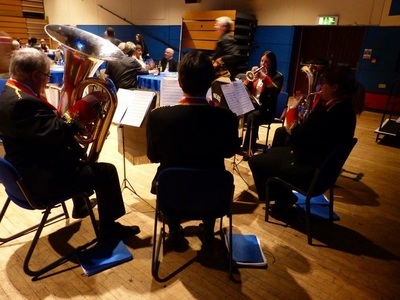 Organised by new Tonyrefail Head of Music, and LMB band member, Miss Joanne Huxton, the concert featured a selection of popular movie soundtracks, West End favourites and chart topping hits, and took place to a large and very appreciative crowd in the main hall of the Lower School in Tonyrefail. 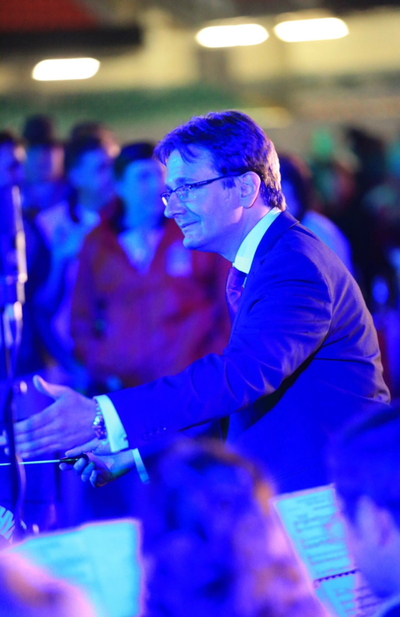 Speaking about the evening, LMB Chair Paul Williams stated "It was a fantastic evening and an excellent opportunity for the band to be able to perform together with the very talented students of the school to such an appreciative audience in our local community. We look forward to further collaborations with Tonyrefail and additional schools throughout the local area in the near future". 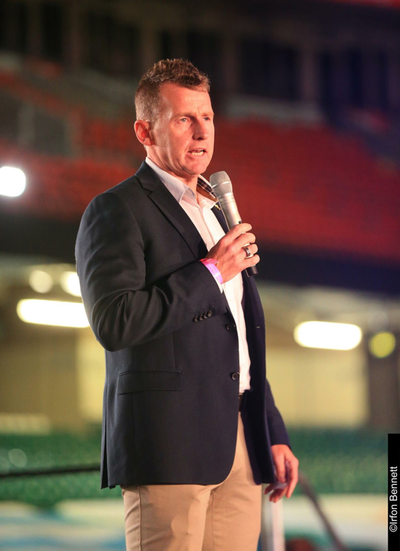 The band recently enjoyed another fantastic appearance at the national rugby stadium, Cardiff's Principality Stadium, performing for 68 262 people and nationwide television audience at Judgement Day IV. 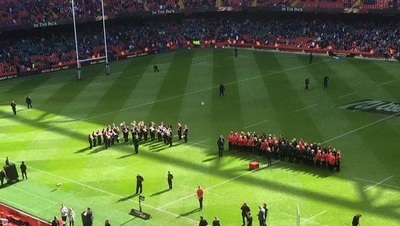 The band appeared together with the Blues, Dragons, Scarlets & Ospreys choirs, performing under the batons of LMB Musical Director Craig Roberts and WRU Director of Music Dr Haydn James. 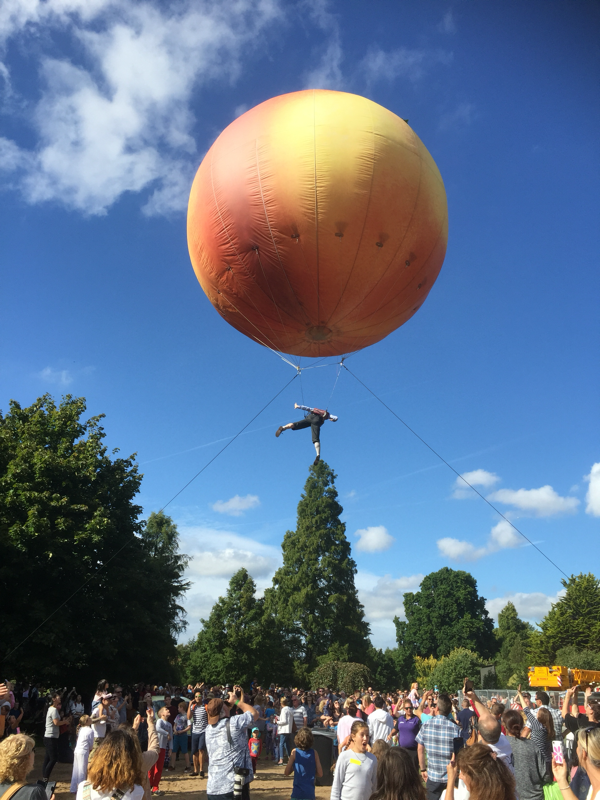 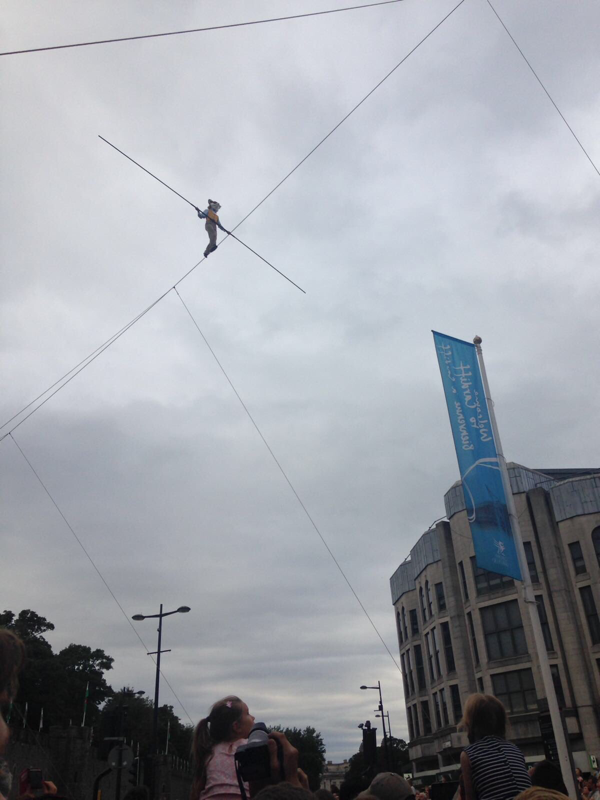 A selection of images from the performances and the day can be found below. 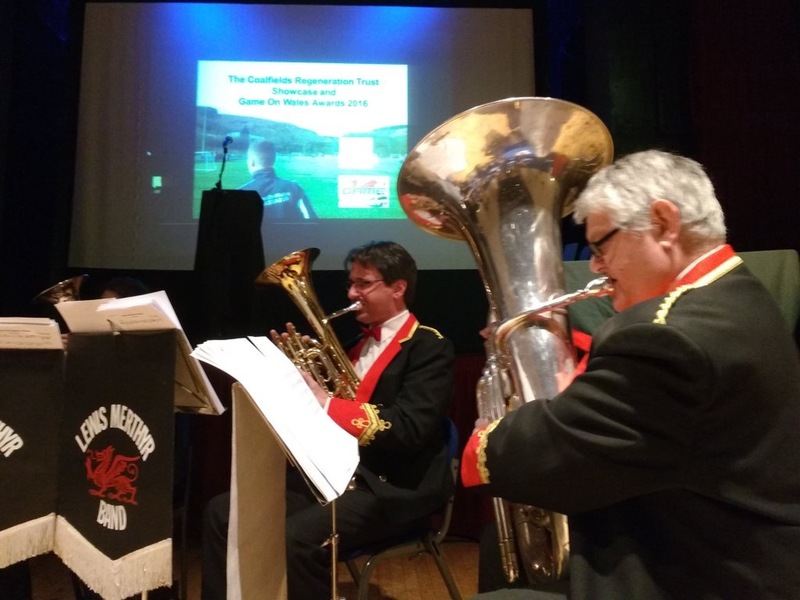 An ensemble from the band were delighted to support the Coalfields Regeneration Trust Game On Wales Awards hosted by Mick Antoniw AM at the Muni Arts Centre on Wednesday April 20th. 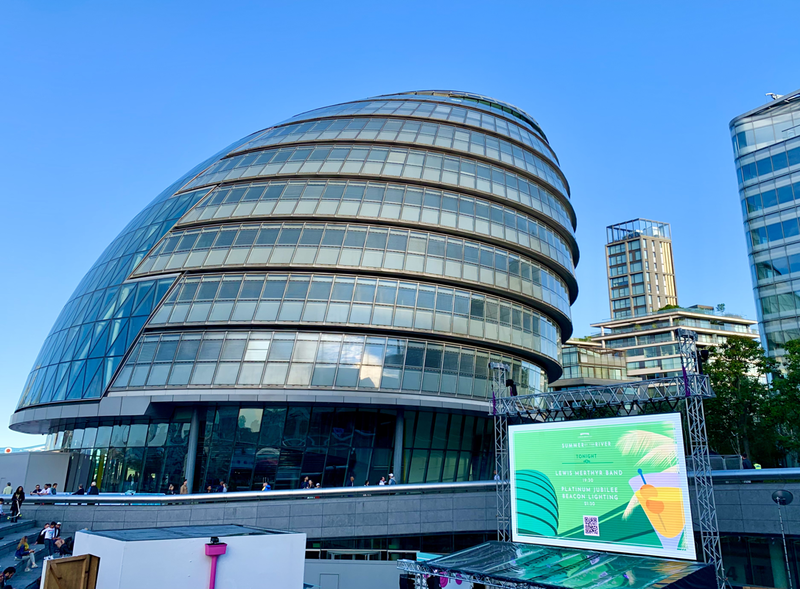 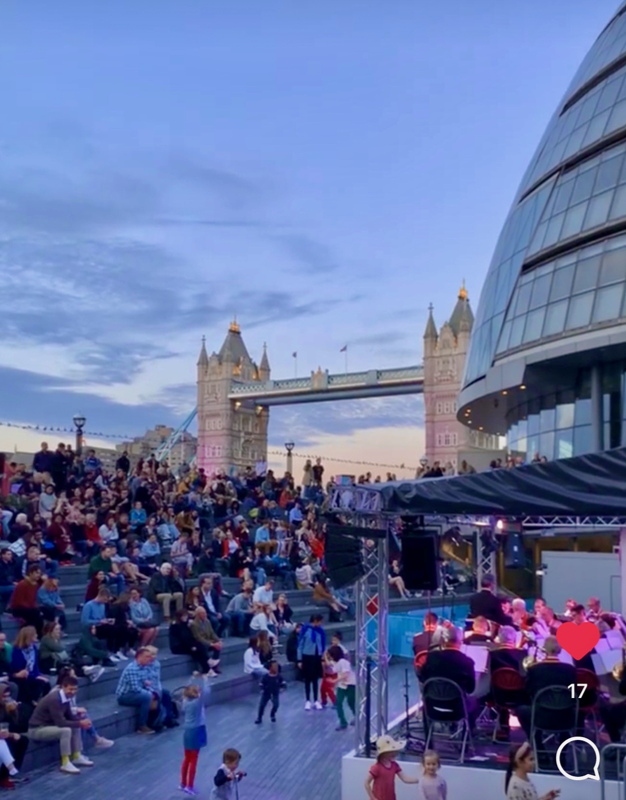 It was a genuine delight to be involved in and support the event, and LMB offer our sincere congratulations to all the incredible projects and project leaders who received awards and due recognition for their fantastic work and achievements. On Saturday April 30th, Lewis-Merthyr Band will return to the Principality Stadium to perform at Judgement Day, the Guinness PRO12 double-header which sees Wales' four regions face off in back-to-back matches at the national stadium in Cardiff. Cardiff Blues take on the Ospreys in the first match of the day, which kicks off at 2.30pm, followed by the Newport Gwent Dragons' clash with the Scarlets at 5pm. 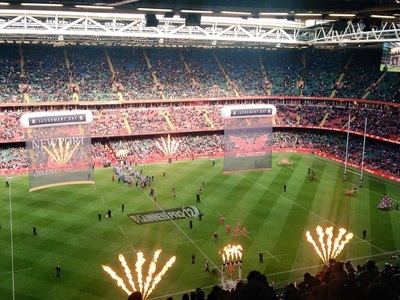 Last year saw a record Welsh domestic rugby attendance of over 55,000 descend on the capital in April 2015, paying just £10 per head. 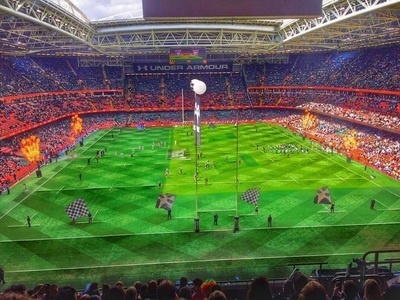 "The aspiration for Judgement Day has always been to fill the stadium to its rafters," said WRU Chairman Gareth Davies. 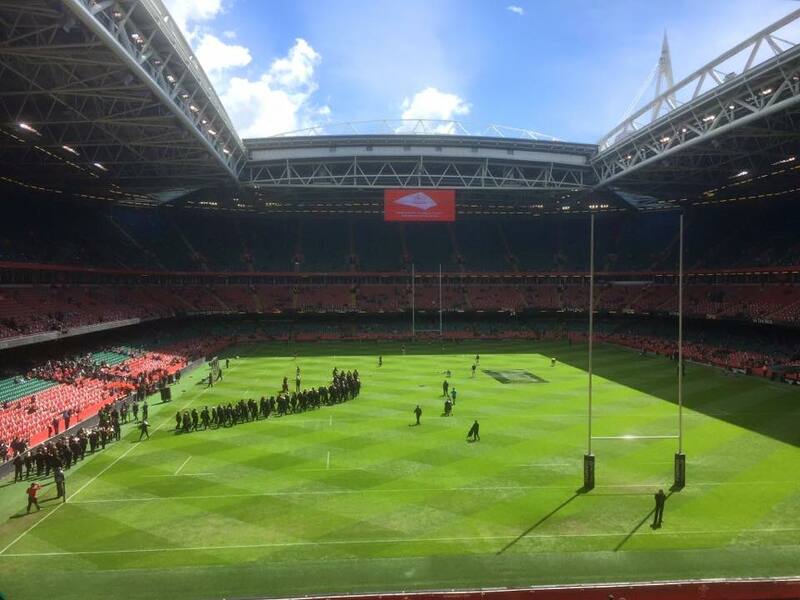 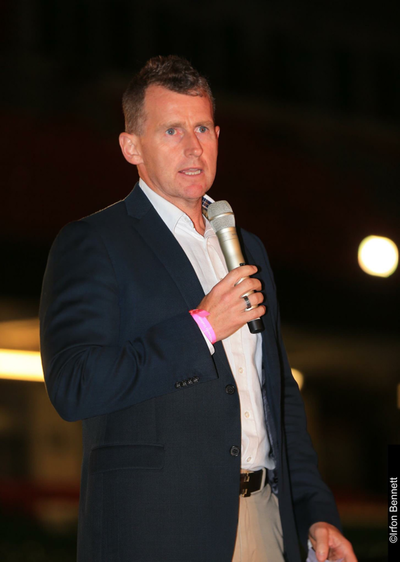 "We achieved a record crowd figure for domestic rugby in Wales last year, but there is no reason to stop there. 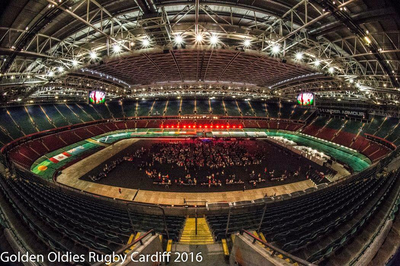 We have set ourselves the target of a sell-out in 2016, it's a bold statement but one that Welsh Pro Rugby and the Guinness PRO12 is more than equal to. 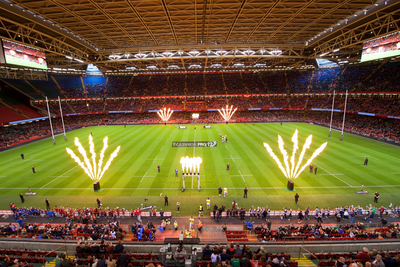 At just £10 per head, fans can see the very best that Welsh rugby has to offer go head to head in regional colours in the grand surrounds of our national stadium". 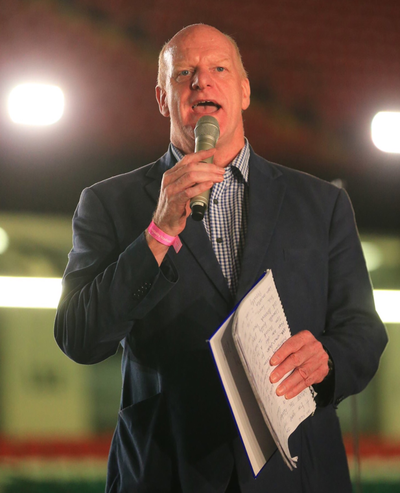 Mark Davies, Chief Executive of Pro Rugby Wales, which represents the four professional teams Ospreys, Scarlets, Newport Gwent Dragons and Cardiff Blues, said: "Saturday 30th April 2016 is a date every supporter of Welsh rugby should book into the calendar now, as we look ahead with excitement to another huge double derby at the national stadium after such a positive day for Welsh professional rugby as a whole at Judgement Day this year". BBC Wales Head of Sport Geoff Williams: "Judgement Day has become one of the highlights of the Guinness PRO12 season on Scrum V Live and Clwb Rygbi. It represents a key milestone in the season because of the jeopardy and extra spice involving tournament semi-final places and European qualification. 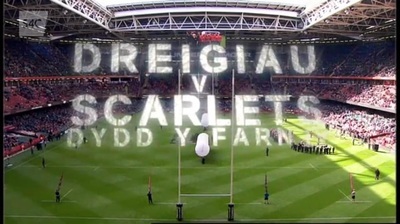 We're looking forward to another great afternoon of PRO12 derbies." 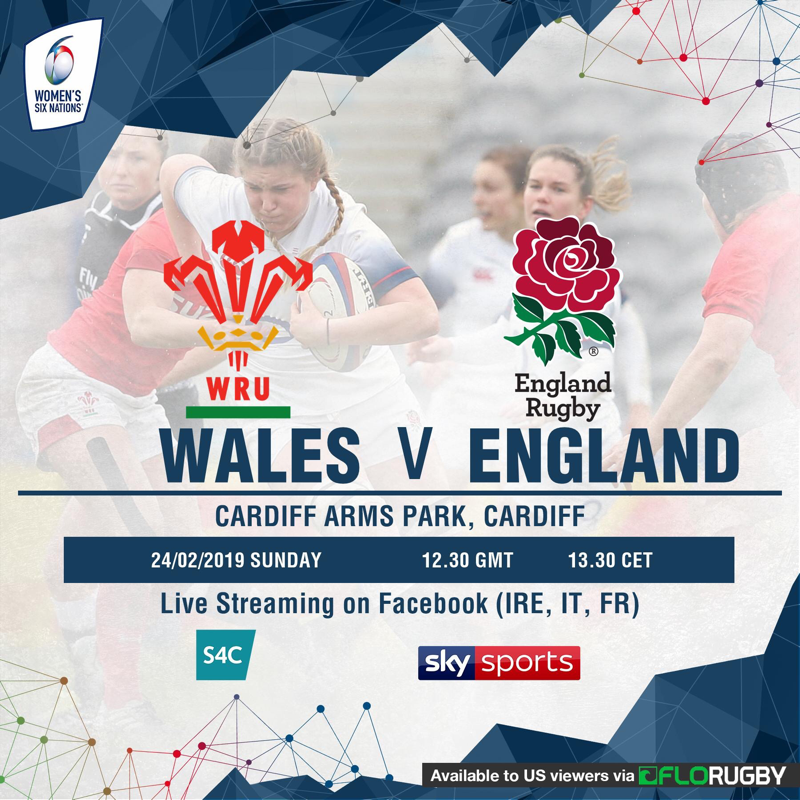 Tickets can be purchased now at £10 per person, online from www.wru.wales/tickets by telephone from 0844 847 1881, in person from the WRU Ticket Office on Westgate Street, Cardiff or from each of the four regions. Both matches will be shown live on television with BBC Wales showing the first match and S4C the second. Lewis-Merthyr Band recently enjoyed a very successful Brass & Voices gala concert in celebration of St David's Day at the iconic Brangwyn Hall, Swansea. 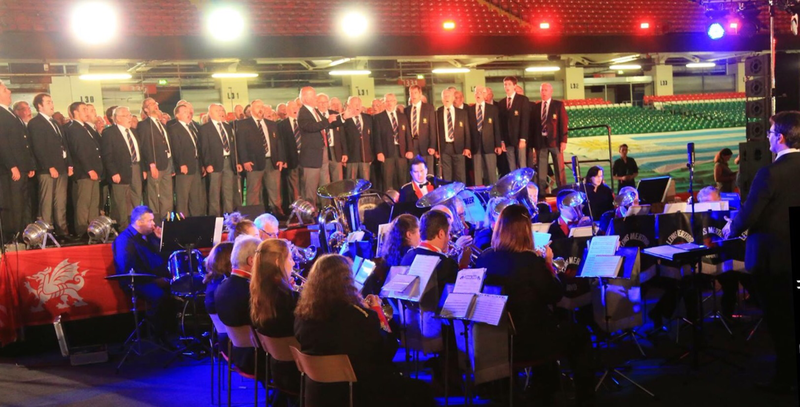 The concert featured the band together with the massed male choirs of Morriston Orpheus & Pendyrus, under the direction of Wales' pre-eminent orchestral conductor, Owain Arwel Hughes CBE. Artistic Director of the Welsh Proms Cymru, Wales' National Classical Music Festival, Dr Arwel Hughes has held the positions of Associate Conductor at the Philharmonia Orchestra, Principal Associate Conductor of the Royal Philharmonic Orchestra, Associate Conductor at the BBC National Orchestra of Wales and Principal Conductor of the Aalborg Symphony Orchestra, Denmark to name but a few. 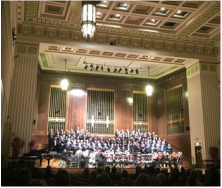 Lewis-Merthyr were delighted to work with the Welsh maestro and two of Wales' pre-eminent choirs and look forward to returning to the Brangwyn Hall for the Welsh Regional Championships on Saturday March 19th. 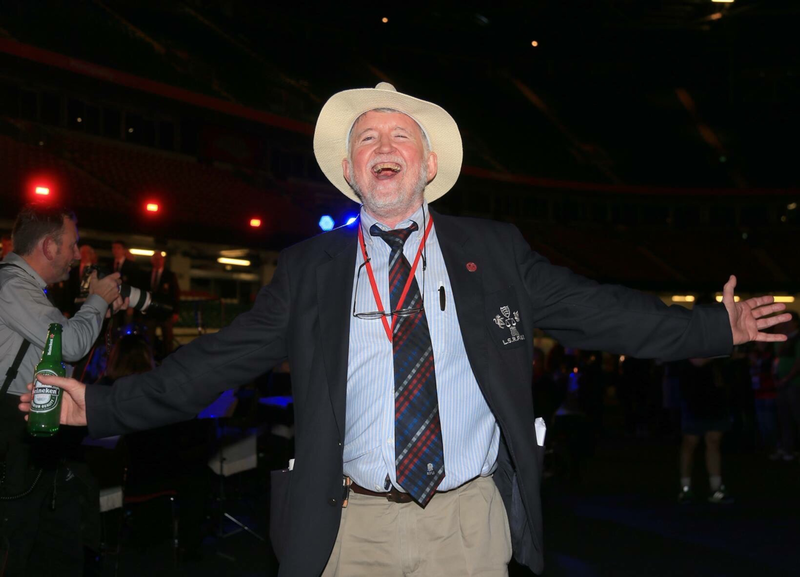 Join Owain Arwel Hughes CBE in the ultimate St David's Day celebration. 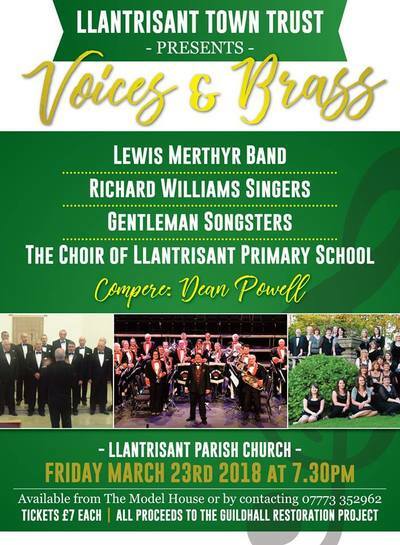 Brass & Voices, a rousing evening of the great Welsh hymns and popular anthems, featuring the massed male choirs of Rhondda's Cor Meibion Pendyrus and Swansea's own Morriston Orpheus Choir, Symphonic Brass Wales, Lewis-Merthyr Band & Côr y Cwm. 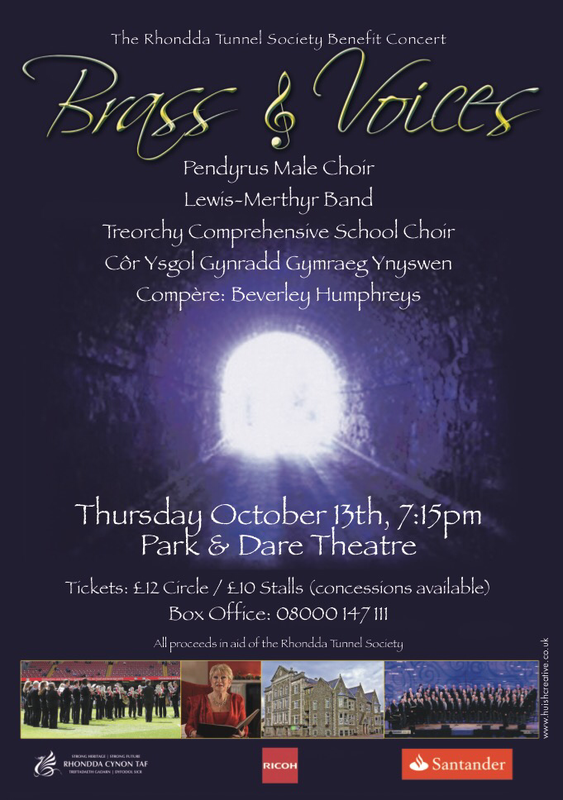 An evening not to be missed! 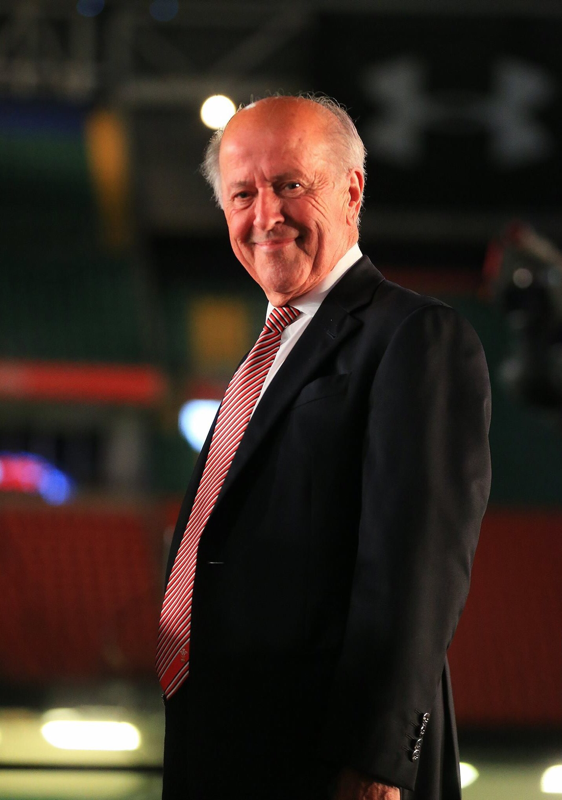 Ymunwch ag Owain Arwel Hughes CBE i ddathlu Dydd Gŵyl Dewi mewn steil gyda “Pres a Lleisiau”, noson arbennig o emynau Cymraeg a ffefrynnau traddodiadol gyda chorau meibion Orffiws Treforus ger Abertawe a Phendyrus o Gwm Rhondda, Pres Symffonig Cymru, Band Pres Lewis-Merthyr a Chôr y Cwm. 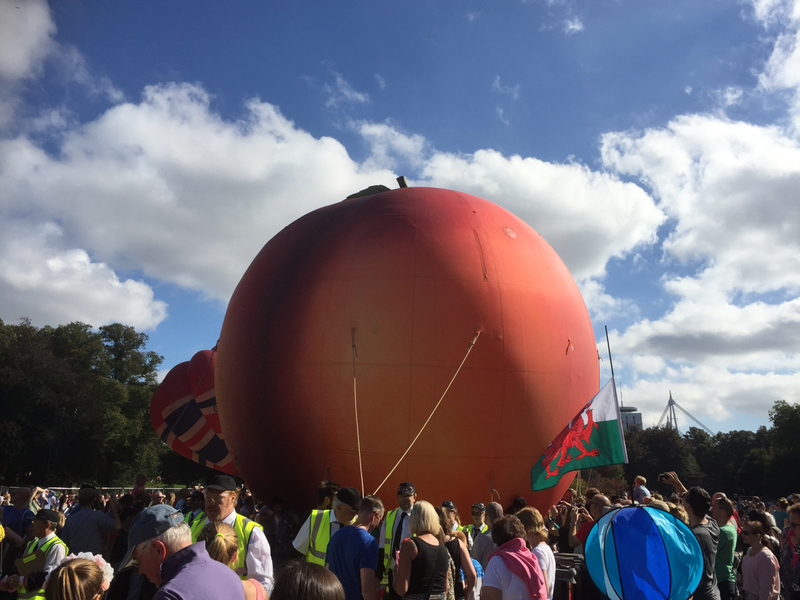 Noson i’w chofio! On Friday February 12th, Lewis-Merthyr Band was featured on national television in BBC One Wales' The River Taff. 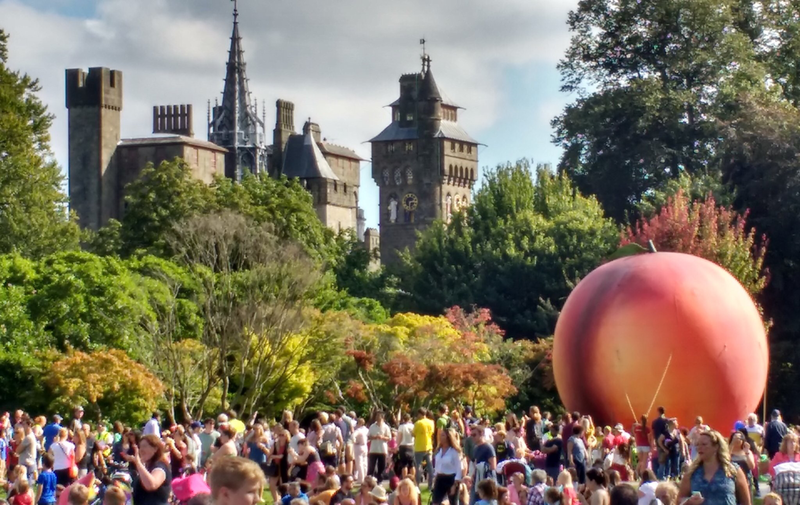 Through the three part series, writer and fisherman Will Millard travels the length of the wild River Taff in south Wales, from its source high in the stunning Brecon Beacons to the Bristol Channel. 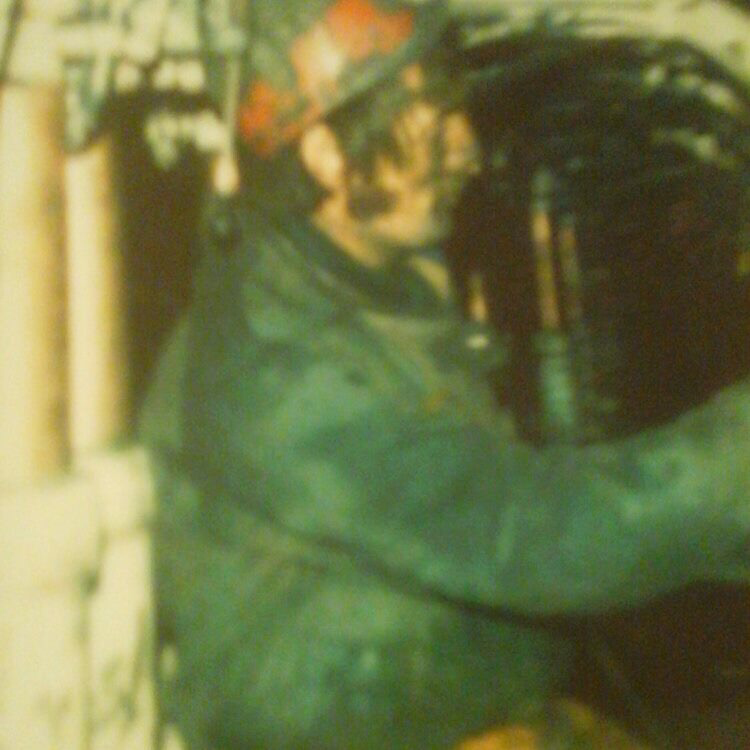 In the episode featuring the band, Will explores how the coal industry changed this beautiful landscape and its people forever. 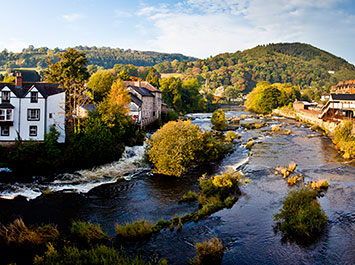 The river once ran black with coal dust, but is now one of the finest trout and salmon rivers in Wales. Will meets the members of the Lewis Merthyr Colliery Brass Band and fishes for grayling with a former miner who is now a champion fly-fisherman. 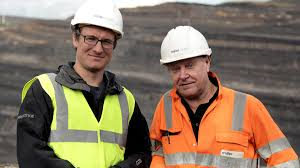 He visits one of Britain's biggest open-cast coal mines and sees how this spectacular landscape is being reclaimed after centuries of mining. 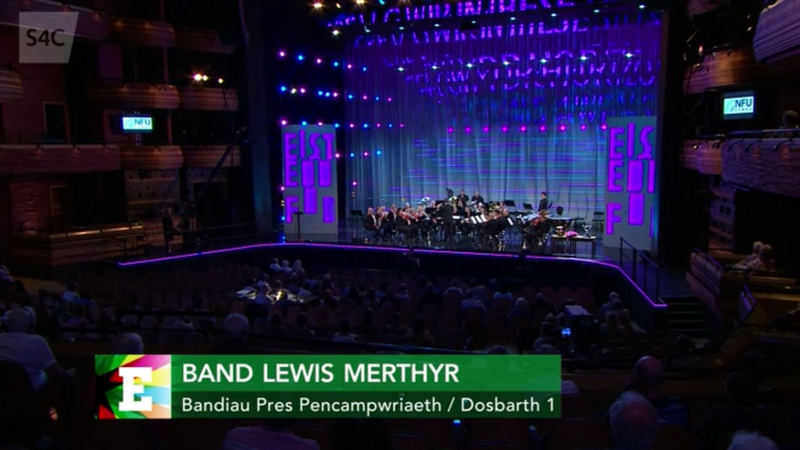 Building upon the successes of the past year, Lewis-Merthyr are now looking forward to a very exciting calender throughout the coming months, beginning with a recording session for S4C's Band Cymru competition with Rondo Media in early February, which will be swiftly followed by the band's appearance at the Welsh Open Entertainments Championships held at the Grand Pavilion, Porthcawl. 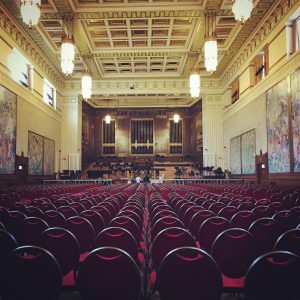 Lewis-Merthyr will then round off the first quarter of the year, returning to the Brangwyn Hall to compete in the annual Welsh Regional Championships on Saturday March 19th. 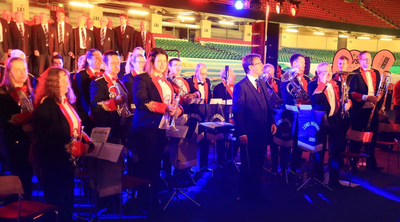 Lewis-Merthyr Band are delighted to be named joint Runner Up in the First Section of the 2015 Welsh League Championships following their Third Prize placing at the recent SEWBBA Championships held at the Leisure Centre, Merthyr Tydfil. 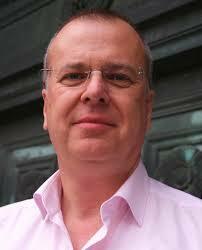 Chairman Paul Williams stated he was "delighted" with the result. 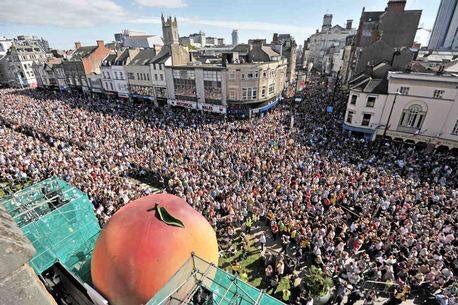 "I never thought in June that the band could have achieved this position, particularly in such a short space of time. 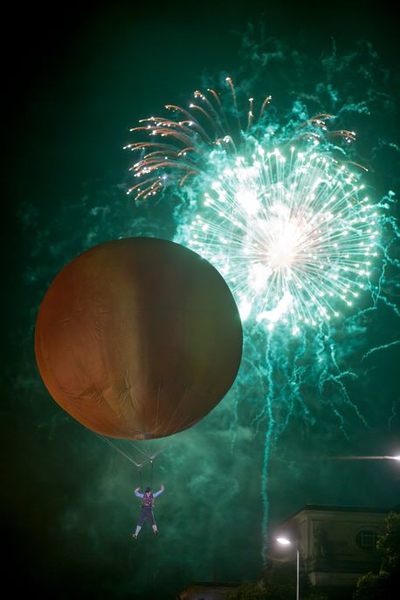 Roll on 2016!" 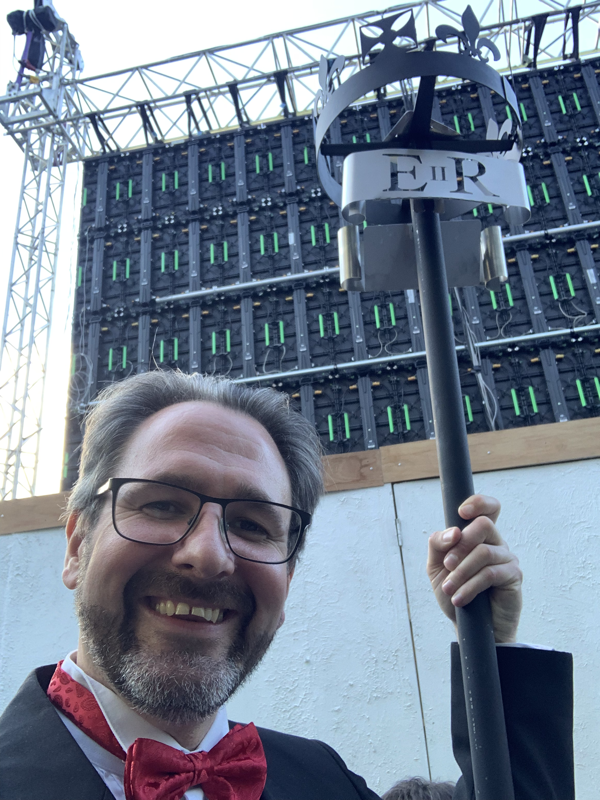 while Musical Director, Craig Roberts offered "Huge thanks and congratulations to all members, new and longstanding, for all your achievements these past months". Lewis-Merthyr Band now look forward to a series of festive engagements through December, including performances within the local community of Porth, Rhondda and the Paget Rooms, Penarth. 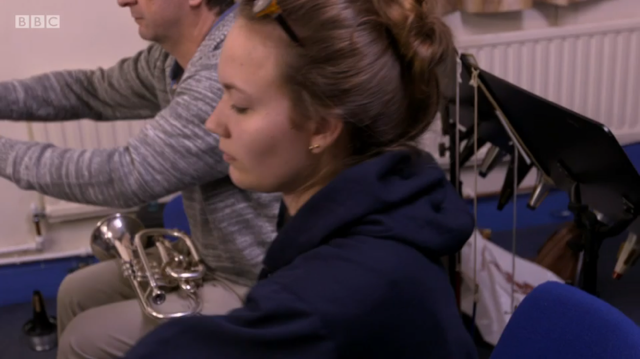 Thereafter the band has a busy start to 2016, beginning with a recording session for BBC Radio Cymru for the S4C Band Cymru competition in January, and the Welsh Open Entertainments Championships at the Grand Pavilion, Porthcawl in February. 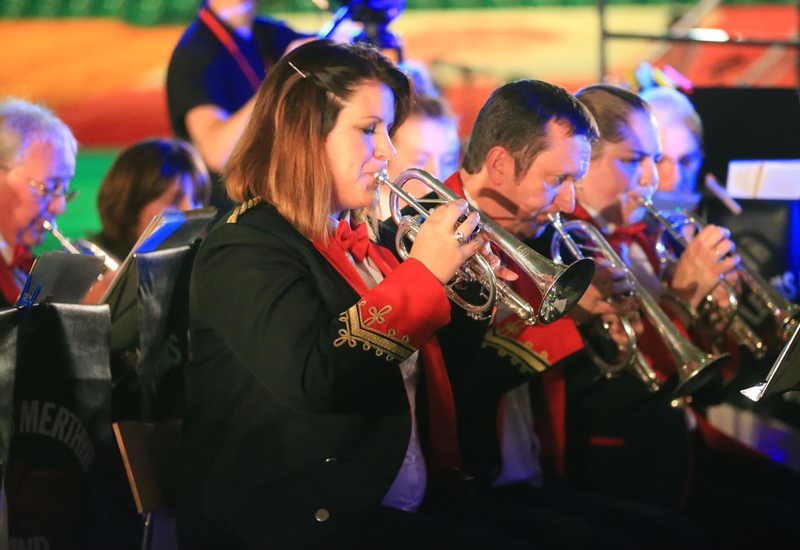 Lewis-Merthyr Band were delighted to be awarded 2nd Prize in the First Section of the recent West Wales Brass Band Championships at Burry Port. 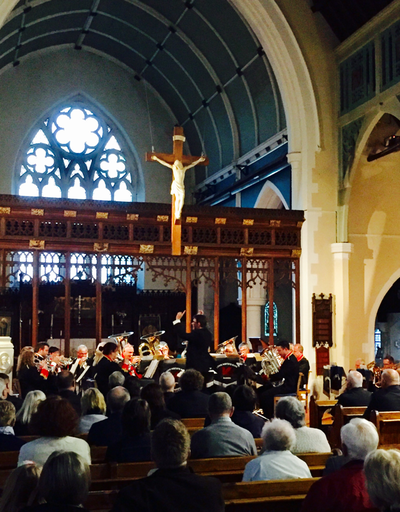 The band's performance of Kenneth Downie's "Purcell Variations" saw Lewis-Merthyr come a close second to our good friends at Markham & District, who performed George Bailey's classic "Diadem of Gold". 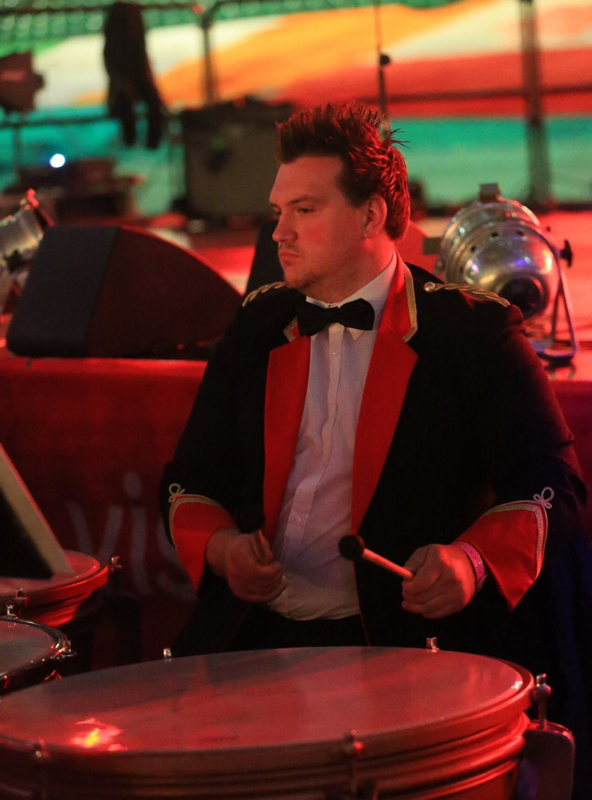 Both performances were conducted by Lewis-Merthyr Musical Director Craig Roberts, making it both first and second prize placings for the MD. 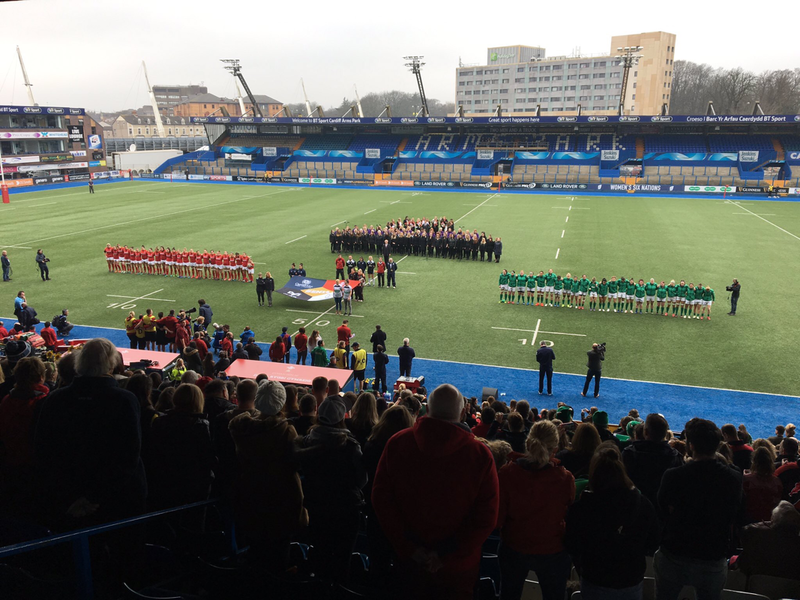 Lewis-Merthyr Chairman, Paul Williams stated: "It's a incredible achievement for the band to be awarded Second Prize in the First Section of the championships, and a huge credit to the new team of players, and all who have worked so hard behind the scenes throughout recent weeks. 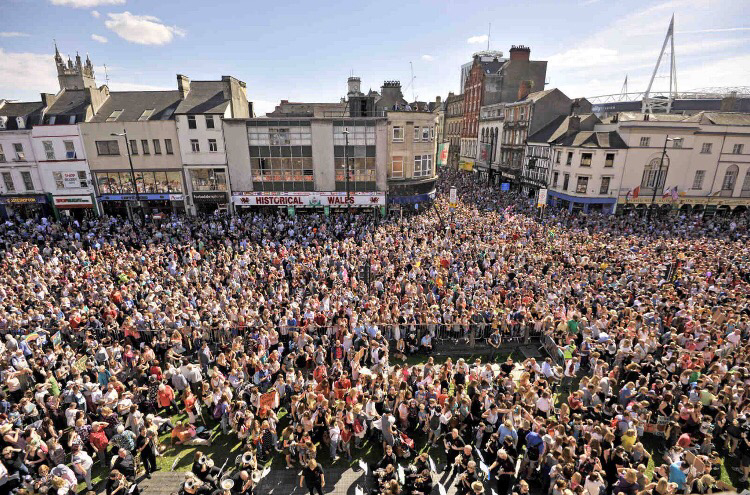 We now look forward to a bright future ahead for the band". 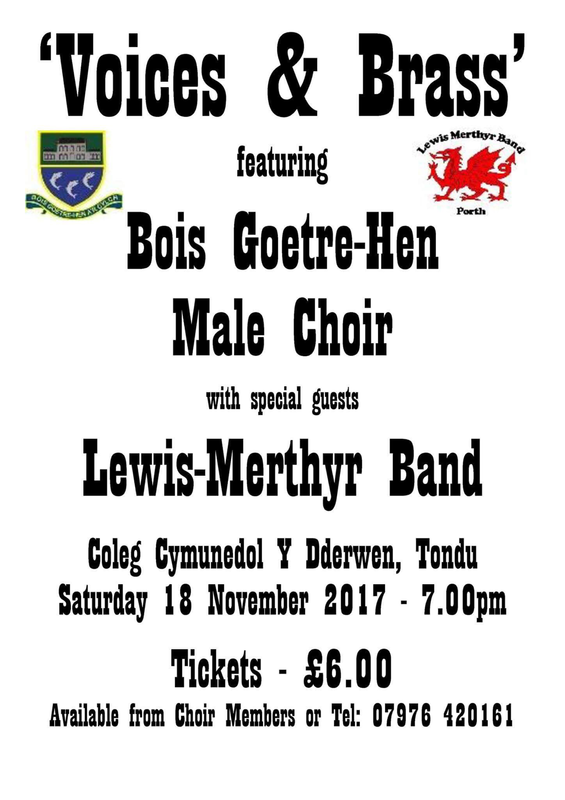 Lewis-Merthyr now look forward to their next contest performance at the SEWBBA Championship in Merthyr Tydfil on Saturday November 21 and additional engagements with the Jugendsinfonieorchester Ravensburg of Germany and Porth County Community School Choir. 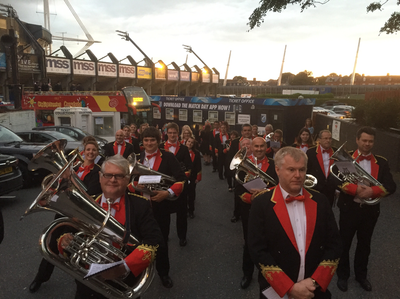 On Saturday September 5th, the Lewis-Merthyr Band performed to their largest ever audience at the Millennium Stadium, Cardiff. 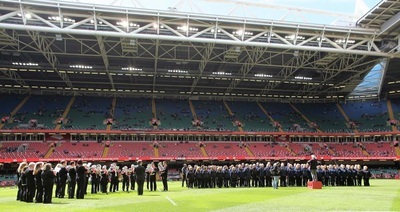 Performing together with the 130 piece mixed WRU massed choir, under the baton of Dr Haydn James, the band performed a selection of popular favourites, including Sanctus, Rachie (i bob un sydd ffyddlon), We’ll Keep A Welcome, Calon Lan, Sospan Fach, Hey Jude, Speed Your Journey (Va Pensiero), Yma o Hyd, and - of course - Cwm Rhondda. 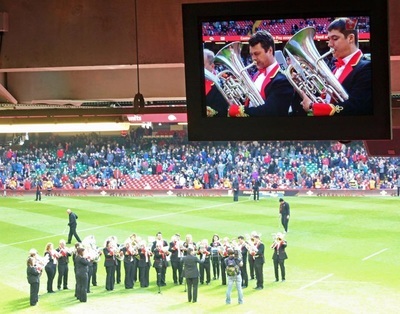 The band also performed the Italian and Welsh national anthems, to the accompaniment of flamethrowers, and the delight of the 52 981 fans in attendance. 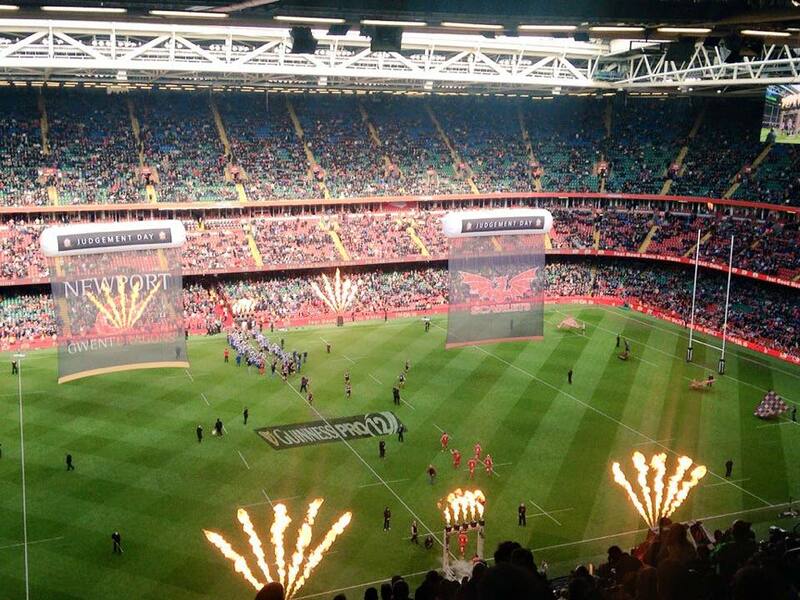 Lewis-Merthyr thoroughly enjoyed its first appearance at the national stadium and hope to return again sometime soon. 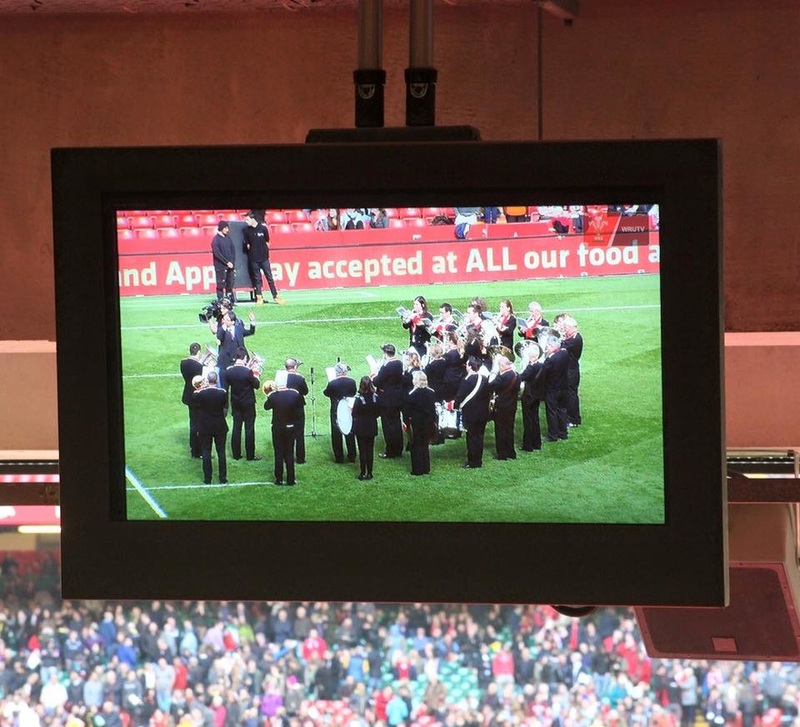 Some images of the band in performance at the stadium can be found below, with some additional amateur footage of the match available on YouTube, via the below links.